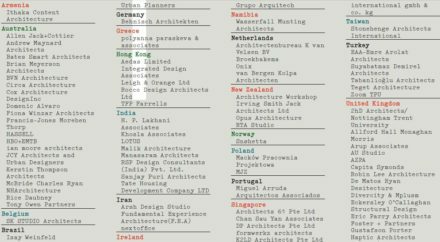 The WAF Awards celebrate architectural excellence the world over, and allow architects to showcase their talent and their unique responses to the ever-changing economic climate. 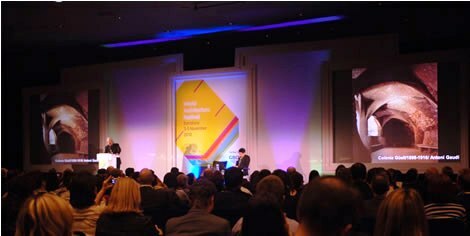 There is now an increasing need for innovative approaches to architecture, inspiring architects and designers to think in new ways about buildings. 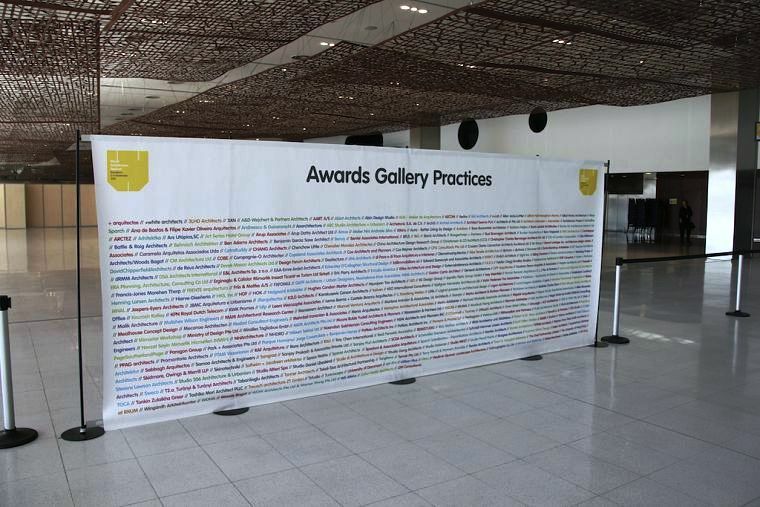 A theatre made of straw in Estonia, a soccer school in Sowetto, a tree hotel in Sweden, a bamboo office in India and a moving gallery in New York are among the 200 shortlisted projects. 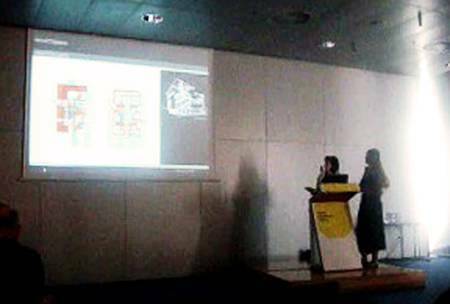 If a project is shortlisted then two individuals from the architectural practice are required to purchase tickets to attend the Festival in Barcelona and will give a 10 min presentation live in front of a jury and festival visitors. 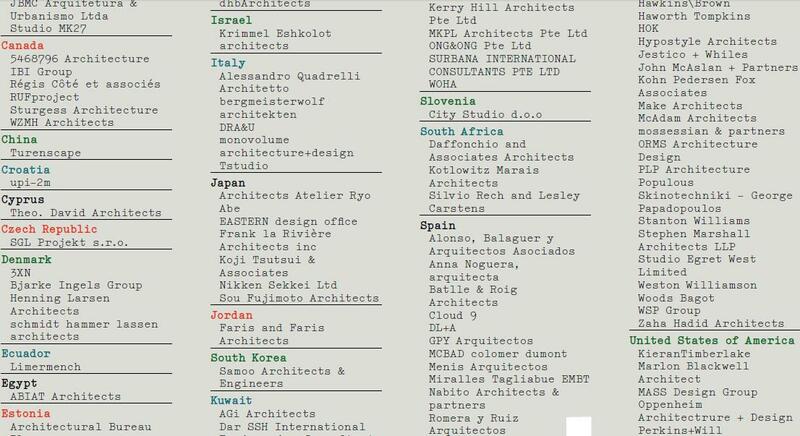 The judging panels are international and comprise architects, allied professionals, clients and critics. 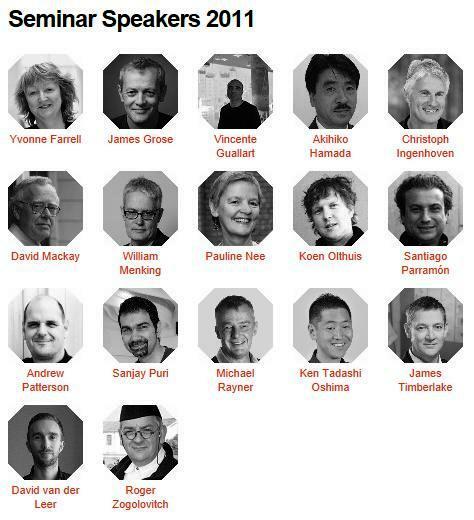 The World Architecture Festival is an opportunity for peer review by some of the most distinguished professionals in the world. 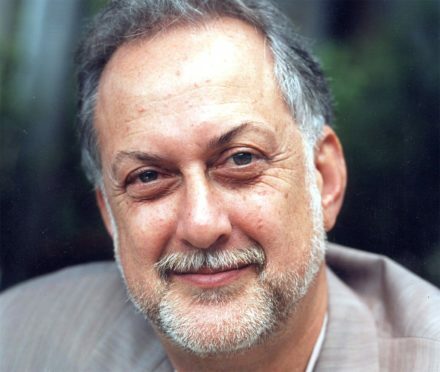 A distinguished Super Jury, headed up in 2011 by Michael Sorkin, principal of Michael Sorkin Studio New York, will unite for the Festival finale and cast their vote to decide which project will be crowned World Building of the Year 2011 in Barcelona, 2-4 November. 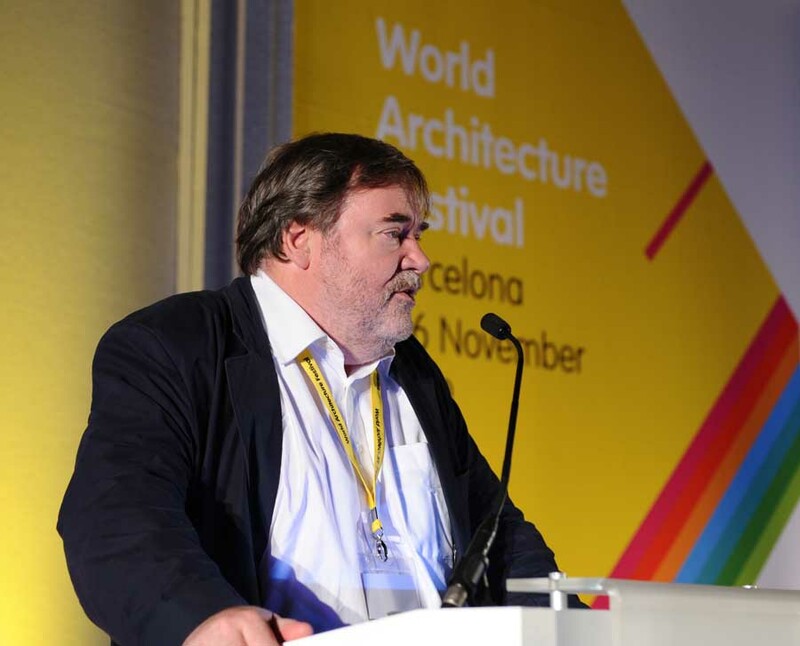 The theme for WAF 2011 is ‘Difference’ – Political, cultural, ethnic, economic, climatic and psychological differencs have a profound effect on architectural programmes, processes and outcomes. 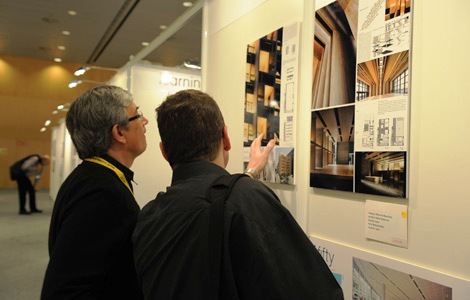 The WAF 2011 thematic exhibition and talks programme will present six case studies showing how the idea of difference has affected the way that architects have interpreted the brief and arrived at the designs which have been delivered. 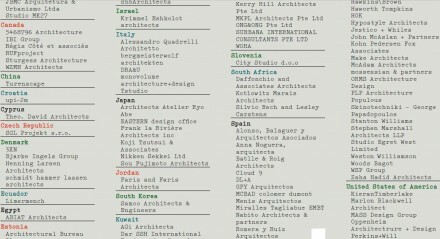 Future Projects (for designs in progress). 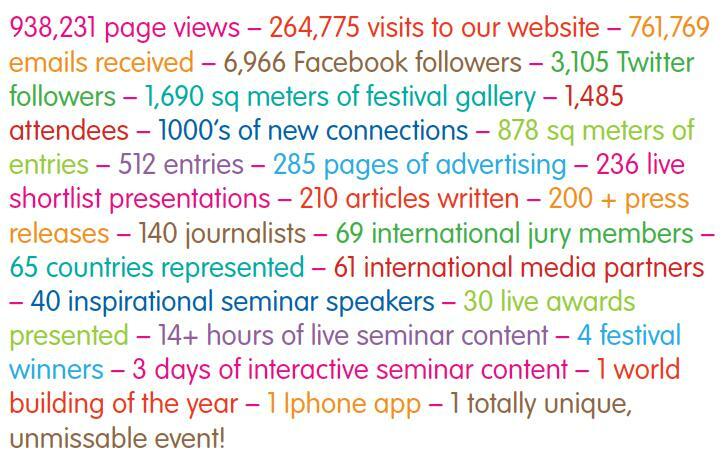 Each section includes up to 16 categories. 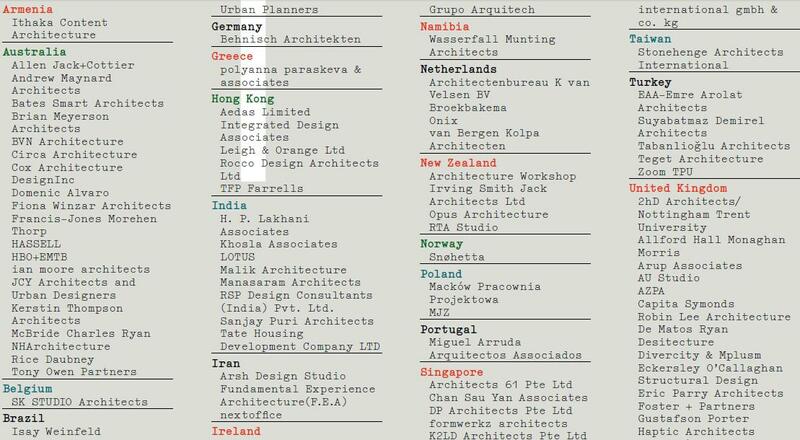 INSIDE: World Festival of Interiors will be a unique festival that celebrates the best interiors from around the globe and all WAF visitors get go for free! 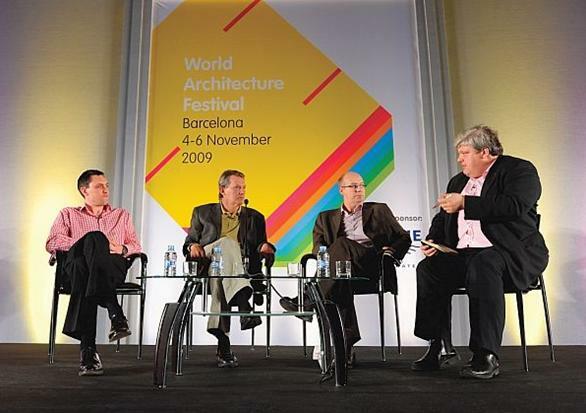 Taking place in Barcelona in November, alongside WAF 2011, INSIDE pitches the world’s greatest designers against each other in a battle to find the world’s finest interior space of the past year. 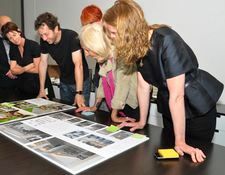 Including a series of curated events, talks and installations, INSIDE will create a buzzing hub for exchanging ideas and seeing the very latest in design, while giving visitors an instant snapshot of the vibrant interiors scene across the world. 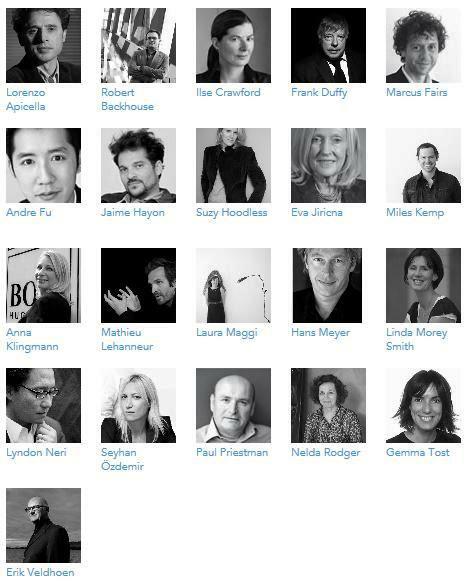 Inside is an exhilarating festival and awards programme and an important new fixture in the global design calendar. 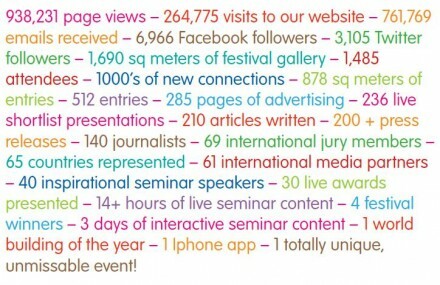 Inside will do things differently. 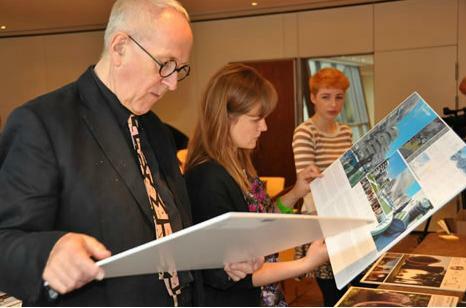 Designers will be given the opportunity to present their work live to an expert panel of judges and in front of an audience of peers, clients and press. 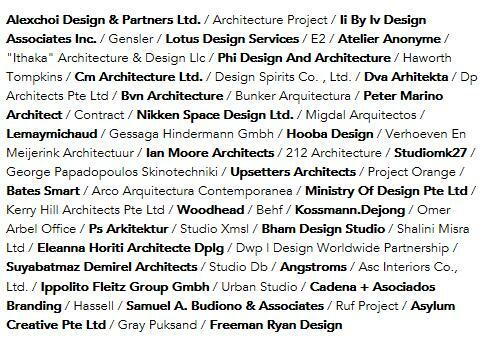 Open to interior designers and architects, finished projects can be entered into 11 diverse categories that range from restaurant and retail to hospital and transport design. 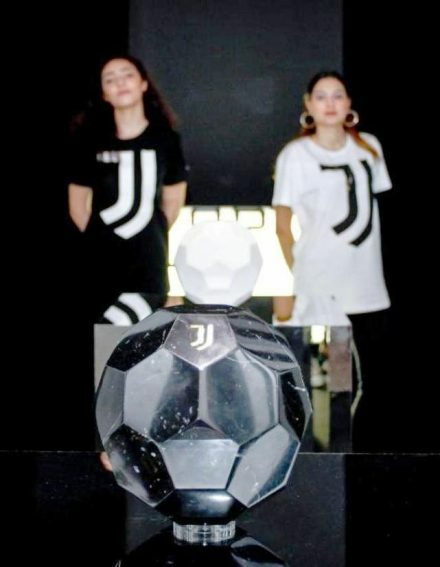 And the prize? 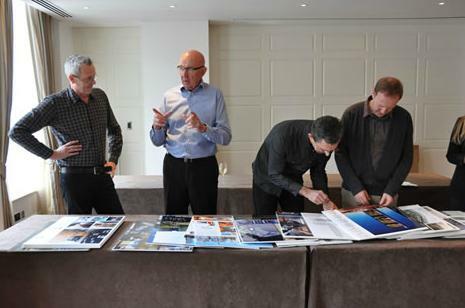 Not just the chance to win the ultimate accolade of World Interior of the Year but a unique opportunity to personally present your designs to a dream audience. 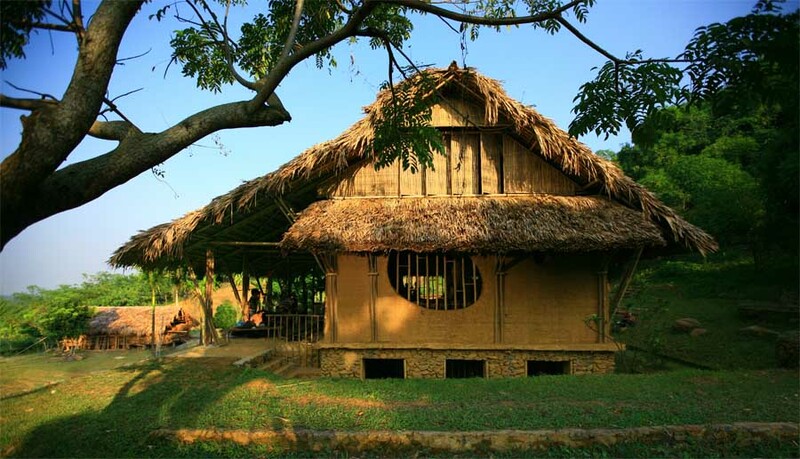 Designed to avoid storms and flash floods, this community centre is constructed out of bamboo frames and palm leaves, and offers the local community a library, kindergarten and meeting areas. 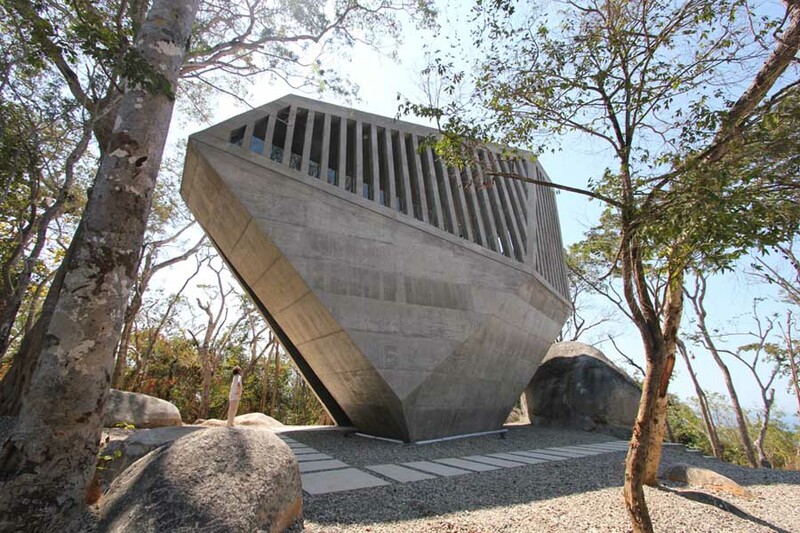 A chapel set into the Acapulco mountains with spectacular views, designed to blend in with the the surrounding granite boulders. 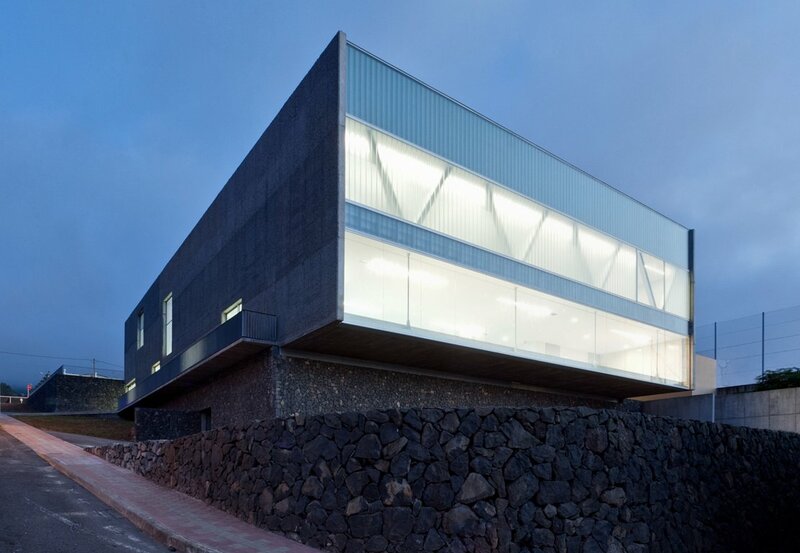 A 24 hour police station which holds 100 personnel, designed around a central top-lit atrium. 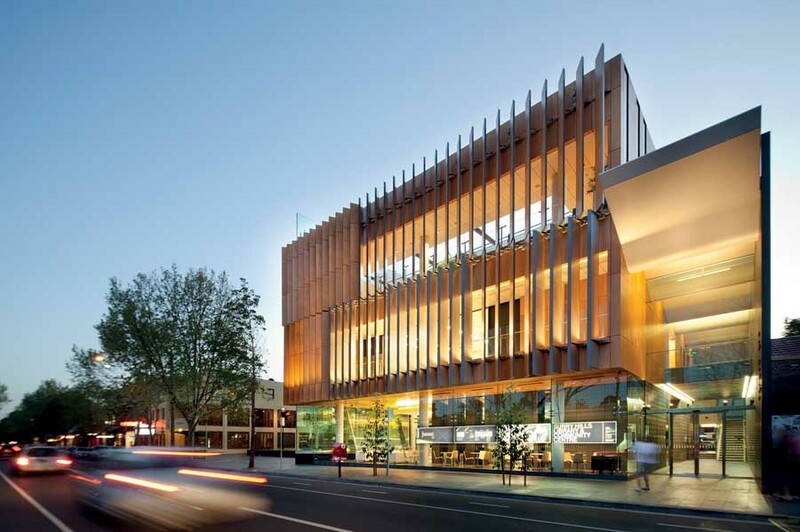 Located in an inner-city suburb, acts as a library/resource centre, community centre and childcare centre, with glass atrium and timber facade. A rehabilitation centre built on the outskirts of the desert and designed as an arrangement of rocks to fit in with the barren scenery. 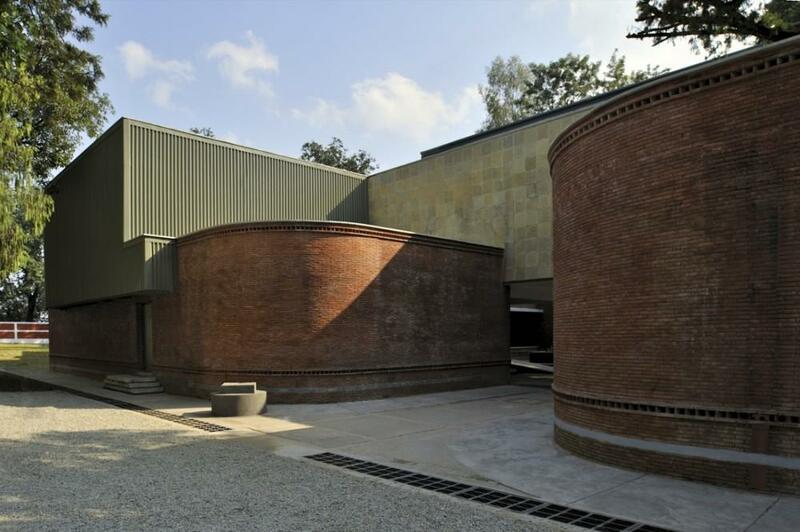 Consists of two large structures designed as ‘loops’, with a concrete and brick exterior. 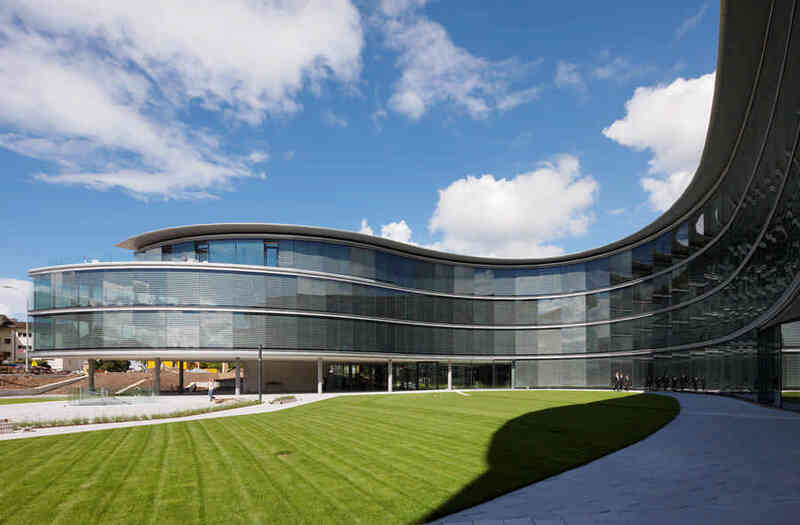 Located on the outer fringes of Wexford, this building brings together the services and departments of Wexford County council, with a glass facade and central civic forum. A concrete building with a colourful facade, built into a rocky incline in the neglected neighbourhood of El Lasso in Las Palmas. 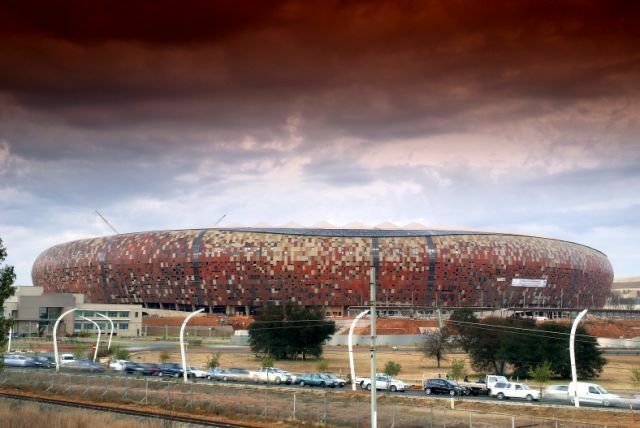 A state of the art football centre in Soweto where 1,200 teams and 20,000 footballers play each year,includes four pitches, a training gym, player lounges and education facilities. 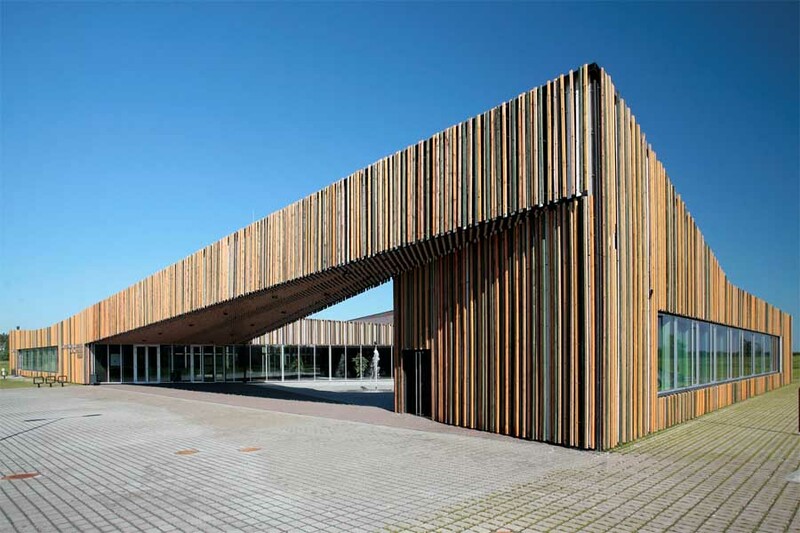 A one-storey building with striped wooden cladding which has four main functions: a local library,concert hall, day-centre for the elderly and offices for the parish government. 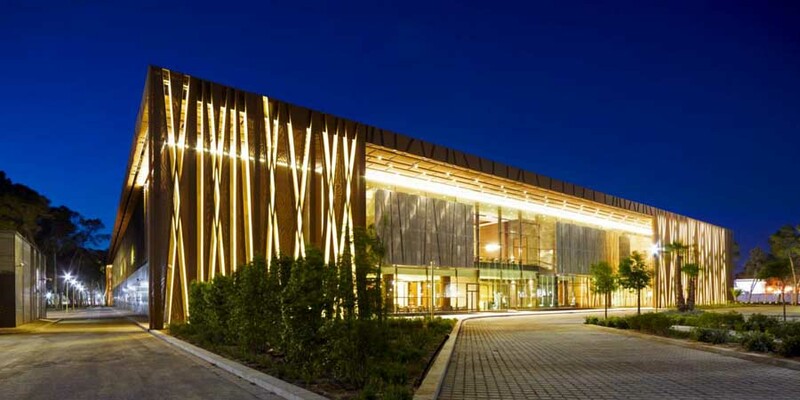 Tripoli Convention Hall, a two-storey block on the edge of a forest, is surrounded by a ‘shield’ of bronze mesh which protects the inner glass walls. 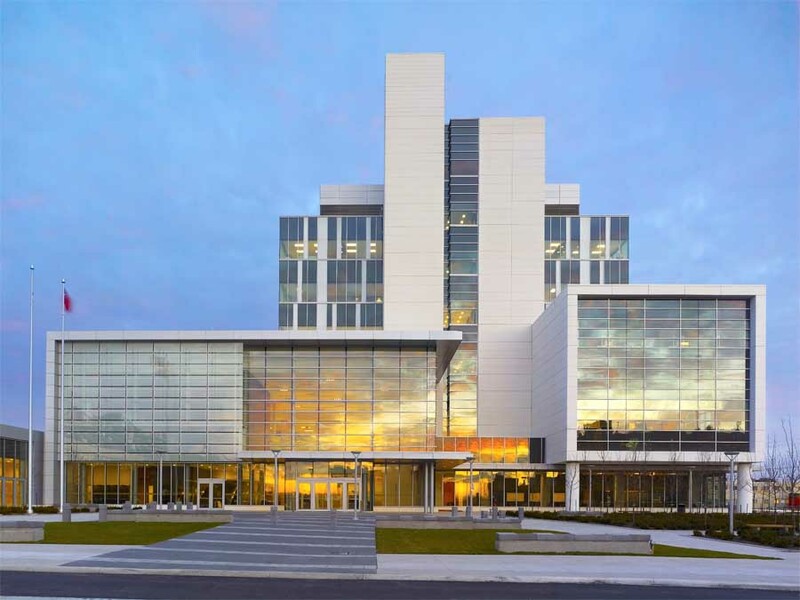 Located in downtown Oshawa, the courthouse has 33 courtrooms and facilities for holding prisoners. 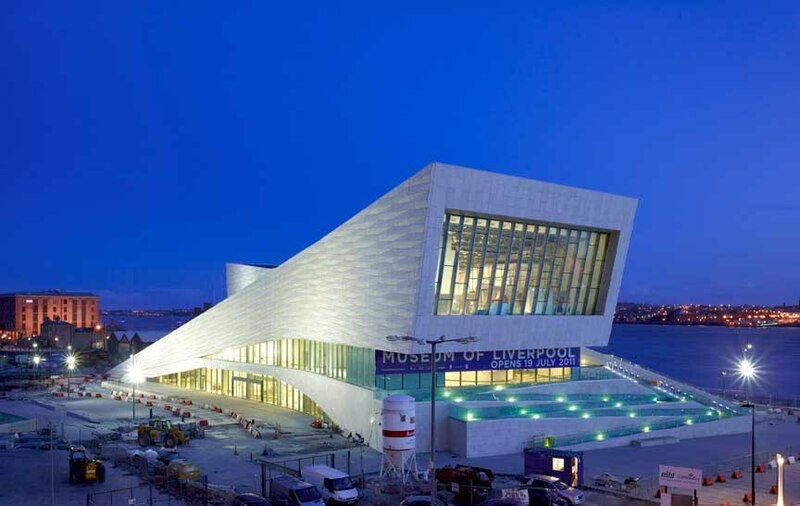 Visible from both the Mersey River and the city, the new museum of Liverpool sits on a UNESCO World Heritage Site. Two distinct and highly stylised sculptures form the outside structure, while inside a core spiral staircase connects the two buildings. 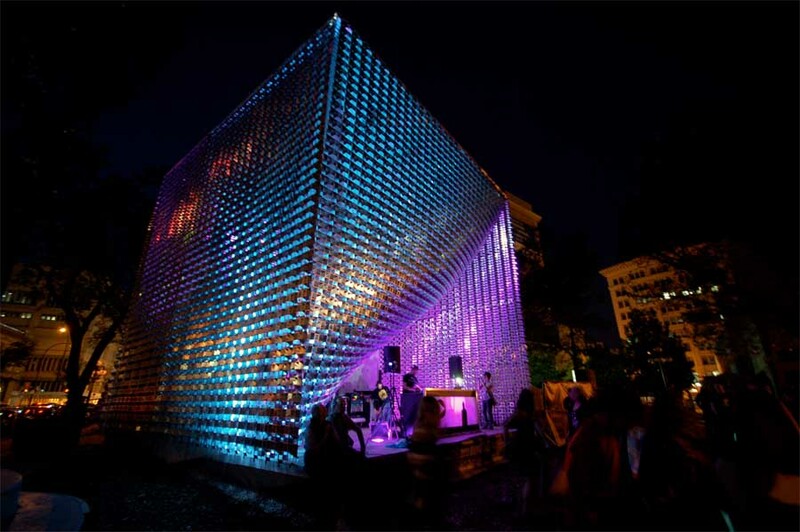 “The Cube” is an open air performance space set against a backdrop of historic warehouses in Winnipeg’s Exchange District. 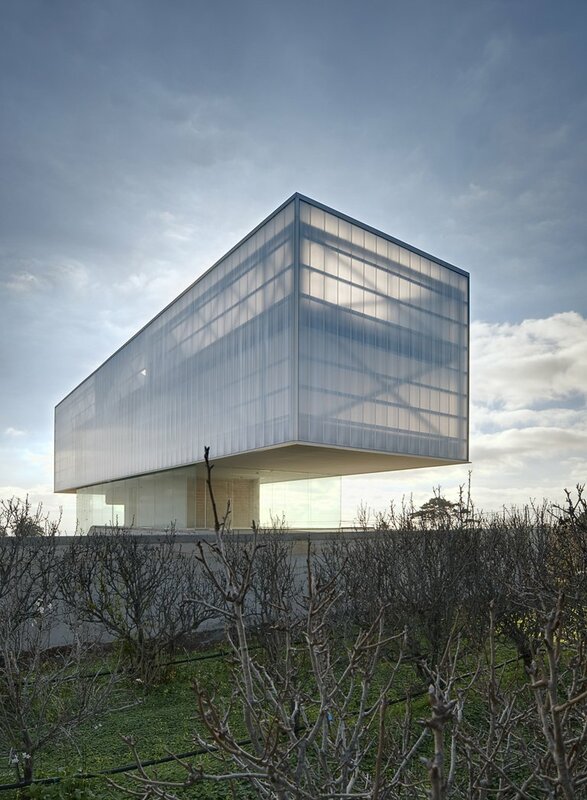 The building is made from silver mesh, and draws influence from it’s industrial surroundings. 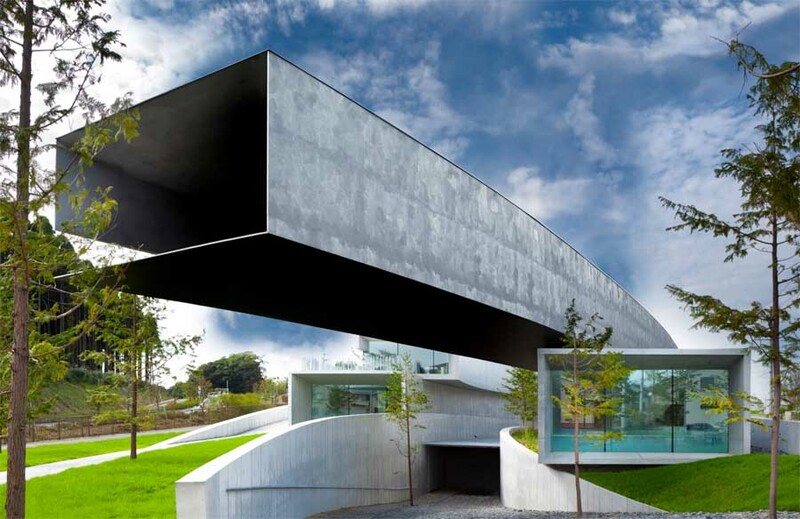 An arts centre and restaurant situated on a rural island in Western Japan. 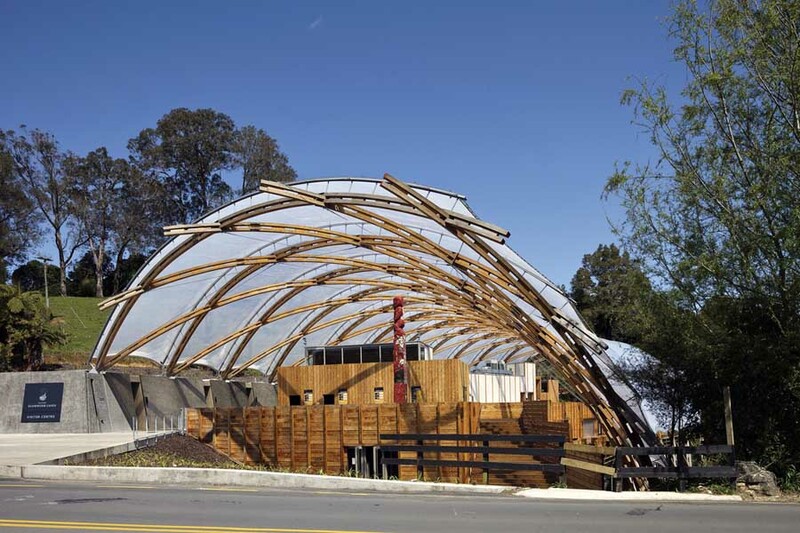 The building features an awning made of charred timber shingles, which are tied loosely to the main frame of the building to create an illusion of shimmering feathers in the wind. Sociological museum in the heart of Mexico City. 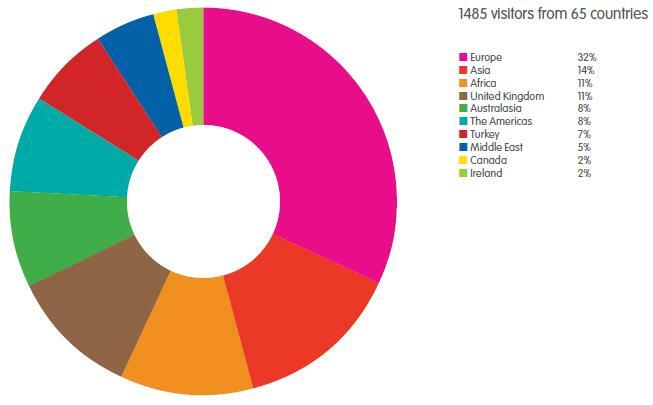 The building comprises various wings, which surround a colourful communal courtyard with an unusual water feature. 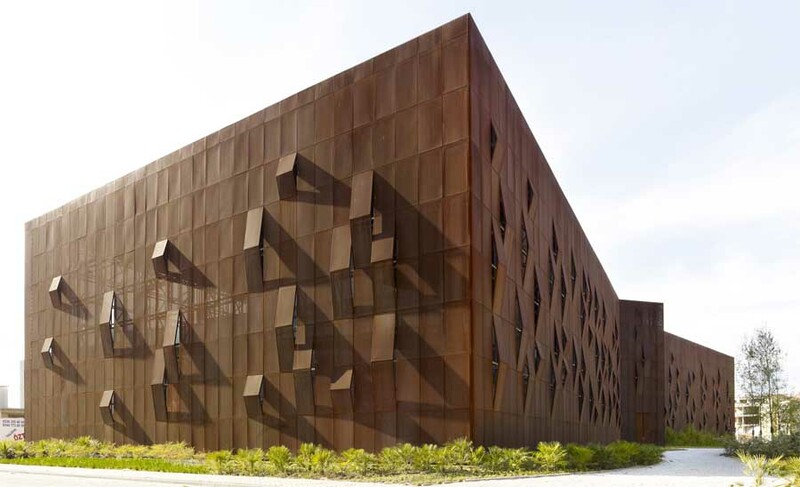 Cultural centre, whose exterior draws on the industrial heritage of the town of Yalova. 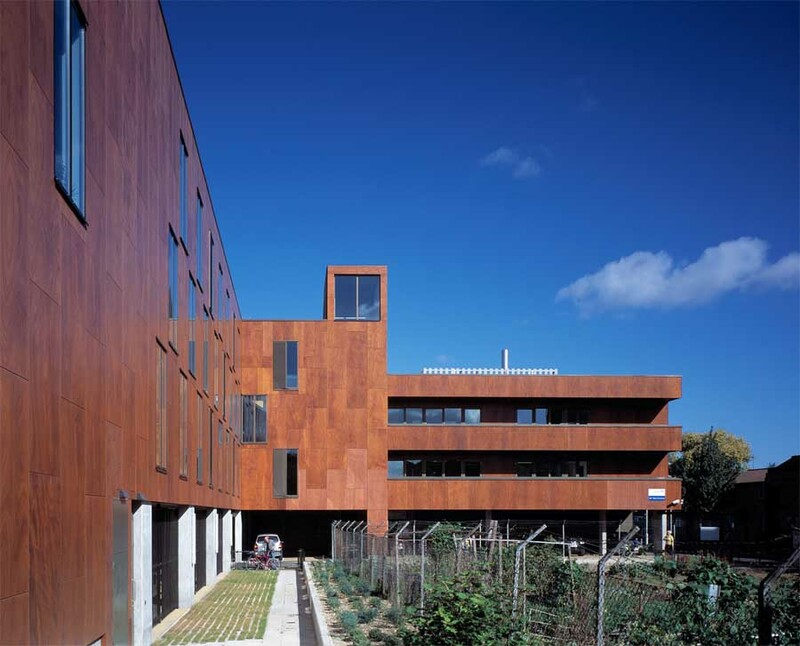 The building itself includes a woven rust coloured exterior, allowing light to stream into the building from a range of different angles. 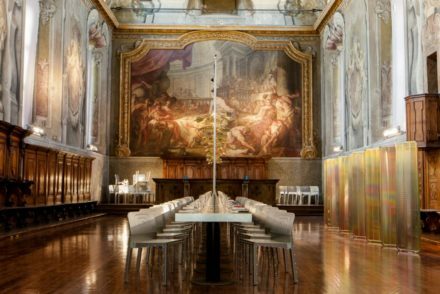 A refurbishment of an 18th century museum including the provision of new gallery spaces, archives, educational and visitor facilities. 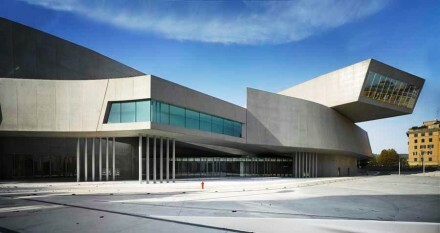 A glass base gives the museum an illusion of floating and the overall design works alongside the existing Georgian building. 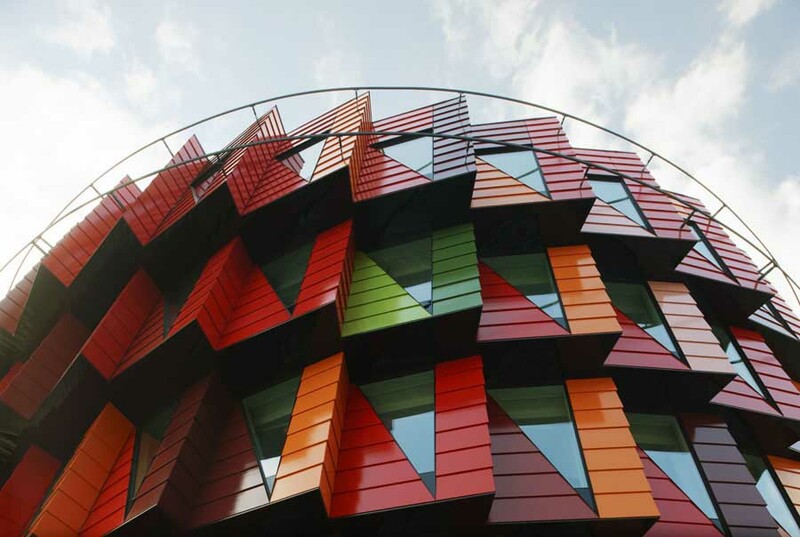 Built to celebrate the Nebuta cultural festival and attract visitors to Aomori town centre, this striking slatted building provides a visitor attraction for locals and tourists to learn about the annual Nebuta festival. 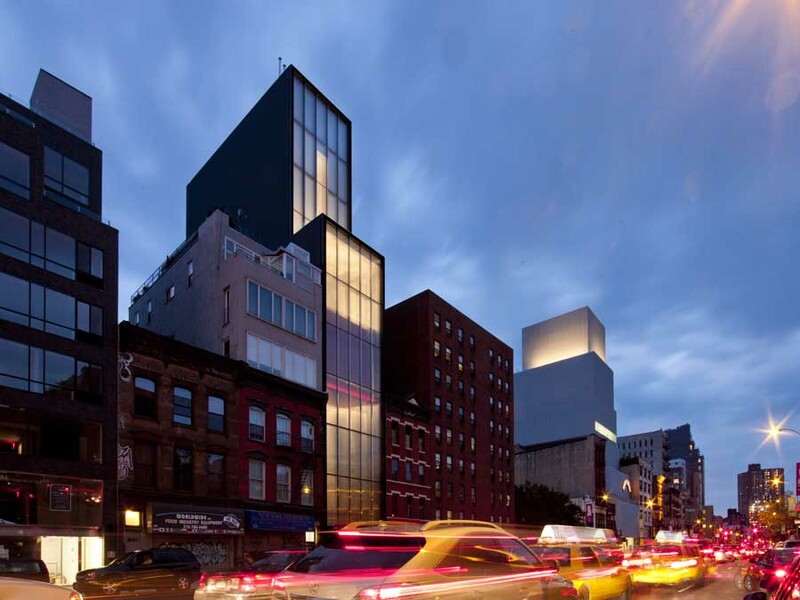 A glass fronted gallery on New York’s Lower East Side. 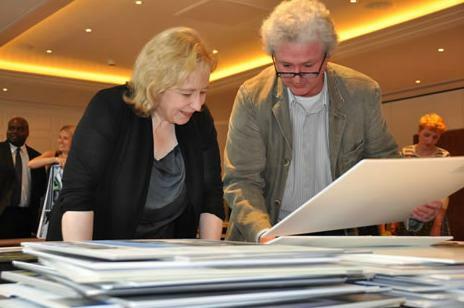 The architect has made a feature of the narrow site, creating a double height exhibition space to create a light space in which to display art. 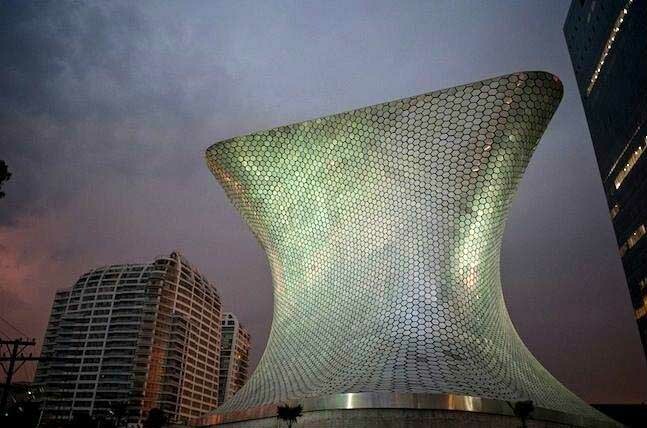 A massive new museum in the centre of Mexico City, the design involves a striking silver scale effect, reflecting the sun and giving the building a futuristic look, making it stand out in its surroundings. 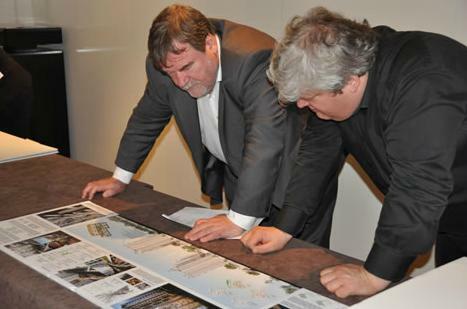 A new congress centre forms part of a masterplan for the harbour area of Reykjavik. 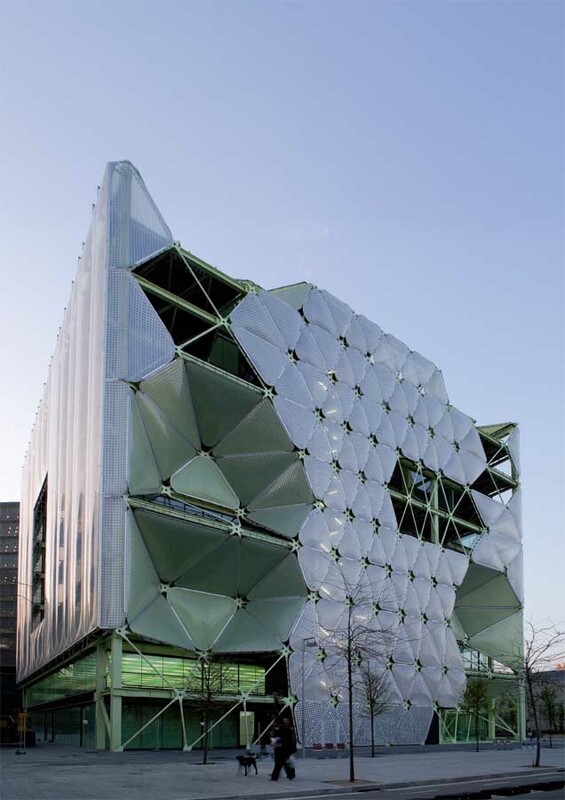 The building includes an unusual glass and steel latticed facade. 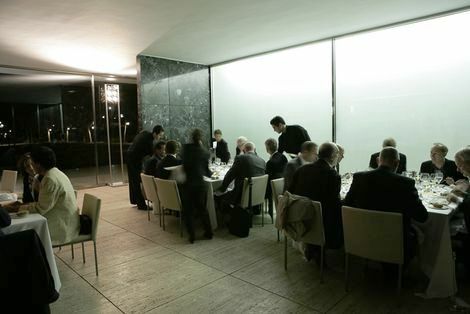 A private museum designed to exhibit and preserve the paintings and wines of its commissioner. 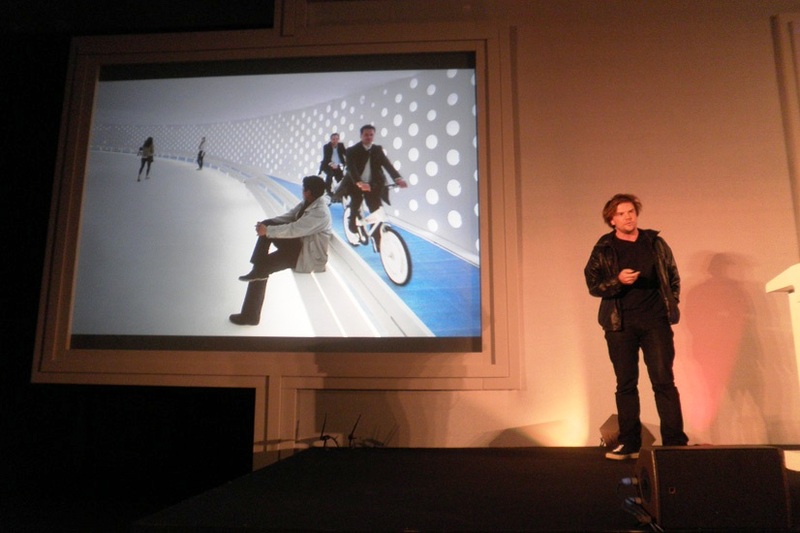 Aimed at designing a “Gallery Below Zero”, the architects have used the space above and below ground to create a futuristic concrete and metal gallery. 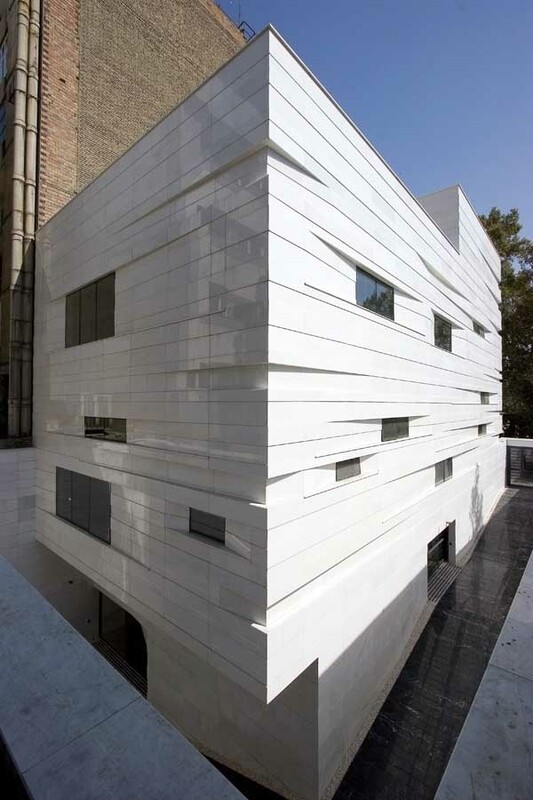 New museum in Rome which includes a roof terrace and exterior made entirely of glass. 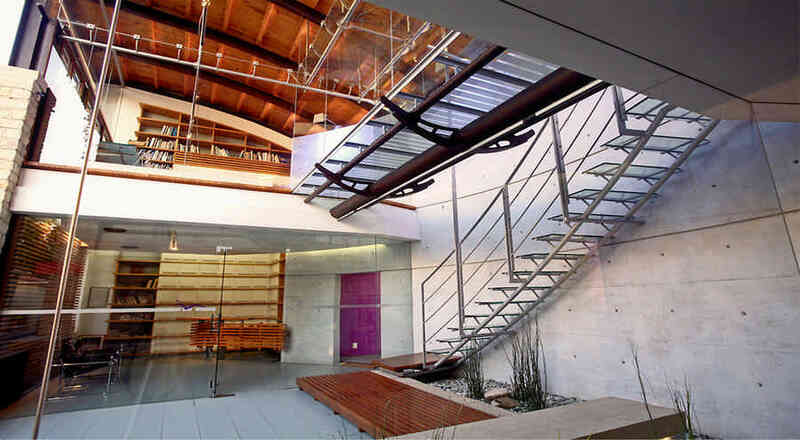 Suspended walkways allow visitors an uninterrupted view of their surroundings. 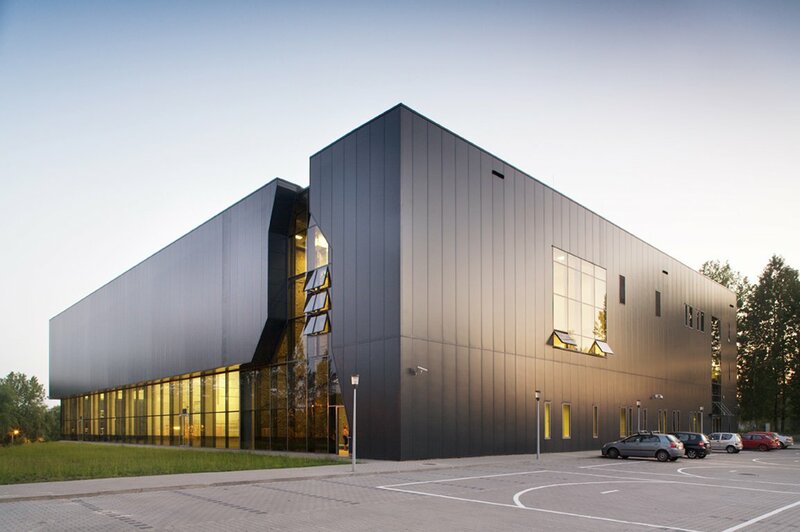 A temporary striking black theatre, which is built on top of an existing baroque bastion in the centre of Tallinn. 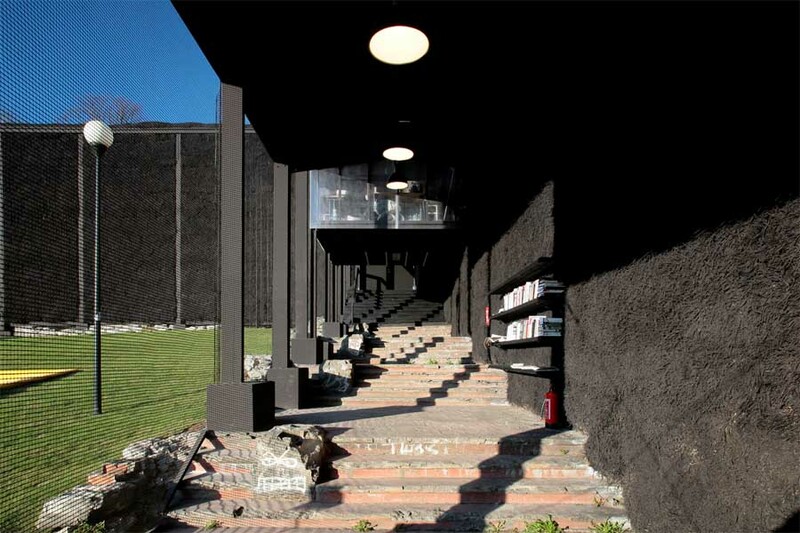 The building comprises a series of rooms which are stepped to accommodate the sloping landscape. 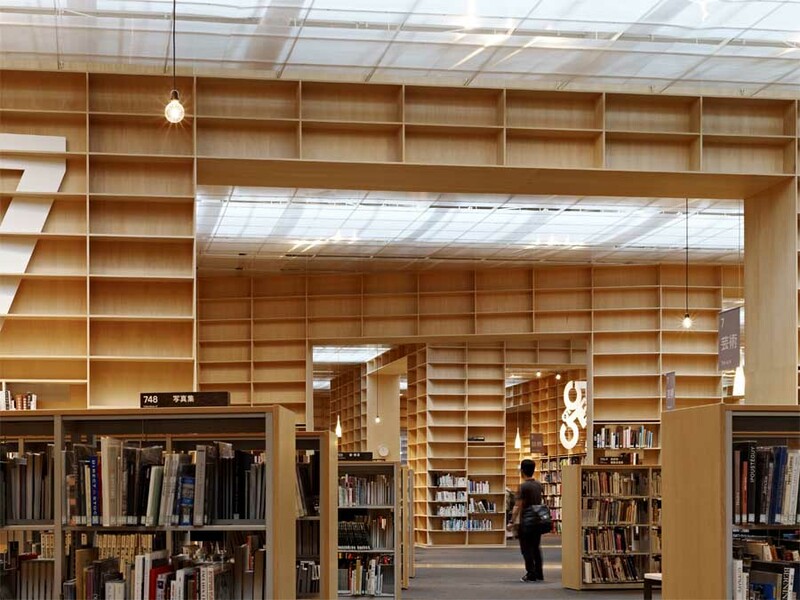 A new facility for one of the most distinguished art universities in Japan, the building comprises a library with walls are made entirely from wooden bookcases. 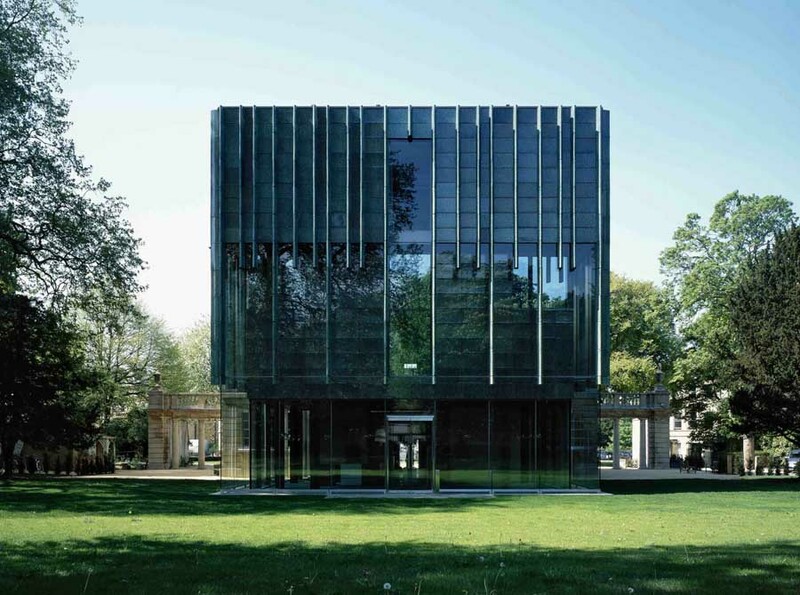 This minimal building provides archive and office space for the Rothschild Philanthropic Foundation. The design draws attention to the adjacent views over South Buckinghamshire, and the reading room includes a highly decorative vaulted timber ceiling. 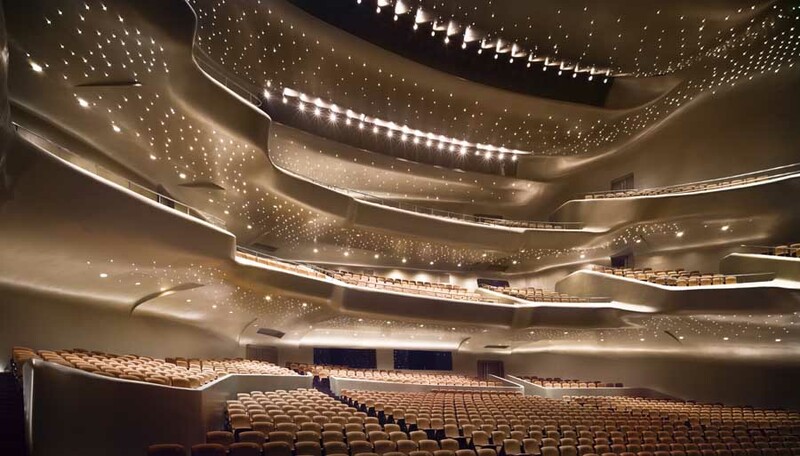 Forming the heart of Guangzhou’s cultural development, the new opera house encompasses a 1,800 seat auditorium. 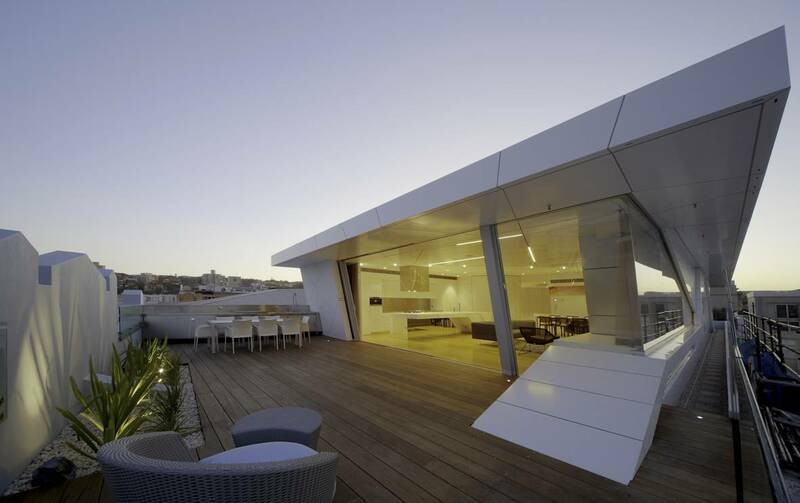 The design draws on its riverside environment, and has a glass and steel exterior. 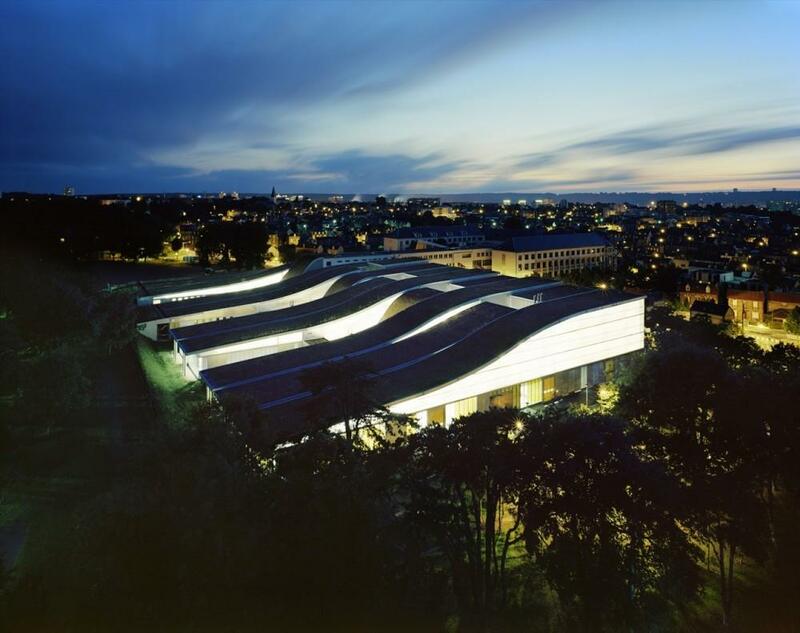 A curved white structure with a lightweight translucent envelope based in the gardens of the Museumof Modern Art. 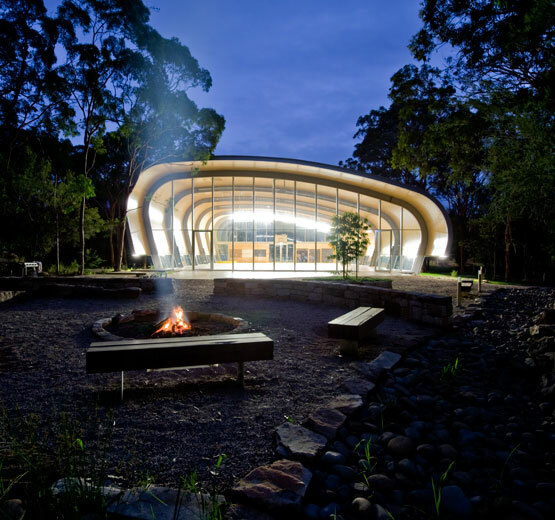 A visitors’ centre located by a stream, featuring a woven timber canopy which creates a lightweight‘sky shell’. 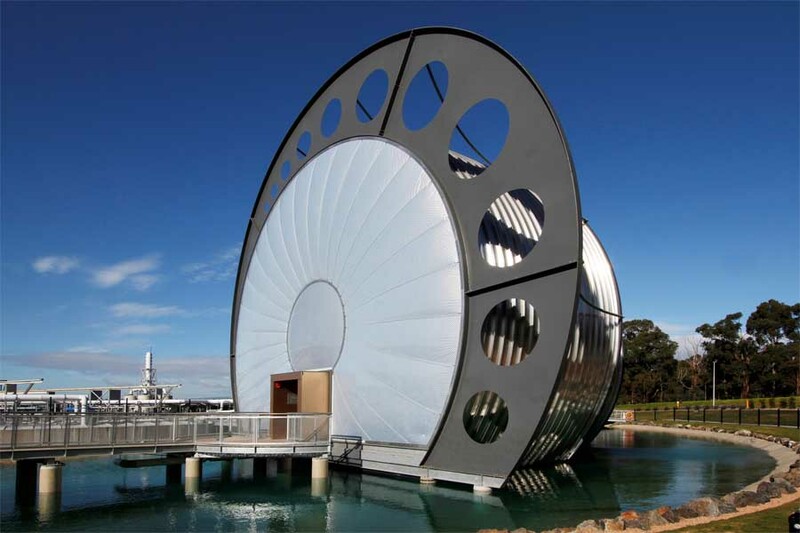 An iconic structure formed of seven silver barrels resembling a vortex, which houses the office, laboratory and educational centre for the Gippsland water factory. 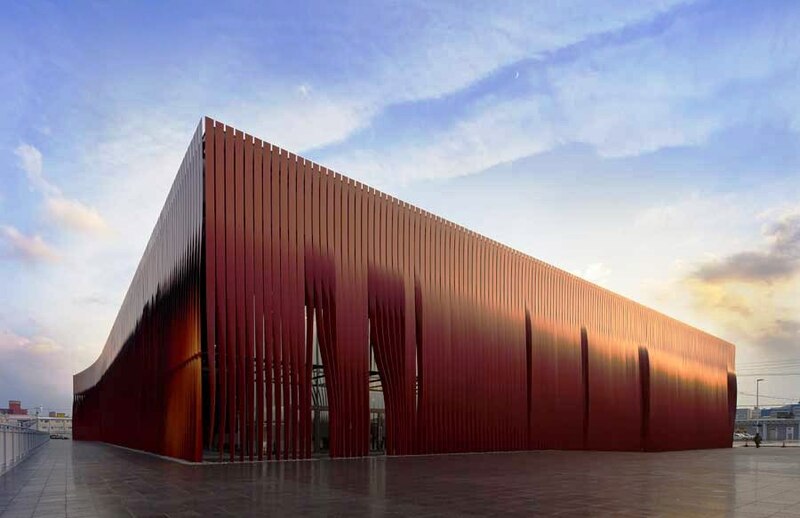 A performance hall and home for the Nebuta festival and its floats, with a unique exterior consisting of 820 red steel ribbons which are individually twisted to create a curtain-like effect. 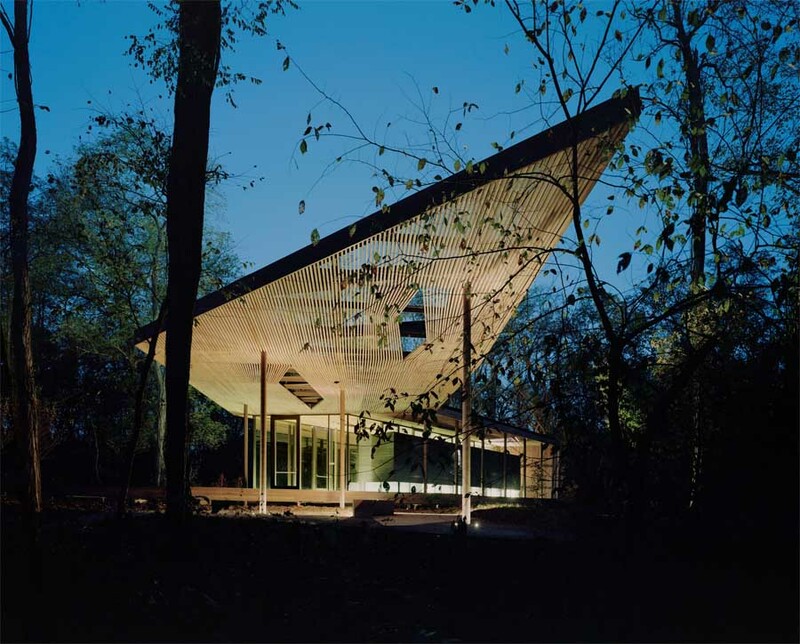 A wooden and glass structure located at the Virginia B. Fairbanks Art & Nature Park designed to blur the boundaries between man-made and natural-made forms. 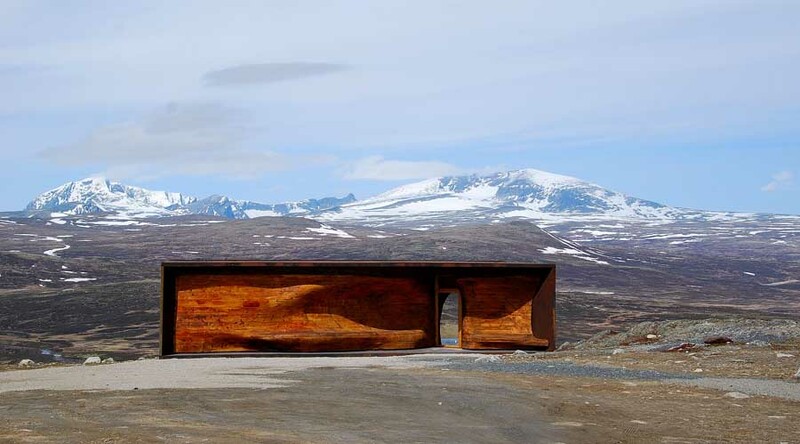 Located in the Dovrefjell National Park, the pavilion serves as an observation point for reindeersighting. 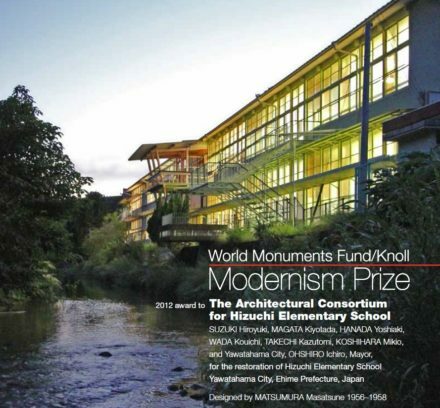 Its raw steel frame and weathered wooden planks were designed to blend in with the mountainous landscape. 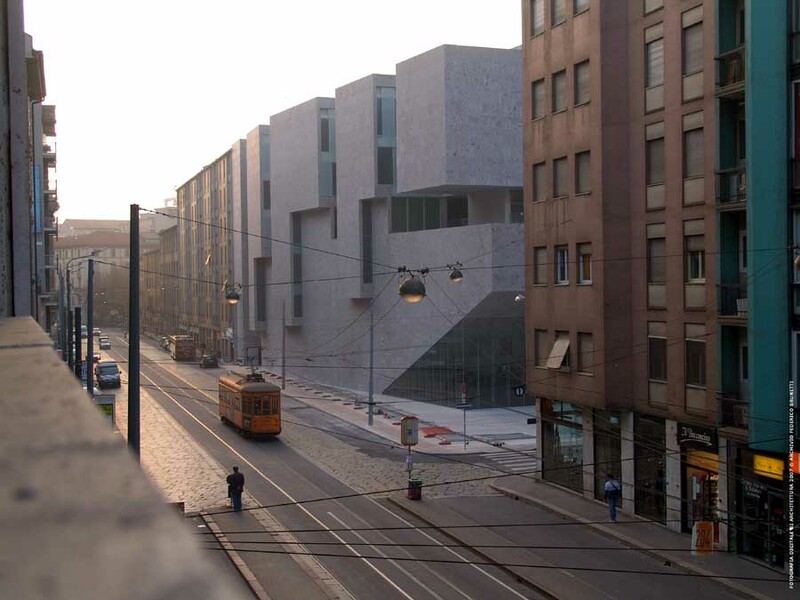 Housing the Rothschild Foundation archive and office space, the centre has been designed as a continuation of the farmhouse already located on the site. 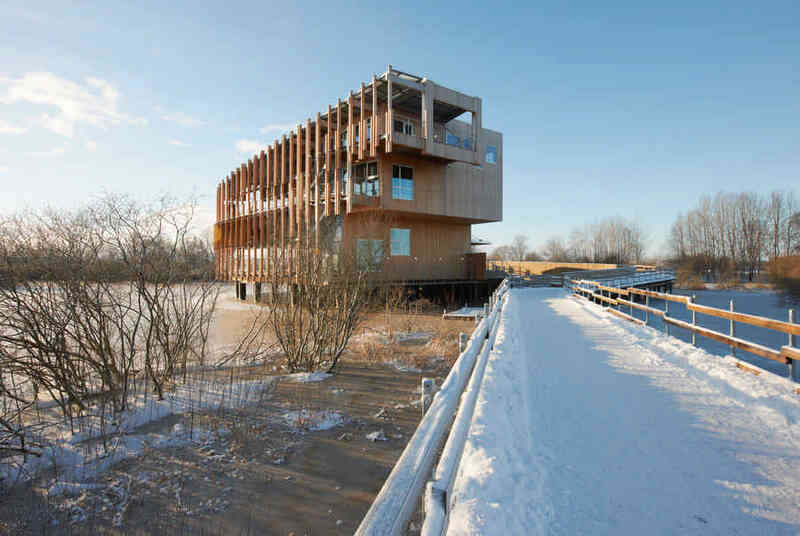 A three-storey wooden structure suspended in part over a lake at the centre of Kristianstad’s wetlands, featuring wooden boardwalks extending out into the wetlands reserve. 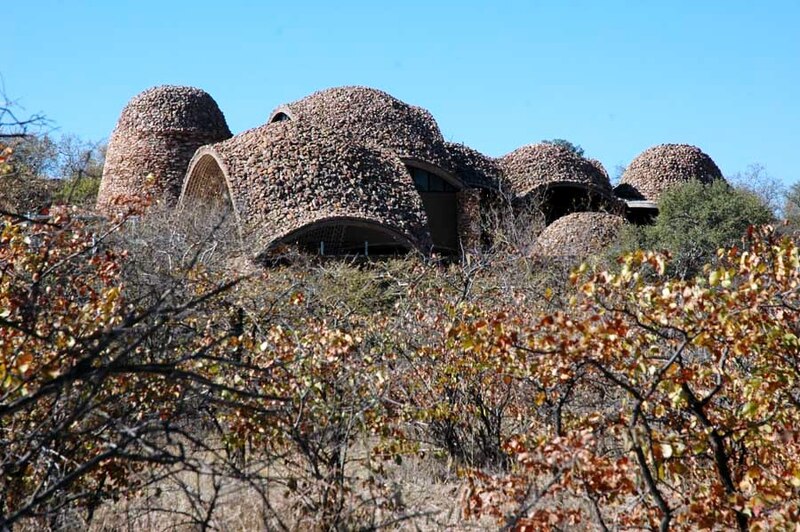 There is a seamless continuity between the rehabilitation centre’s interior and exterior, whilst the brown-golden facade enables it to blend in with its natural surroundings. 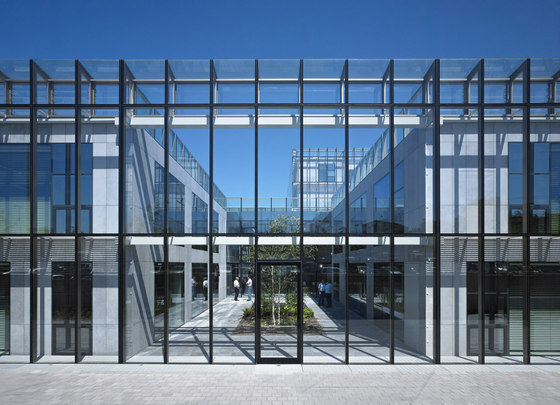 Intended as a model for future nationwide development, the NCT is clearly part of an extensive medical campus that uses its architectural language to set the building apart from its neighbouring properties. 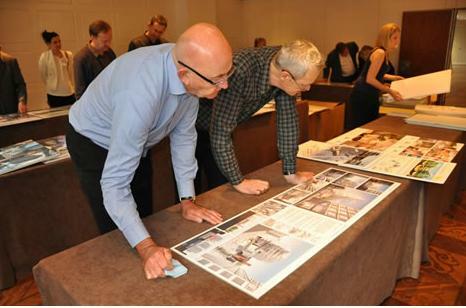 Designed to change people’s perceptions of healthcare, The Waldron is planned around a new civic square and seeks to describe a narrative journey in five frames beginning with the entrance foyer. 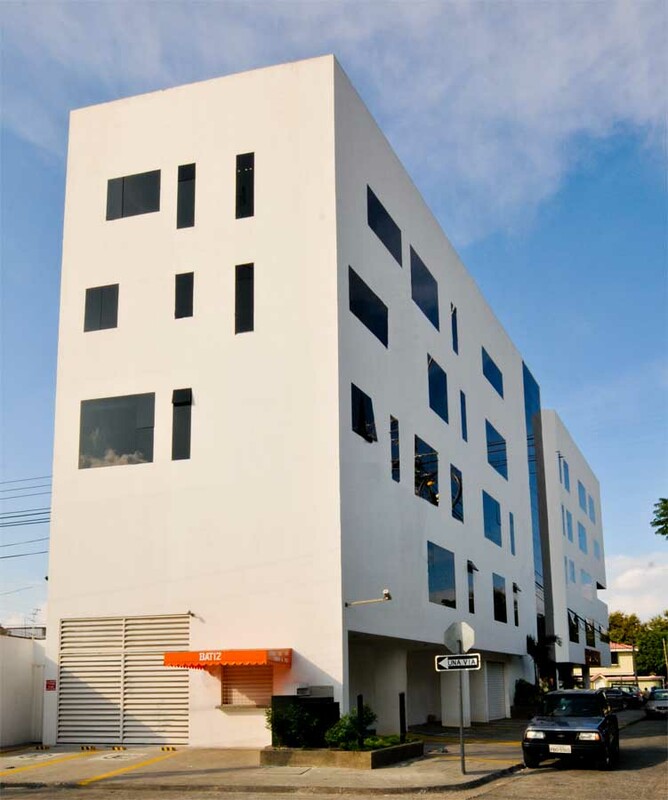 The design of Elefante Blanco was inspired by the study of composition of living items and brings together a cosmetic surgery, private rooms and medical offices on a confined site. 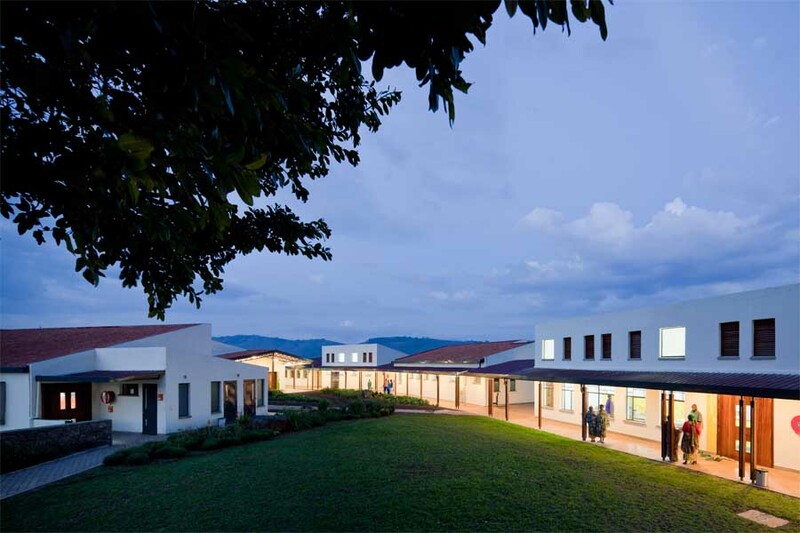 The creation of a state-of-the-art hospital constructed by 3,800+ local people, using the unique and beautiful texture of ubiquitous volcanic stone. 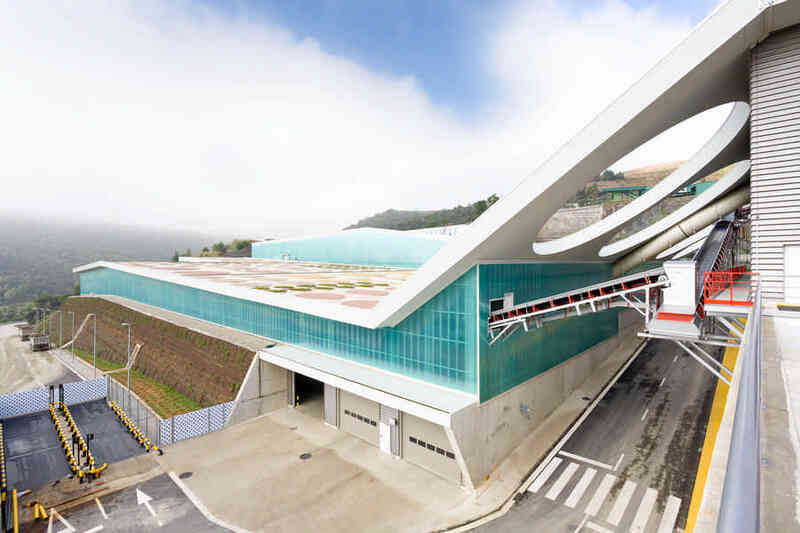 Defined by the strong linear hospital concourse, CSB2 provides a major new hospital entrance whilst the patient rooms utilise maximum daylight penetration. 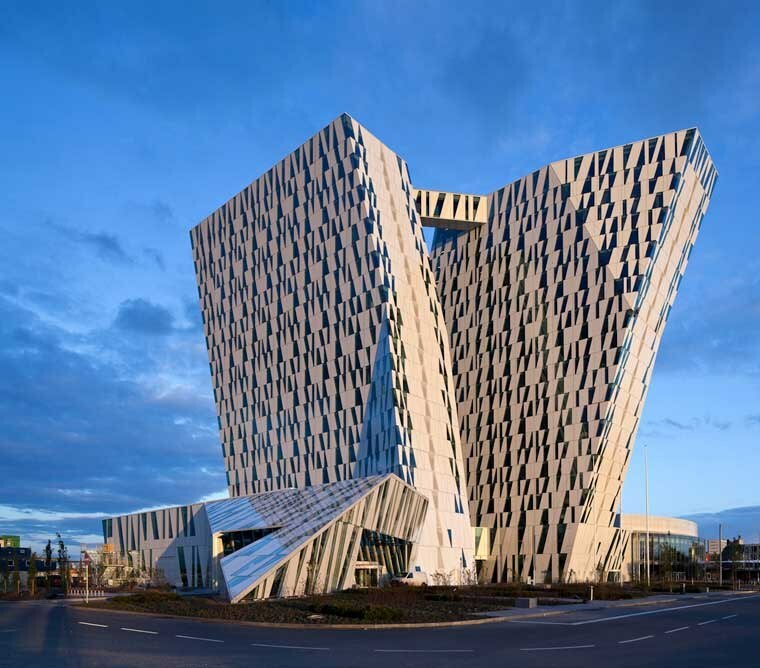 The largest hotel in the Nordic region located in Copenhagen’s new urban area featuring individually decorated rooms based on the theme ‘Nordic Cool’. 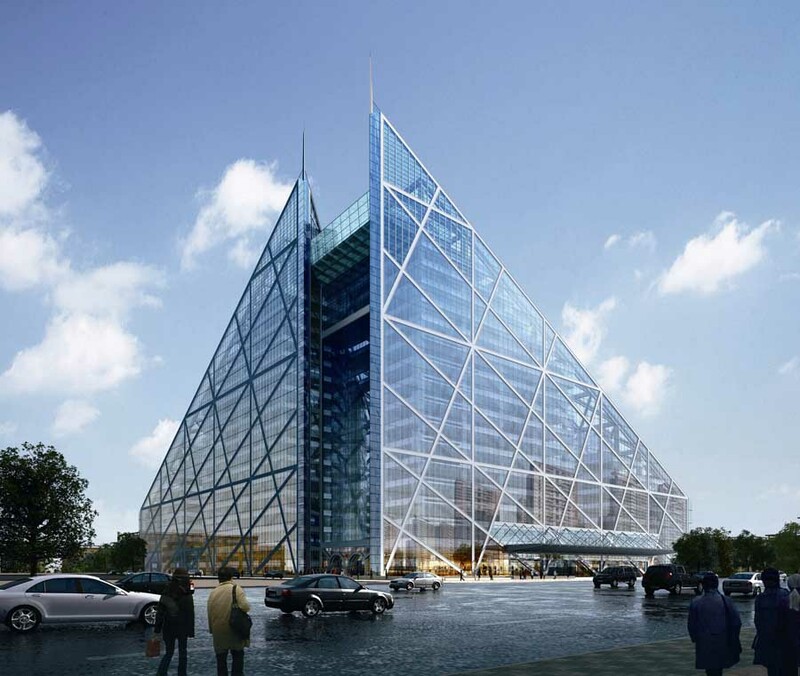 The building is formed of two 75m towers at a staggering 15 degree incline and required innovative engineering to balance the forces at play. 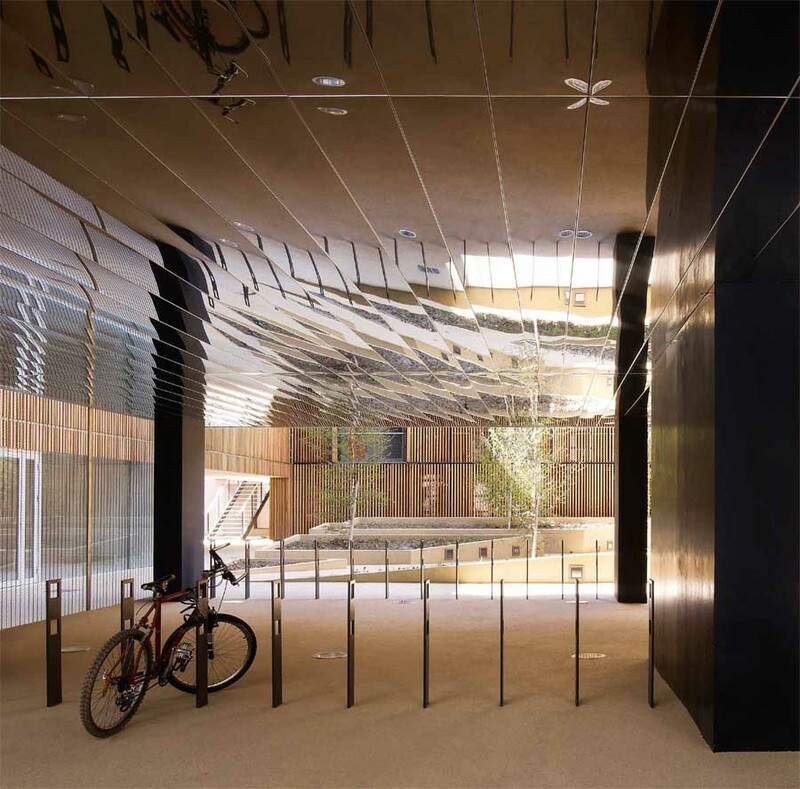 A visitors’ centre located by a stream, featuring a woven timber canopy which creates a lightweight ‘sky shell’. 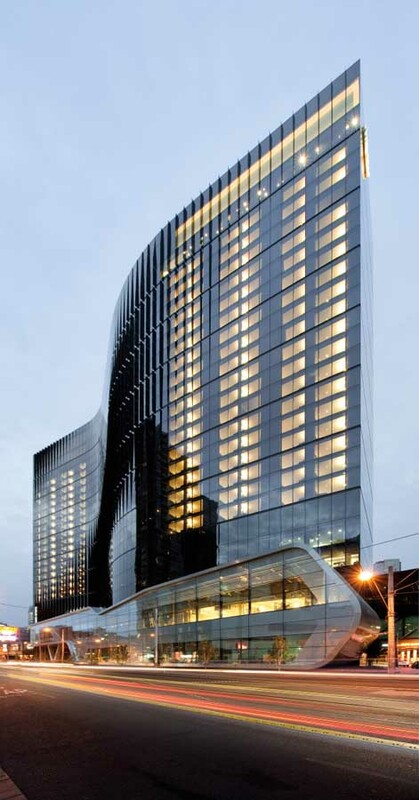 This new S-shaped 658 room urban retreat breaks free from conventional boutique hotels and, by precisely adjusting the architectural curves, gives guest rooms spectacular views of Melbourne’s skyline. 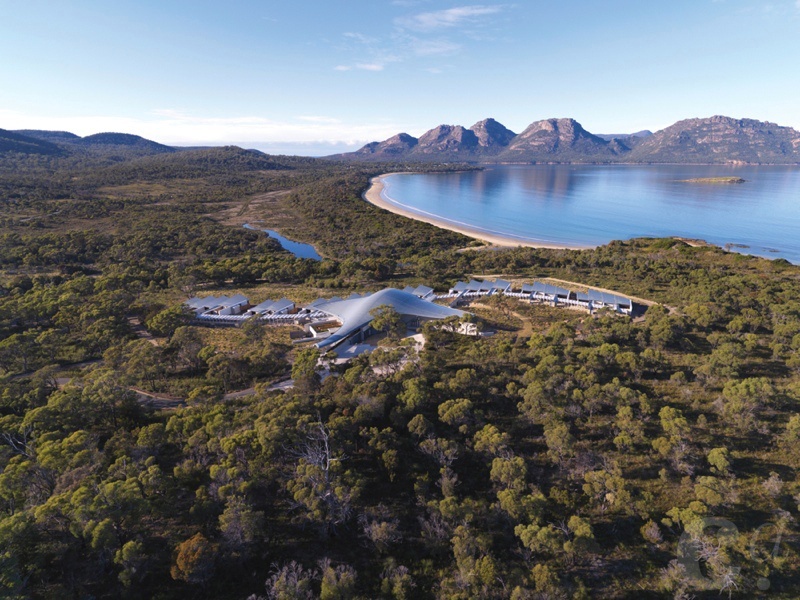 An iconic but intimate luxury holiday resort nestled on the natural coastal landscape in Tasmania overlooking Great Oyster Bay and designed to be intentionally evocative of coastal forms. 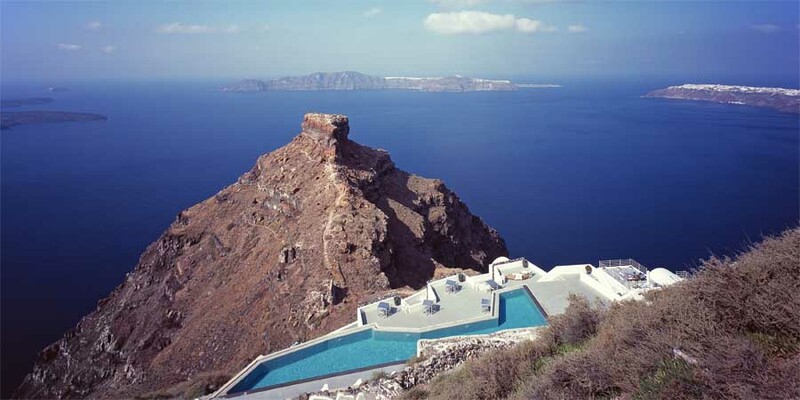 Carved into a cliff face at 300 metres above sea level, the hotel combines contemporary materials and design with the rustic feel of the Greek Islands. 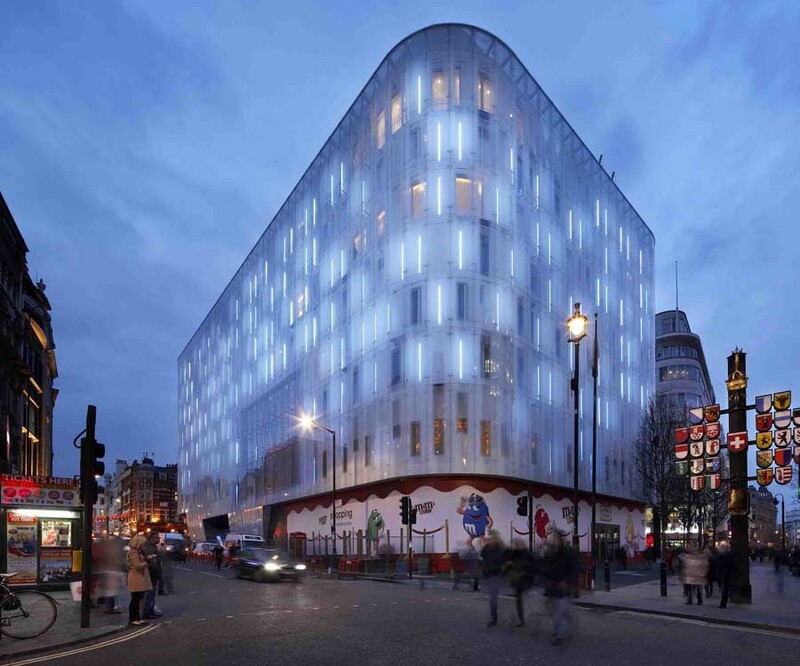 Glamourous new W Hotel which features retail, leisure and residential accommodation and spa attractions. 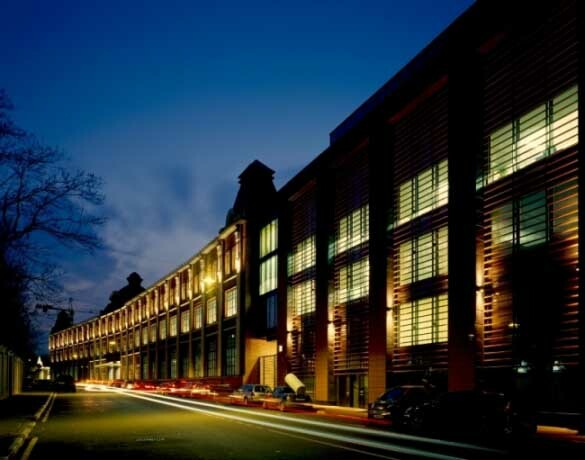 The building has restored key strategic views across the city and becomes an animation of glowing light at night and possibly the biggest electronic artwork in London. A scattering of rustic isolated modules that look like they have landed naturally on the terrain make up this hospitality complex, which combines homes, hotel bungalows, a spa, equestrian center, golf course and polo fields next to a 3 km stretch of beach. 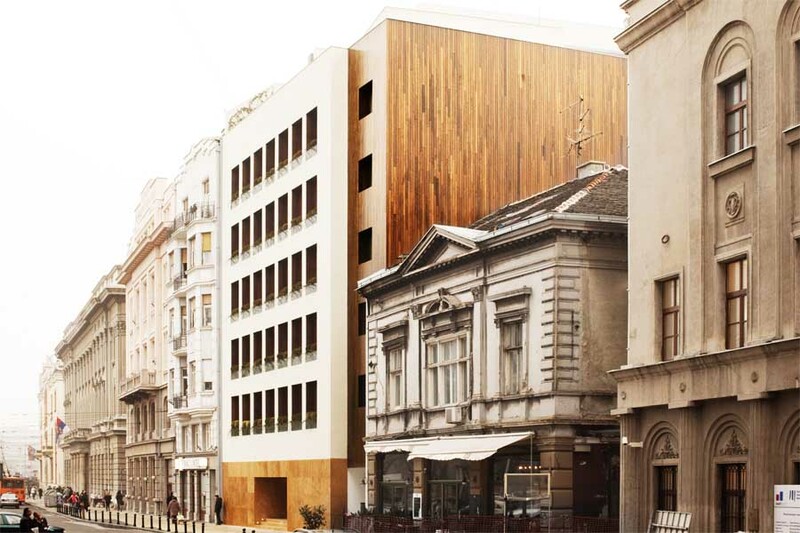 A contemporary hotel situated on one of the few sites in Belgrade’s old town that allows new construction in the historical centre that integrates with the neighbourhood by matching colours and respecting height of the surrounding buildings. 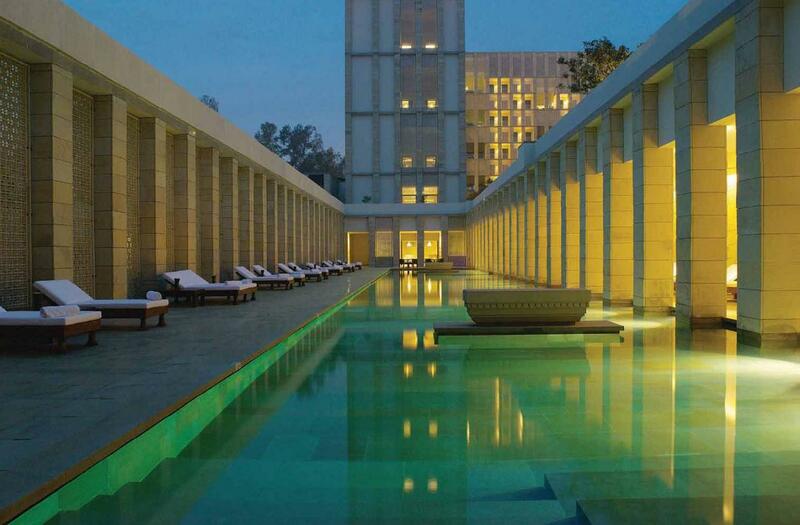 The first luxury urban hotel for Aman resorts designed around the idea of the column that is inherent in most Mughal architecture and features courtyards, water and screens to reference traditional Indian design. A luxury boutique hotel in the old city of Johhpur, which features 17th and 18th century period structures that have been restored using traditional crafts and materials, to provide visitors with a sensual contemporary experience. 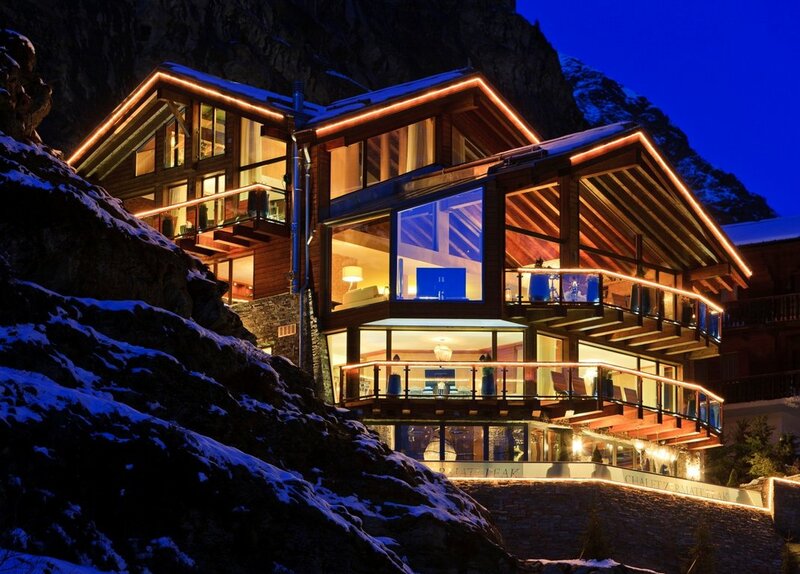 After dynamiting 3000 m3 of rock in the mountainside, the luxury CZP takes the super chalet to a whole new level, occupying a landmark position with breathtaking views from the almost entirely glazed southern side of the building. 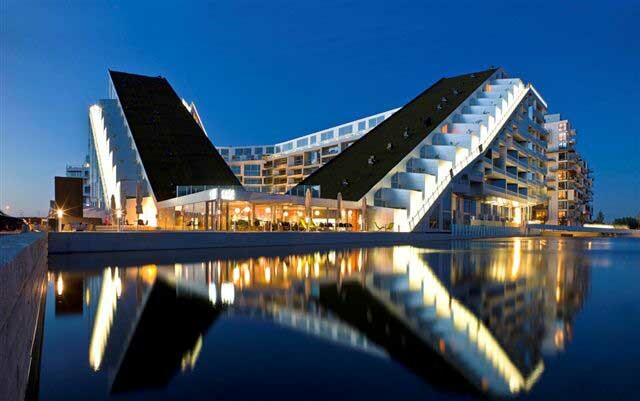 A small hotel designed especially for children aged 5 to 12 years, resembling a spiral sand castle, with inspiration for the form of the building taken from on the bay of Navarino and its never-ending dunes. 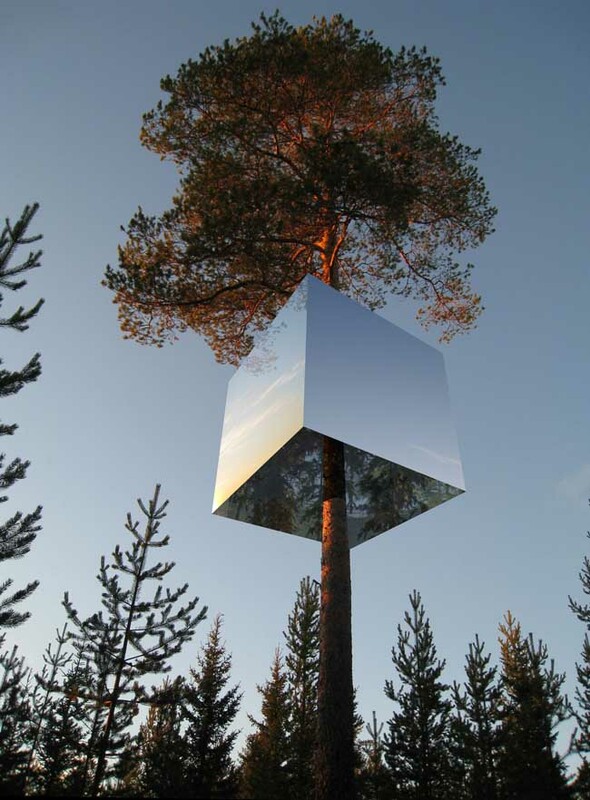 A tree hotel in the far north of Sweden close to the Arctic Circle, made from lightweight aluminum hung around a tree trunk and clad in mirrored glass to reflect the surroundings and the sky, creating a camouflaged refuge for two people. 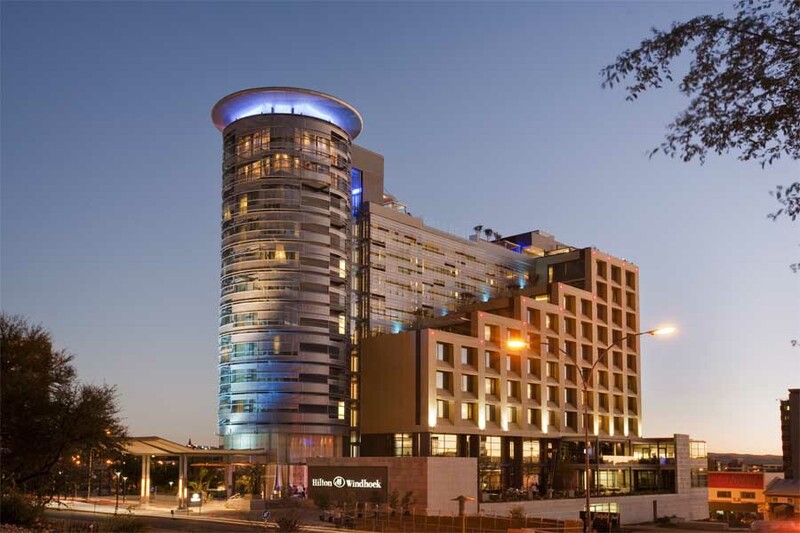 A new sophisticated Hilton Hotel in Freedom Square, conceptually perceived as a beacon of urban nightlife, celebrating local culture with art and imagery, providing Namibia’s capital with a public landmark. 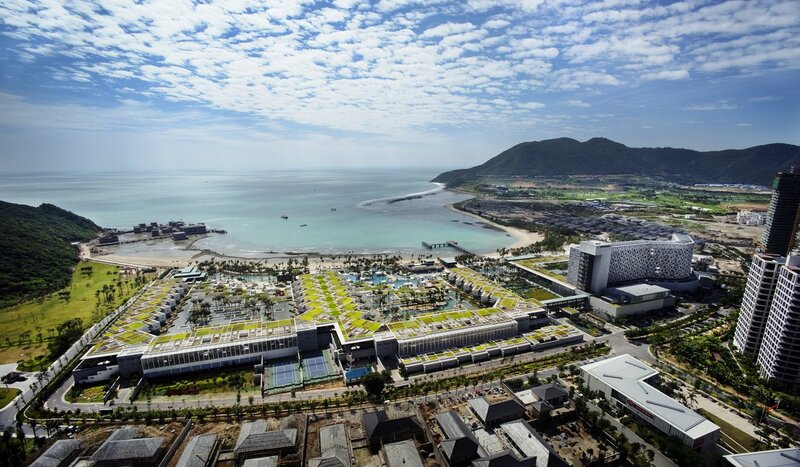 Located along Xiao Don Hai Bay in Sanya this 350 room hotel is designed around the theme of a garden, with the roofs and gardens inspired by the rice-paddy fields of Sanya. 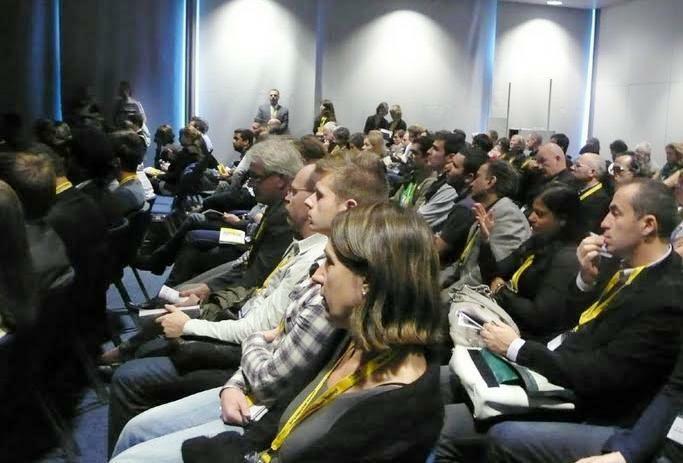 offer views towards the city’s skyline. 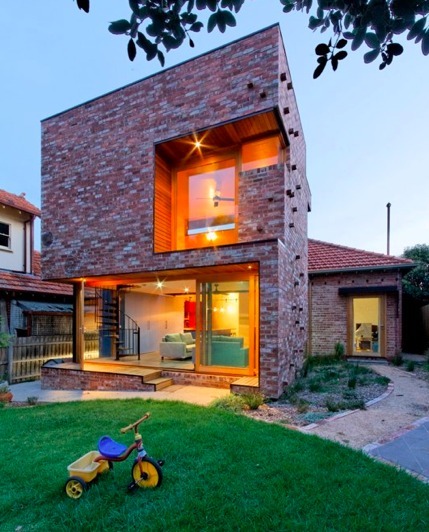 This small, sustainable house was built as an extension to a heritage home, with recycled brickwork and energy efficient features. A transformation of a nineteenth century building, this house has a double volume glass loggia and stainless steel mesh curtain, creating an outdoor room. This house is situated in Girona’s oldest district and has been refurbished in a minimalist way so as to retain all the original features. 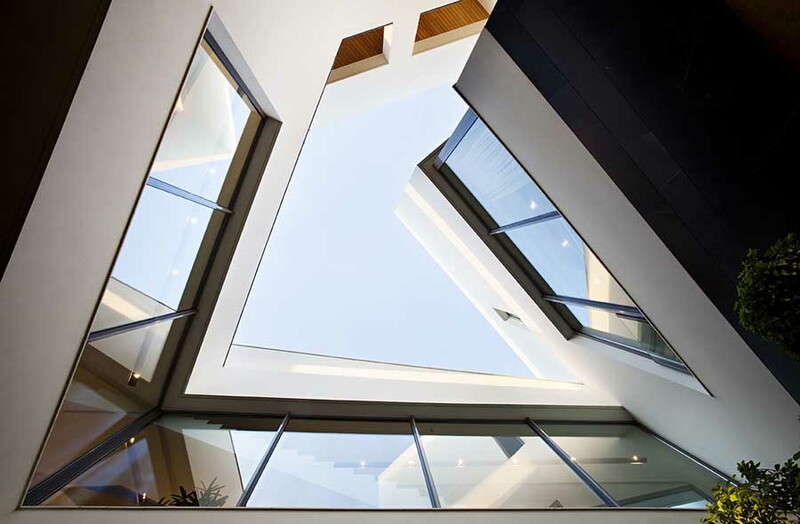 An extension to a heritage building, this house creates a private outdoor space in the heart of a town whilst featuring large glass windows to maximise natural sunlight within. Taking advantage of available seaviews, light and breezes, this house has local sandstone floors and a sweeping copper roof. 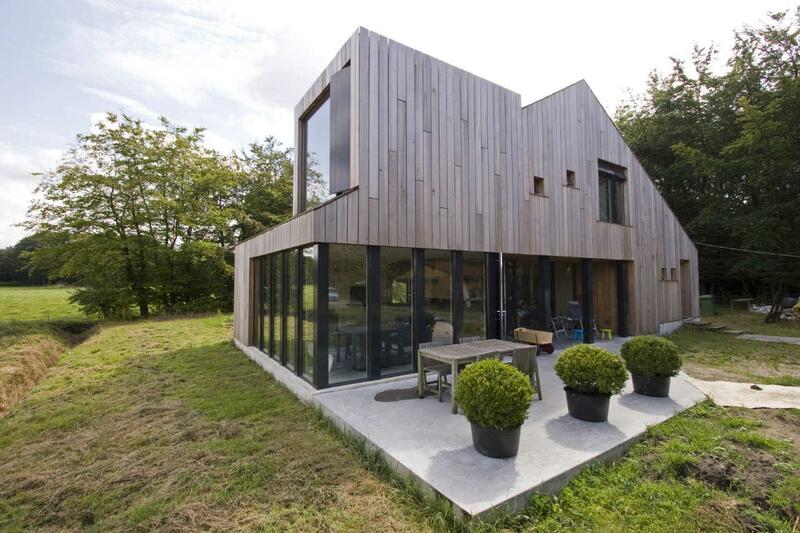 An extension to a Grade II listed building, complete with a low-level garden pavilion made from natural local materials built into the hillside. 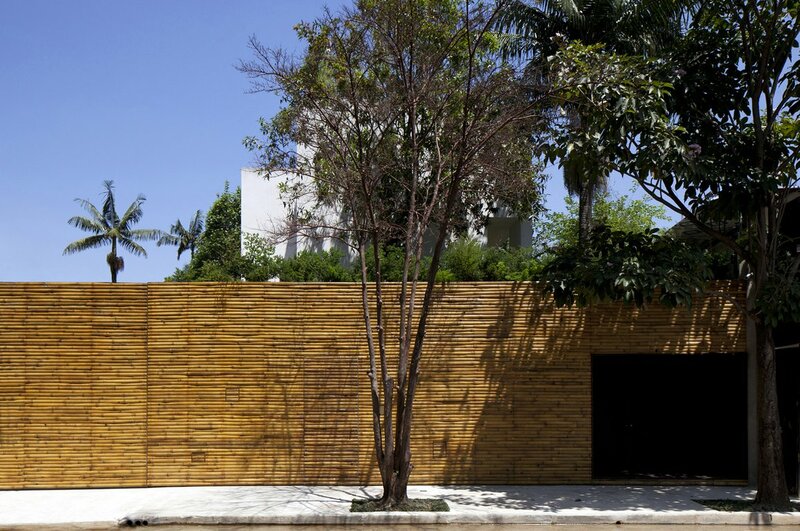 An ultra-compact vertical house located in an urban setting, the top floor features an outdoor room with a fig tree which creates a canopy effect. 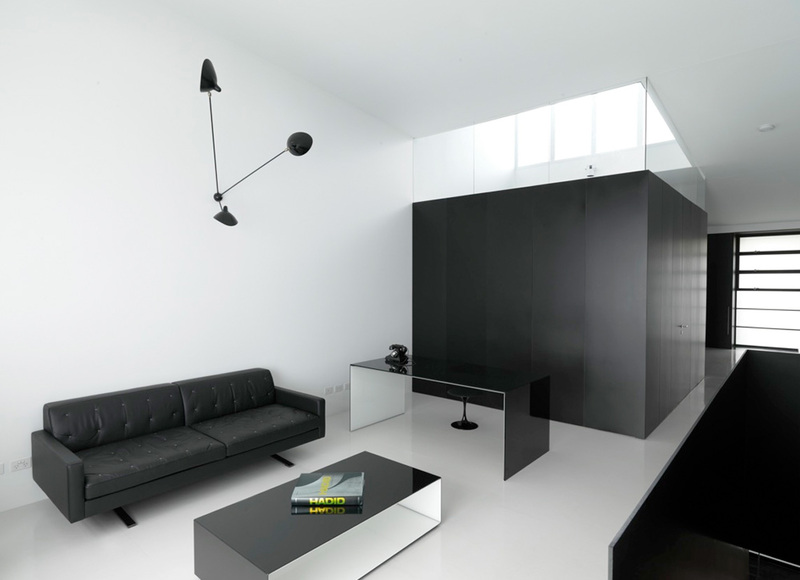 Built as a modern take on the old Estonian low-rise estates, rarely seen in Estonia, this house surrounds a courtyard and features floor-to-ceiling glass walls and external black and white tones. 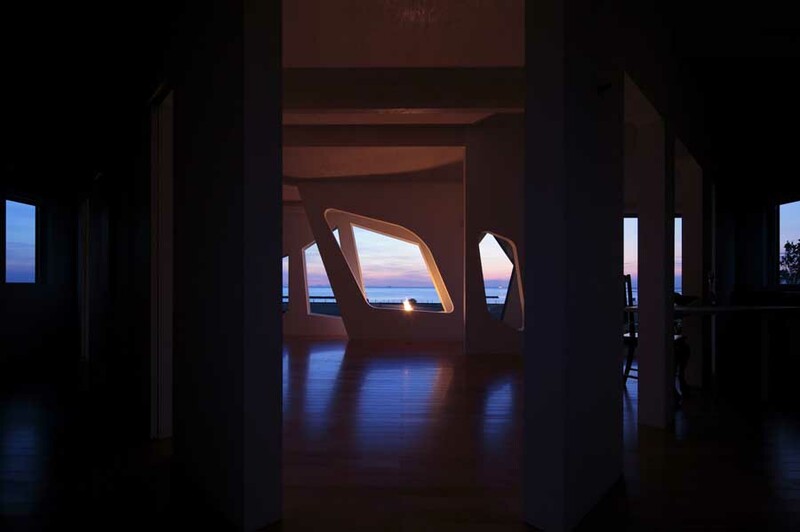 Facing east towards the sea, this house was designed as a ship cresting over waves and is built as a place to observe the ever changing sea and waves. Built into a mountainous incline, this private villa in the quiet suburbs of Amman features stone facades and ironwork decorations. 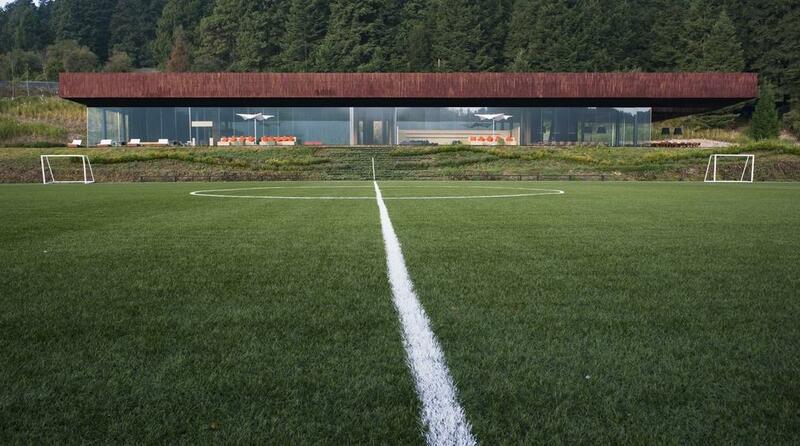 Created around a desire for a location outside the city for friends and family to play and watch the Mexican national sport, soccer. 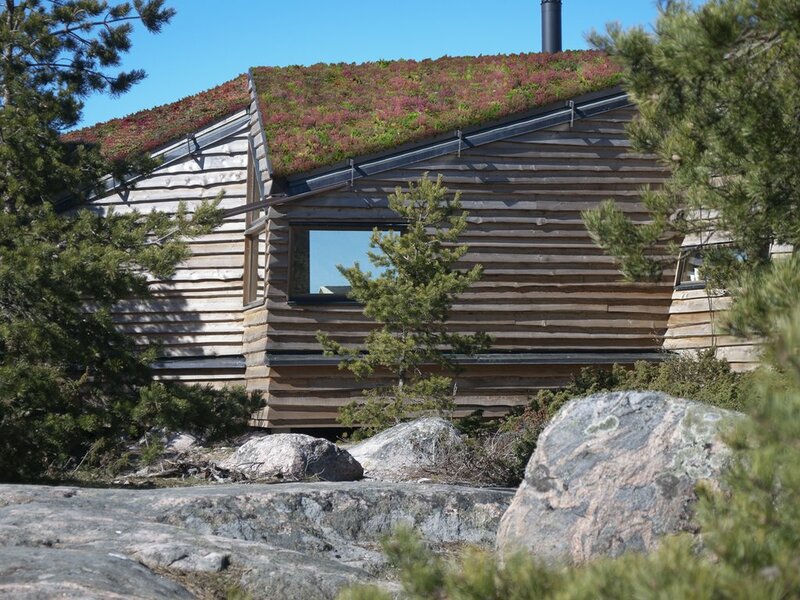 Embedded into the mountainside, this sustainable house has a green roof covered in native plants and a large window with a panoramic view of the valley. 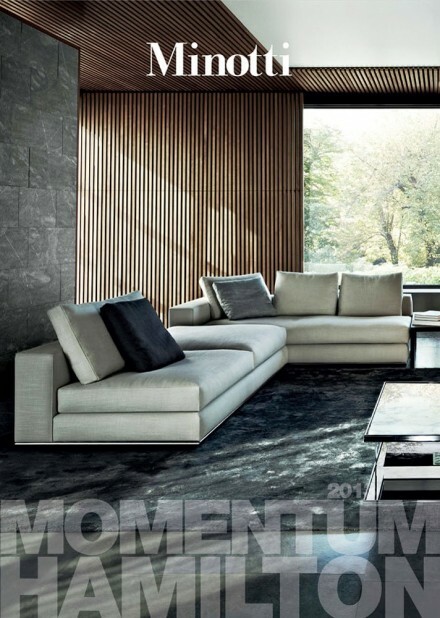 A spacious and open house organised in two linear volumes, with a swimming pool occupying the central courtyard. 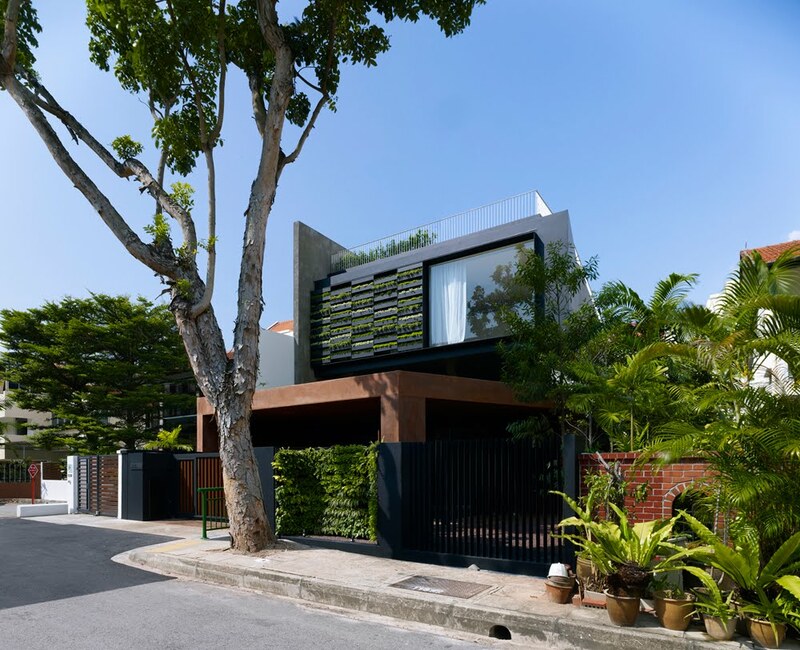 This house blurs the boundaries between garden and home with a sloping roof terrace and planter screen on the main facade. 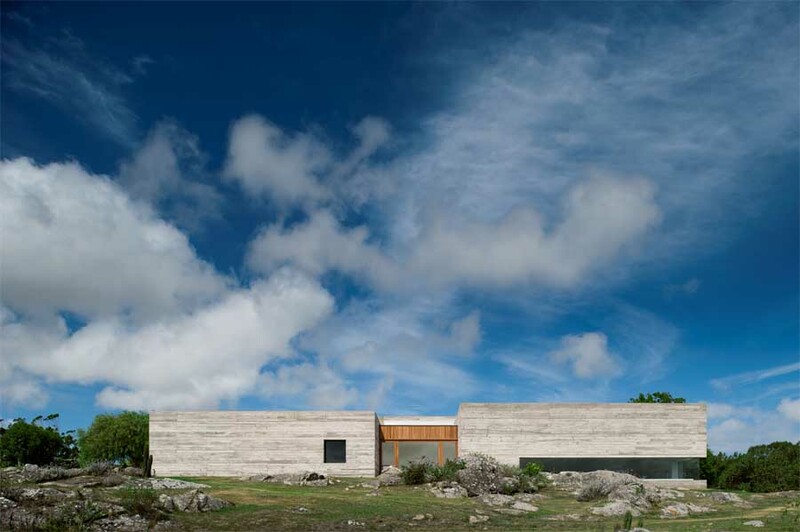 Built against the rocky landscape of the small island, this villa has silvery larch on the exterior and is designed to be used both as a summer house and a winter haven. 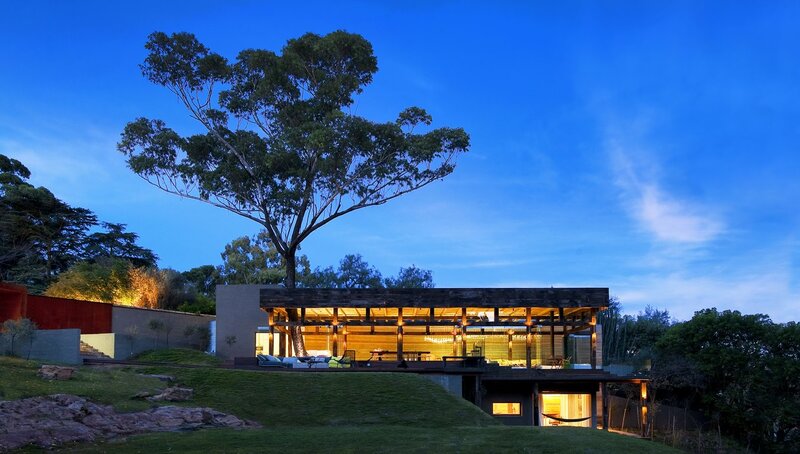 Located on the top of a hill, this villa was designed around the old trees residing on the plot, with a closed outdoor atrium. A conversion of a late nineteenth century grocery warehouse into a two level residence, the facade features recycled brickwork and a large steel plate portal. 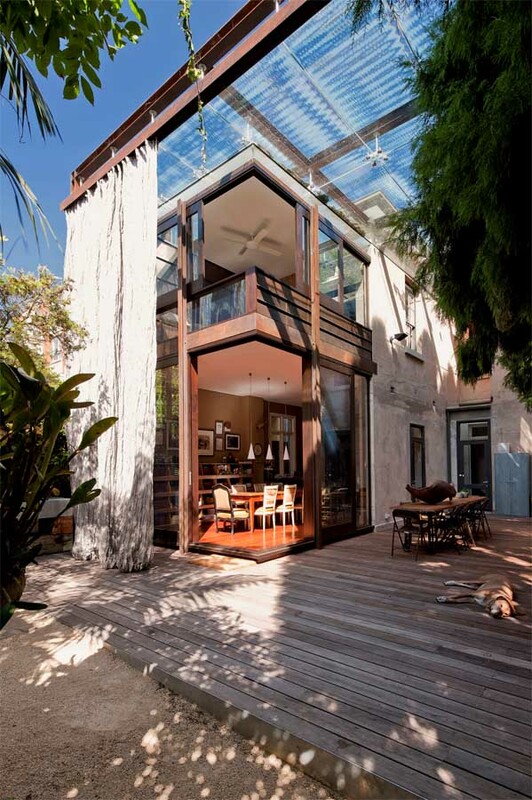 Organised over four levels, with large sliding glass doors which open the living space up to the garden. 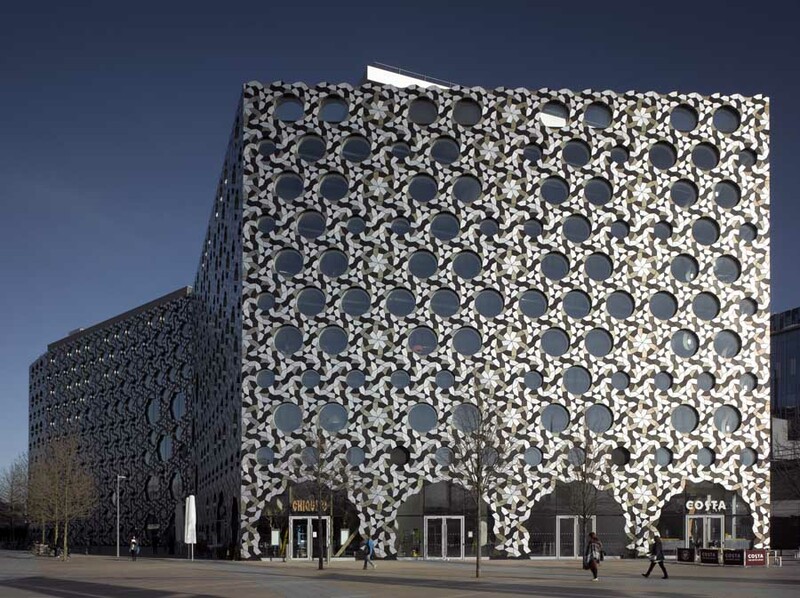 Described as an ‘optical dystopia’, this impressive building has a large glass wall and white exterior, and is designed to be an optical illusion. 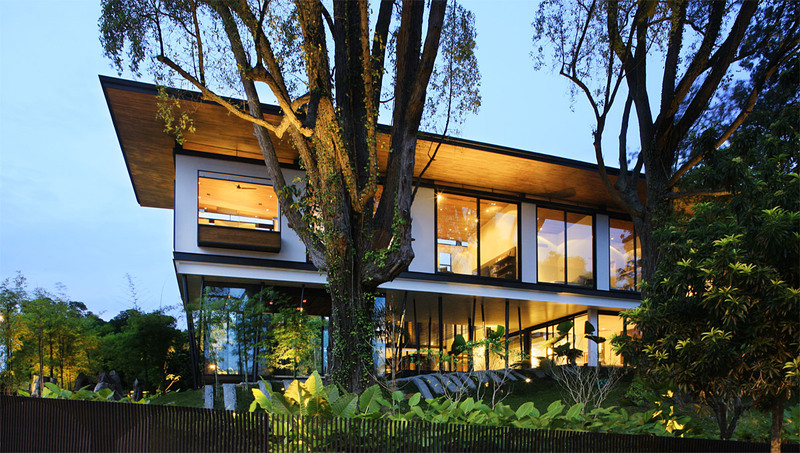 Situated in a tree conservation area, the bottom floor of the house is made of glass so that the upper floor appears to be supported by trees. 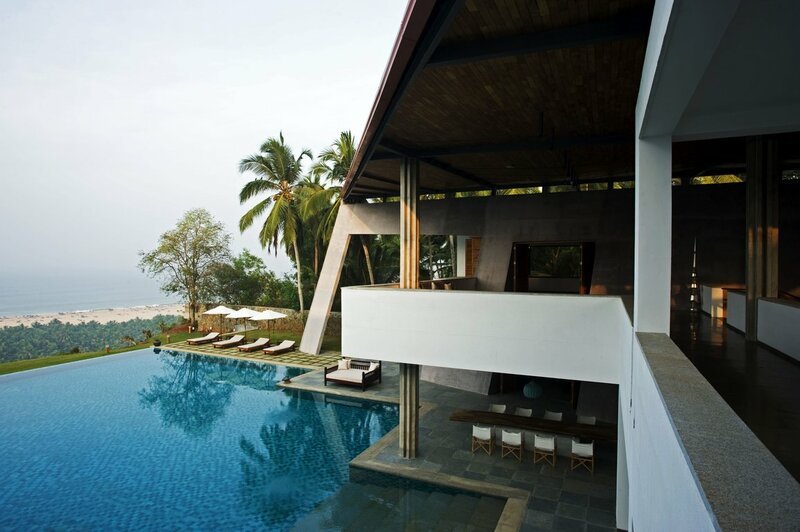 Perched 200ft at the edge of a cliff on the Arabian sea coast, this house features an asymmetrical sloping roof and used local artisans and materials in its construction. 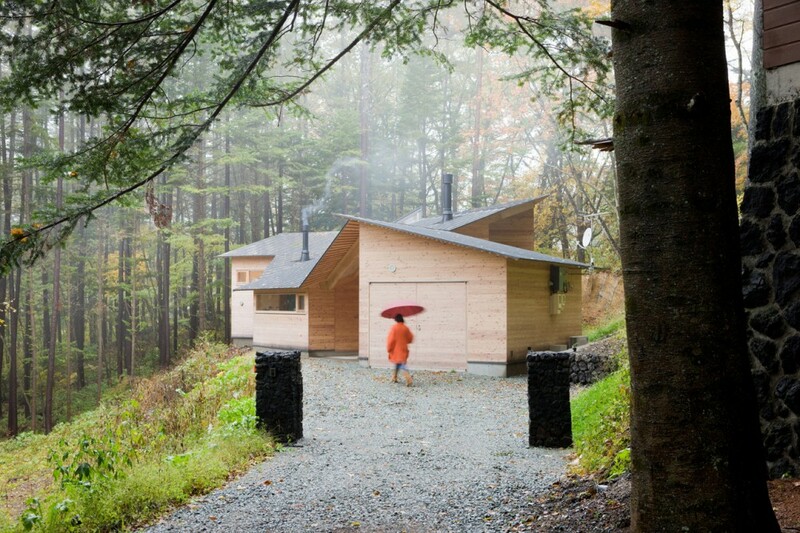 Designed to blend into the mountain, this wooden cottage is built using local materials and is heated by modern technology. 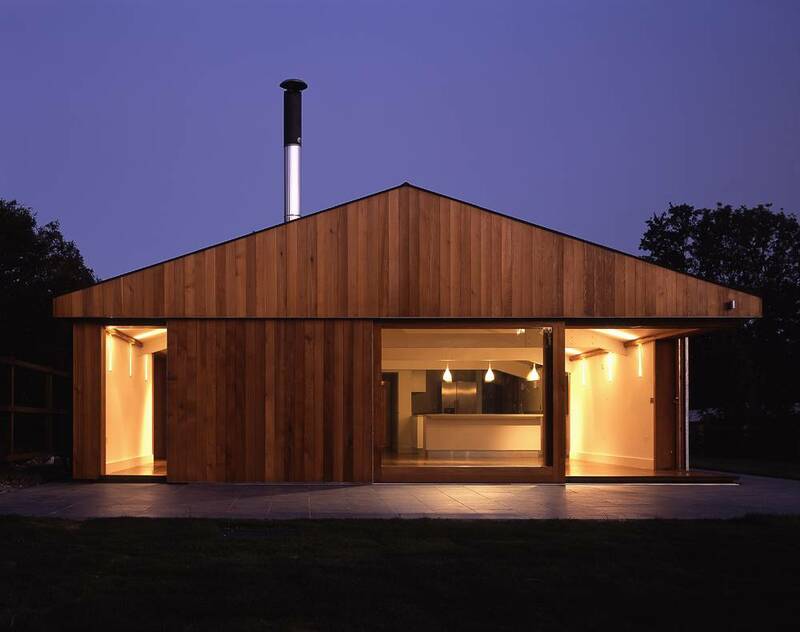 A ‘minute’ 65m² cottage has been transformed to create a 185m² house which boasts a roof deck with 360° views, and a freestanding fireplace. A light and open house in an exclusive area, with timber slats and large expanses of glass designed to maximise views of the waterways. 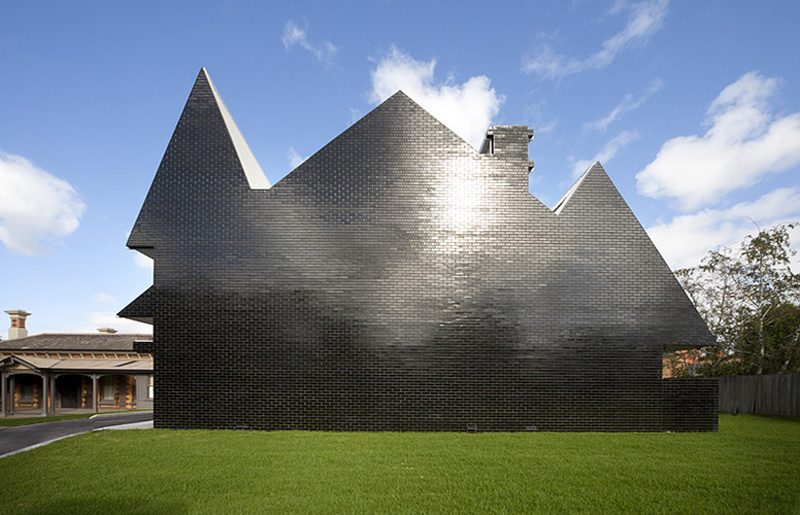 Recognising that the chimney is a disappearing feature in architecture, this wooden house features four chimneys on a saddleback roof. 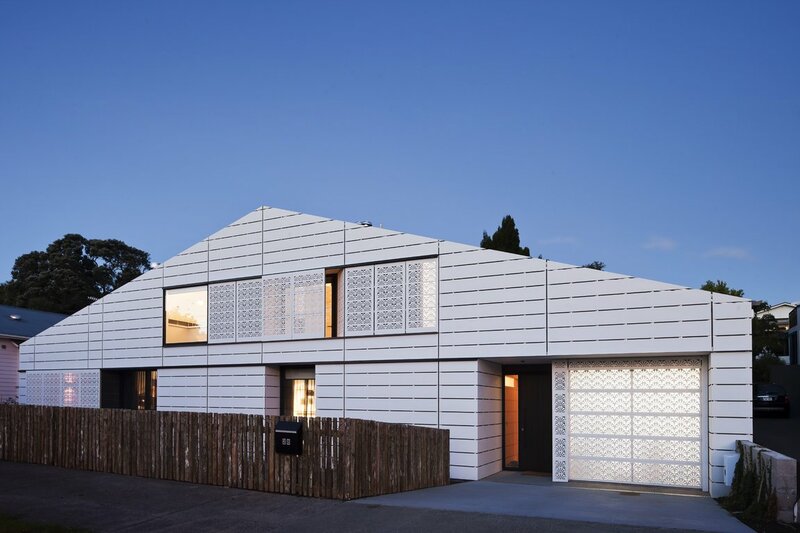 Located in a leafy inner city neighbourhood, this house is covered in white cement panels and contrasts with the colonial architecture of the area. 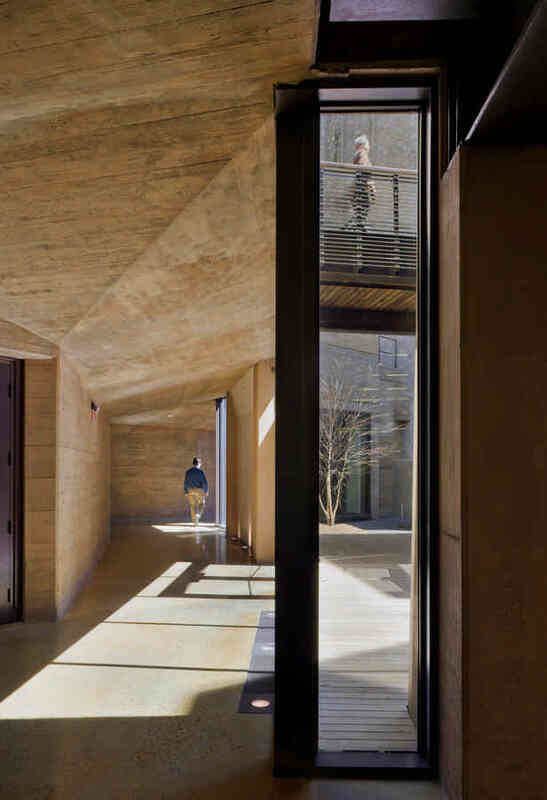 A simple house for entertaining and guest accommodation is stripped to a simple box made of natural materials and features a wall made of rammed earth that runs the length of the building, plunging into the pool and re-emerges downstairs. The pool features a whale-bone chandelier. 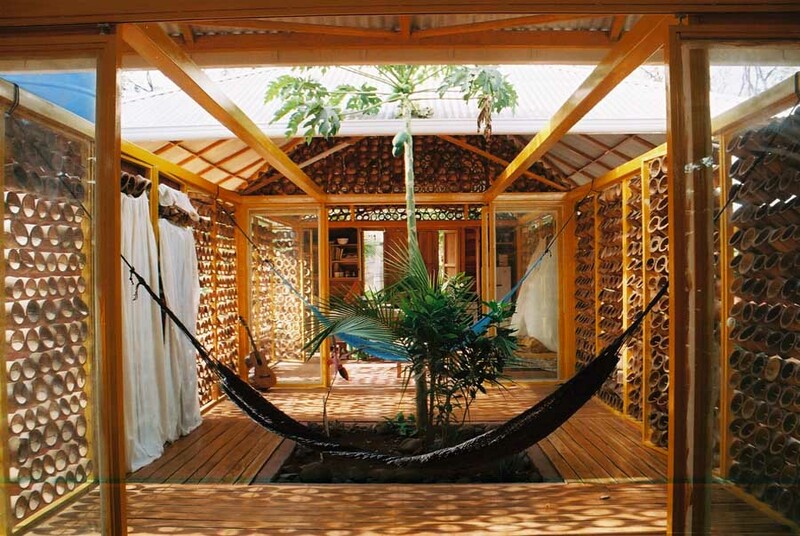 An open-plan house with adaptable spaces, which is attempting to become the first carbon zero residence in SE Asia. 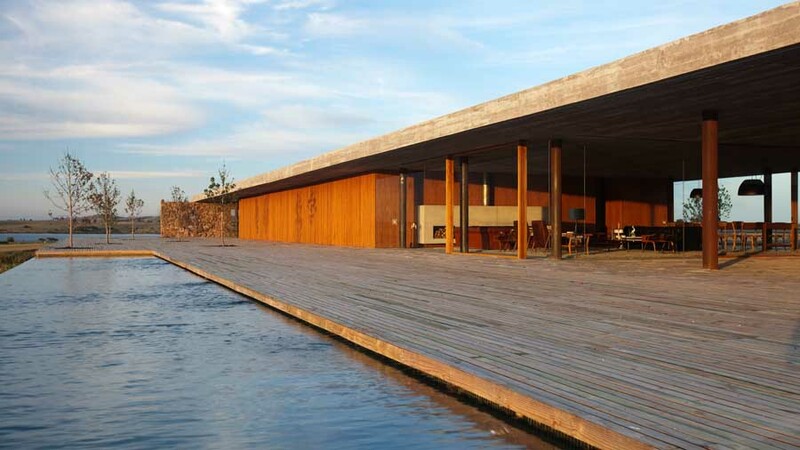 A one-level house located on an open plot by a reservoir. 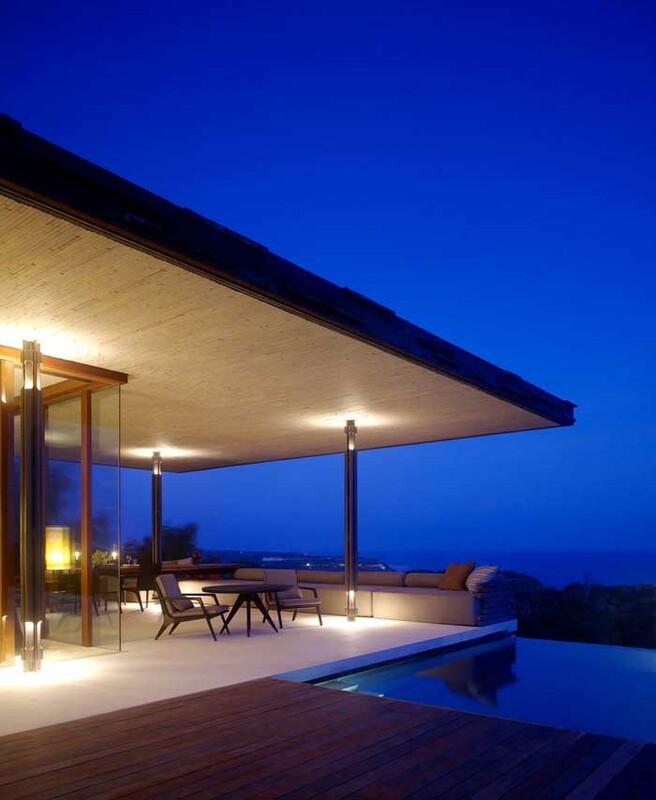 The stone walls are constructed using local materials and the living rooms are enclosed by glass. 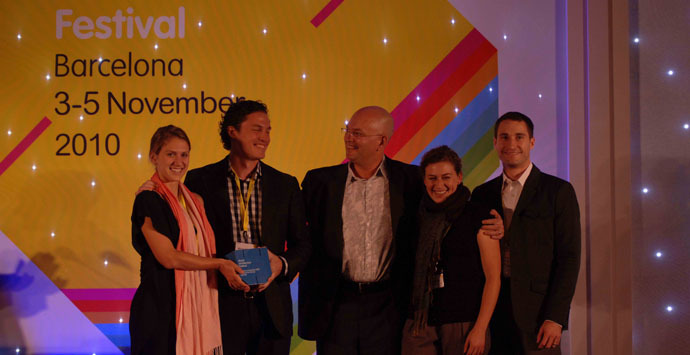 A housing village consisting of 25 residential units, some with rooftop patios, that aims to develop community spirit and encourage pedestrian culture with the use of courtyards and internal streetscapes throughout the residential buildings. 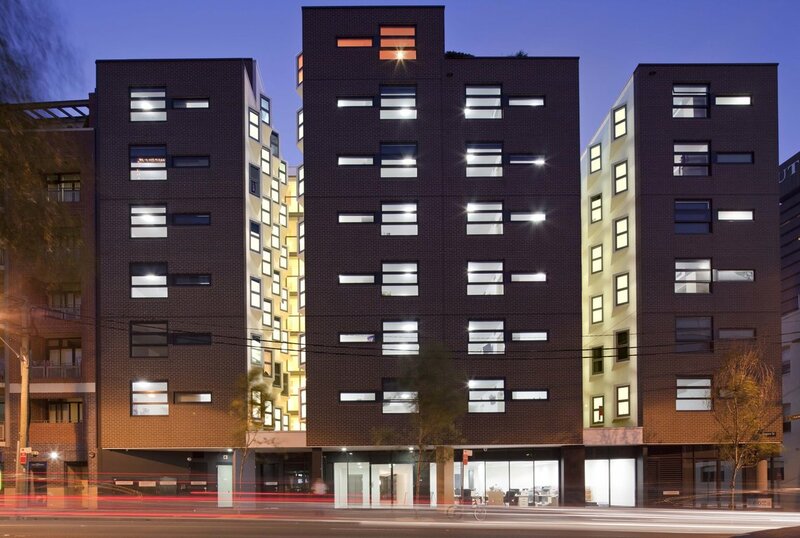 A small development consisting of twelve 170 square metre apartments for residential use with a semi-basement for parking. 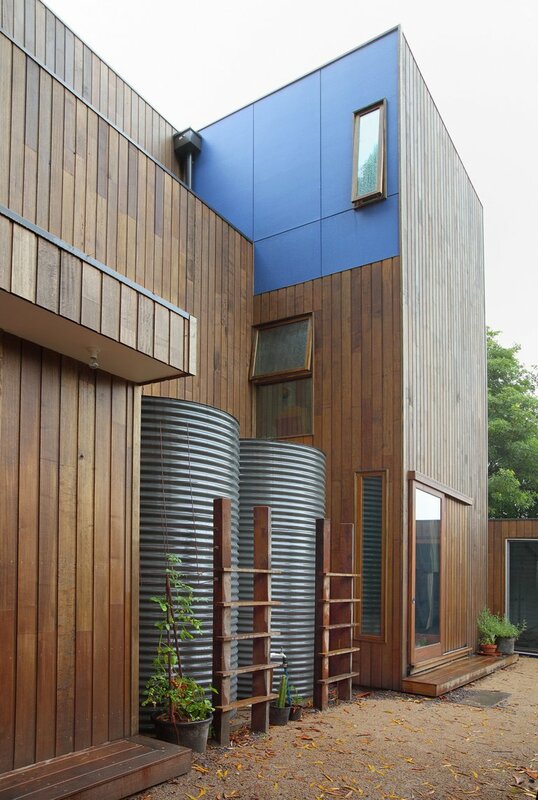 Environmentally friendly with a rain water recycling system as well as solar panels to supply hot water. New housing program offering 540 residential units in three kinds of accommodation; apartments, penthouses and townhouses. 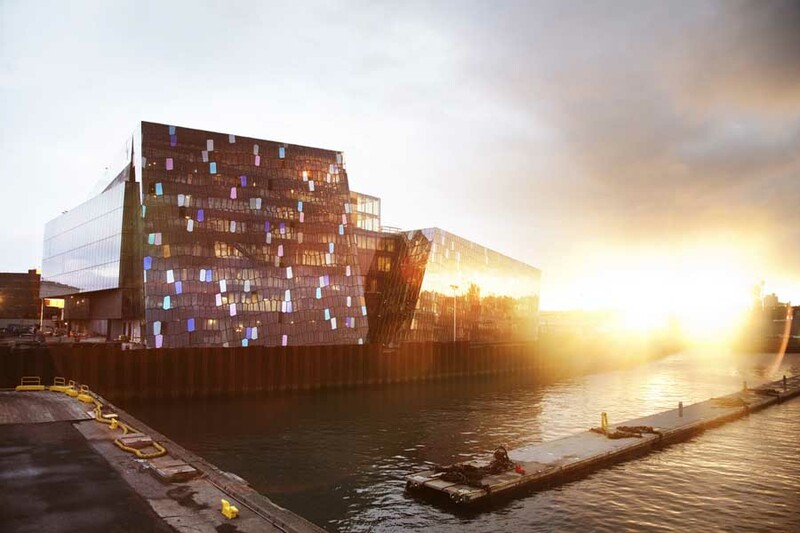 The bow-shaped building creates two distinct spaces between trade and living, creating a strong inflow of light as well as two sloping green roofs strategically placed to reduce the urban heat island effect. 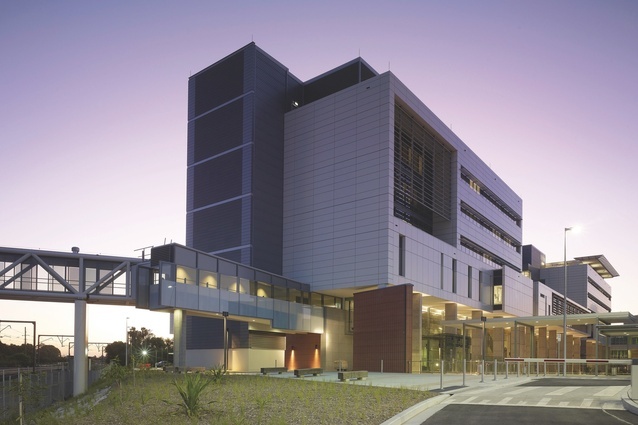 New building built on the site of HMAS Creswell to accommodate Officers. Consisting of 32 single bed units with shared ensuite and deck facilities, it employs simple but sustainable devices to create a comfortable internal environment without the need for mechanical ventilation. 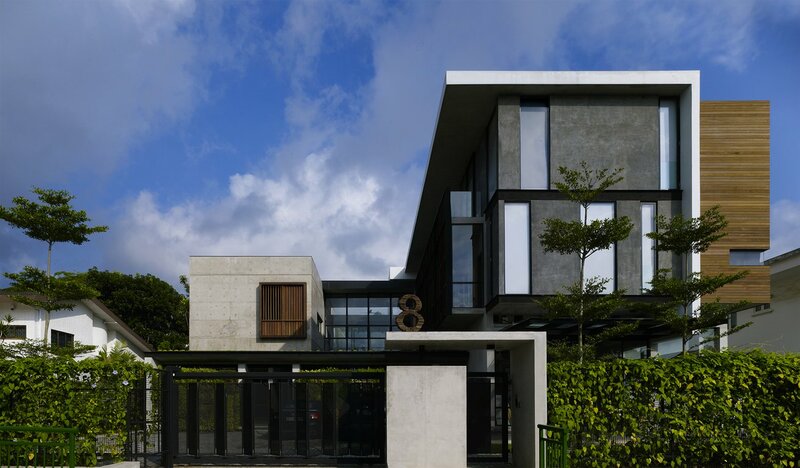 A cluster housing development arranged in descending terraces adorned with off-form concrete, wood, and natural stone to fit with nature. 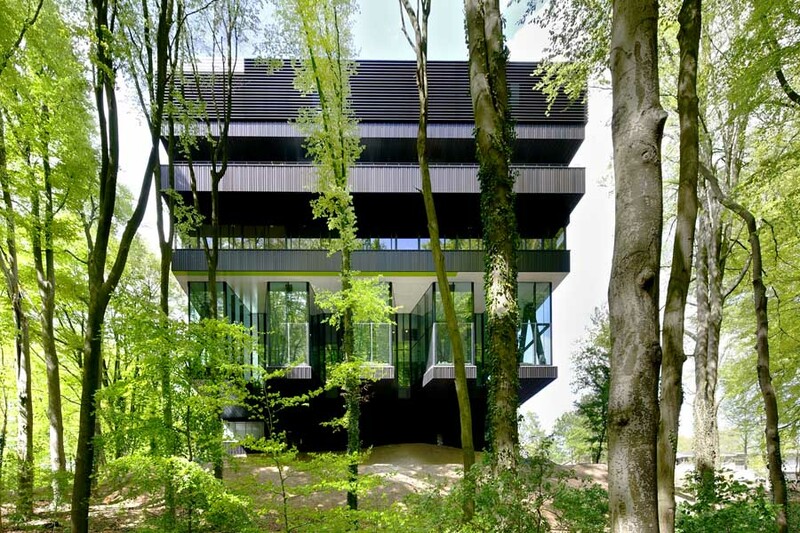 The development seeks to reduce its ecological impact with its ‘green’ features with large windows maximise the view of the forest surroundings. 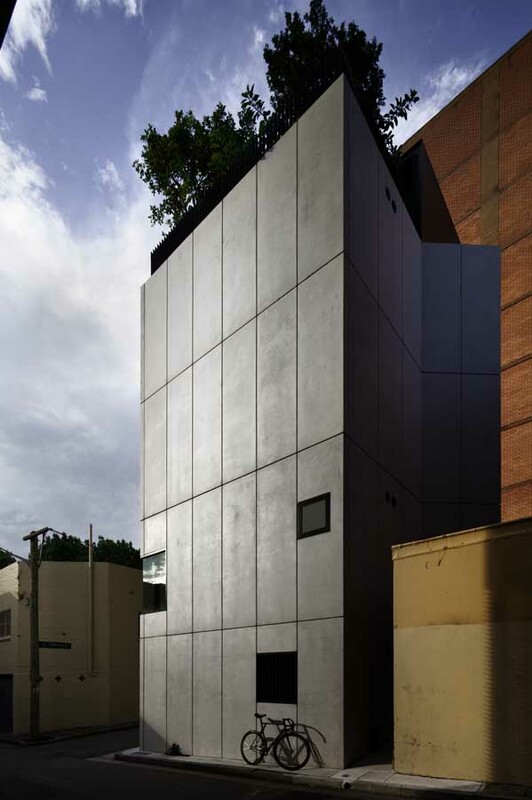 A compact house development designed over three levels to maximise internal space which is camouflaged to its surroundings. The property is surrounded by tall gum trees so the living level is on the first floor with a double height ceiling to give the experience of being in a tree house. 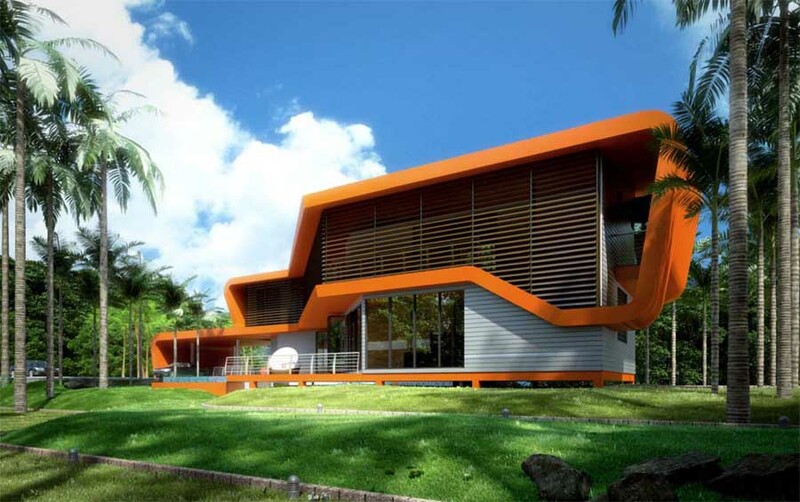 A prestigious yet minimalist gated villa community complete with clubhouse, modern amenities, and green building features. 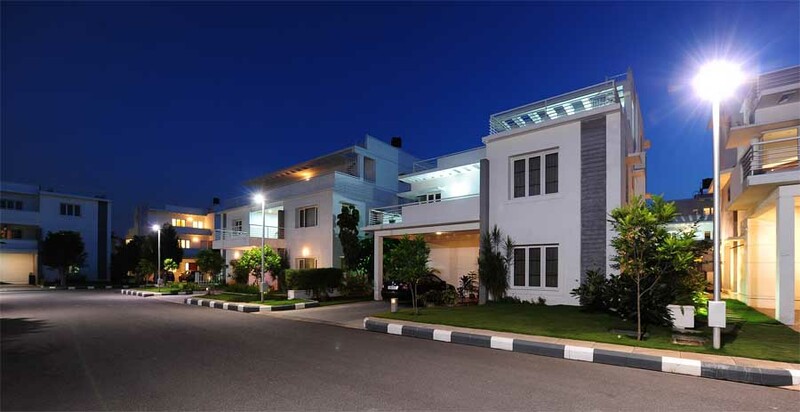 The villas have been designed in accordance with vaastu principles as it plays a vital role in Hyderabad, affecting its price and rentals. 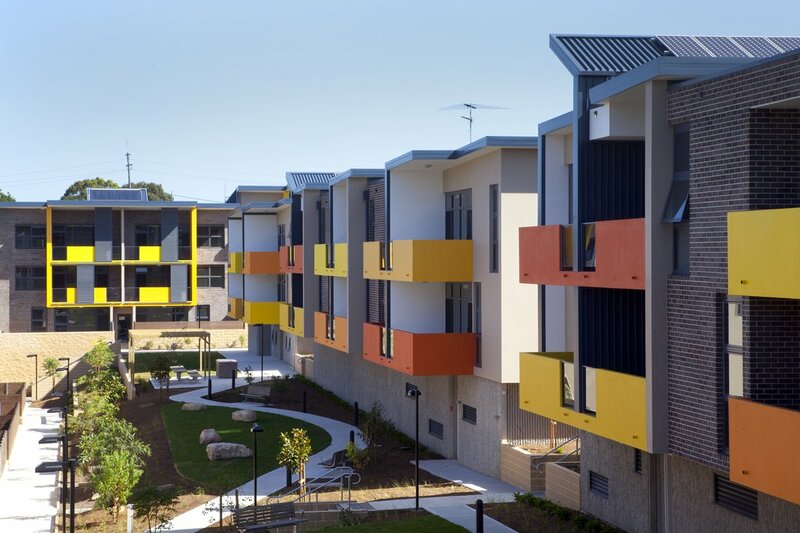 A public housing redevelopment covered with bright and contemporary colours to echo Sydney’s ‘vibrant cities manifesto.’ Generous open spaces and a courtyard are made possible by adequate onstreet parking. 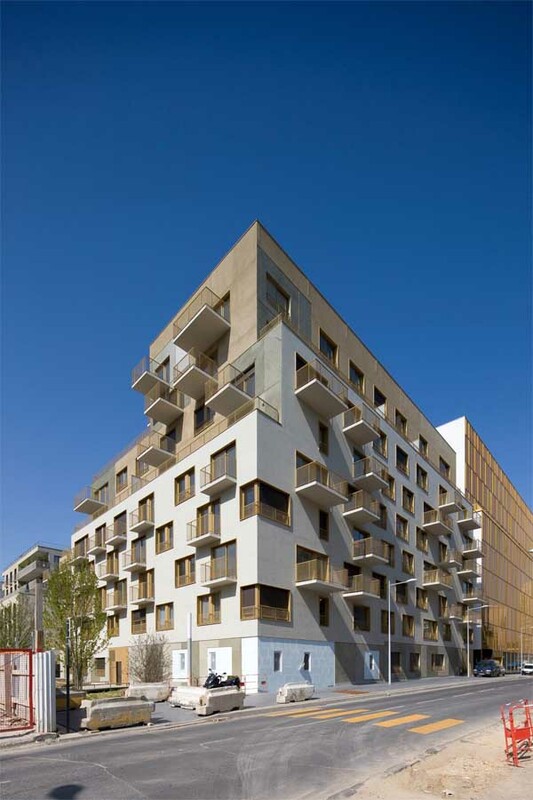 A new student accommodation development, consisting of 150 rooms, communal spaces and a courtyard to create optimum comfort in an urban setting in the heart of Paris. 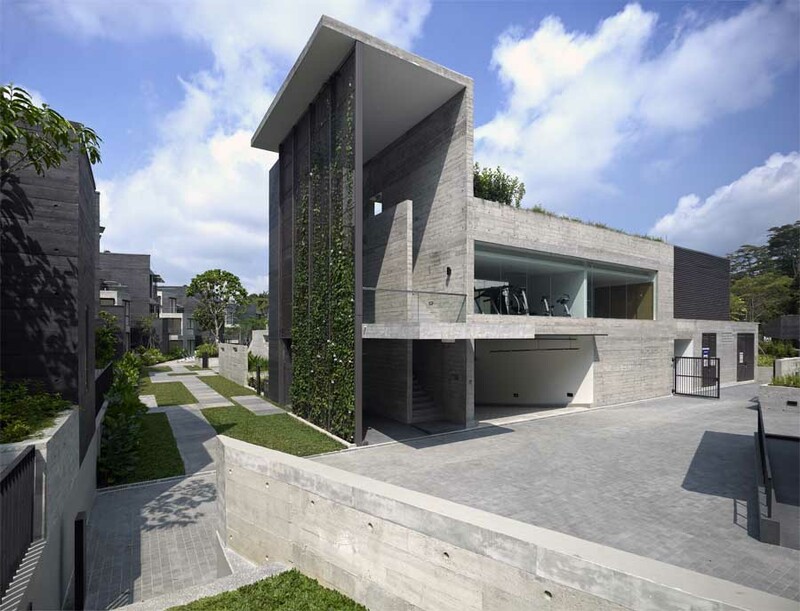 A 2-storey terrace shaped mixed-use residential and commercial building. 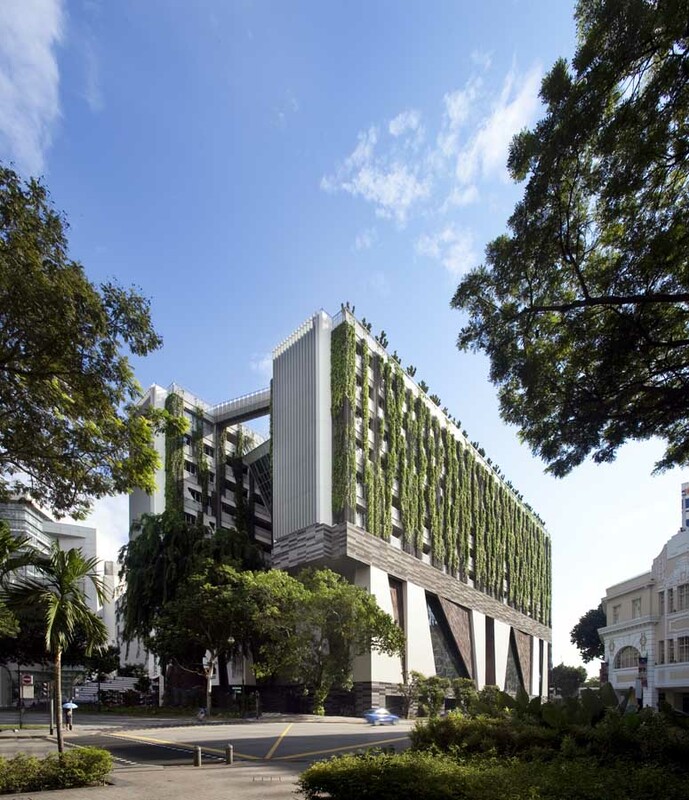 Using a double-skin facade, the building eliminates the noise of the main road and enables undisturbed contact with surrounding greenery. 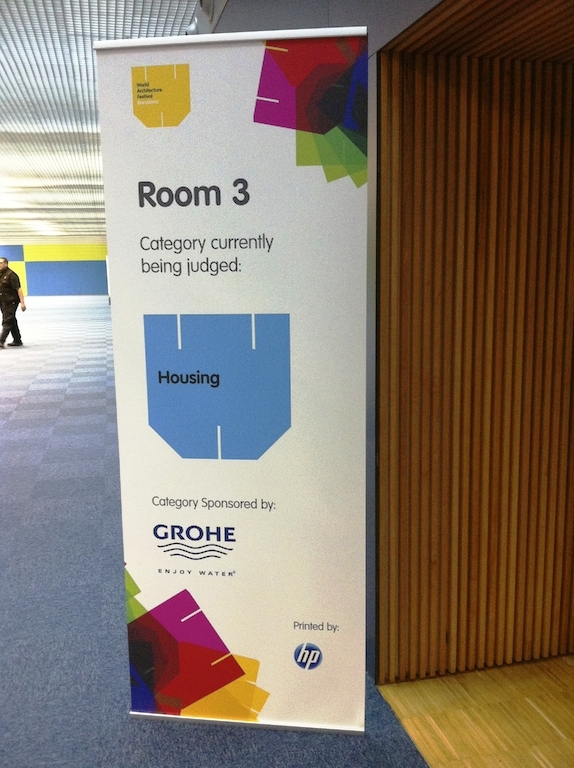 A sand-coloured social rent housing development classified with the “THPE” French label (very high environmental performance). 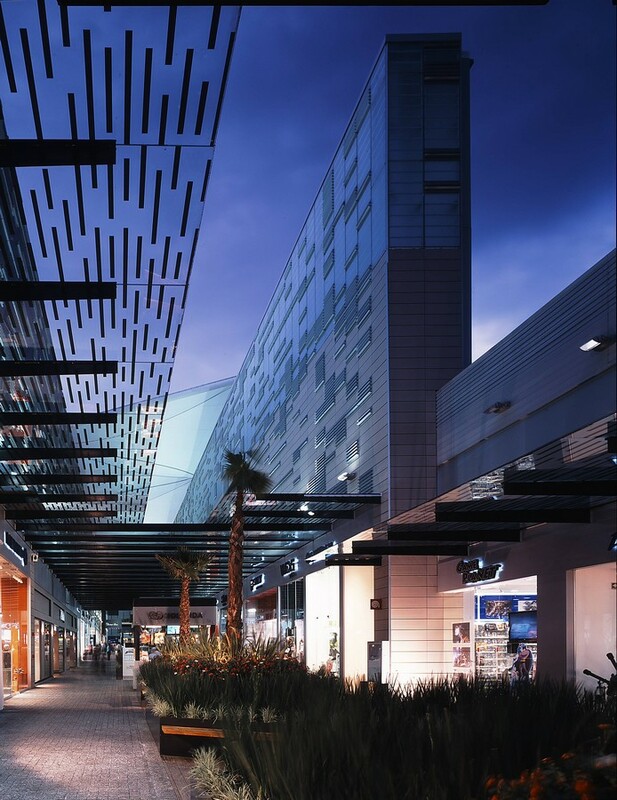 The windows use a store as sun protection and the vegetal roofs are made of a complex which increases the thermal inertia of the building to sooth temperature variations. 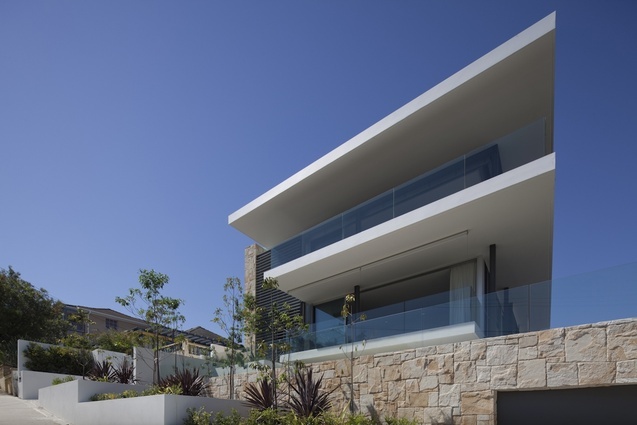 A residential development built to mimic the side of a hill, varying in height of up to 8 metres between the rear and front. The basement car park can be gravity drained and the substation is tucked into the basement, giving the ground level more space for communal facilities. 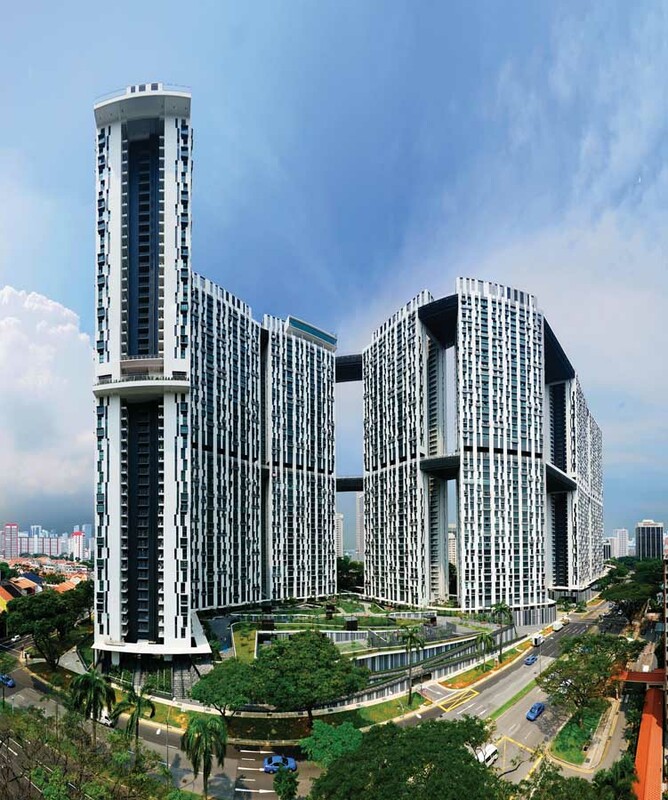 A 32-storey residential tower divided into six squares which are elevated to 60-foot cubes. 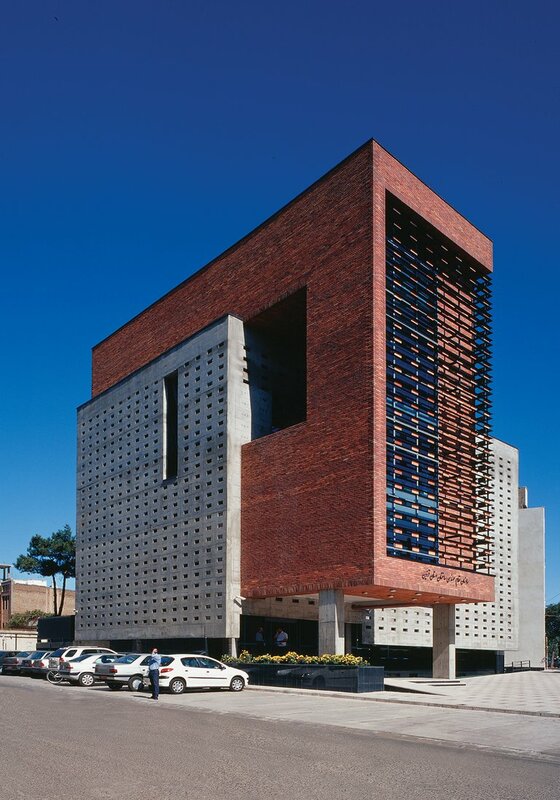 The cubes are adorned with brick facades, expressed as curtain wall, with alternating glass slots that demarcate the cubes. Four semi-detached, three level town houses adorned with curvilinear facades. 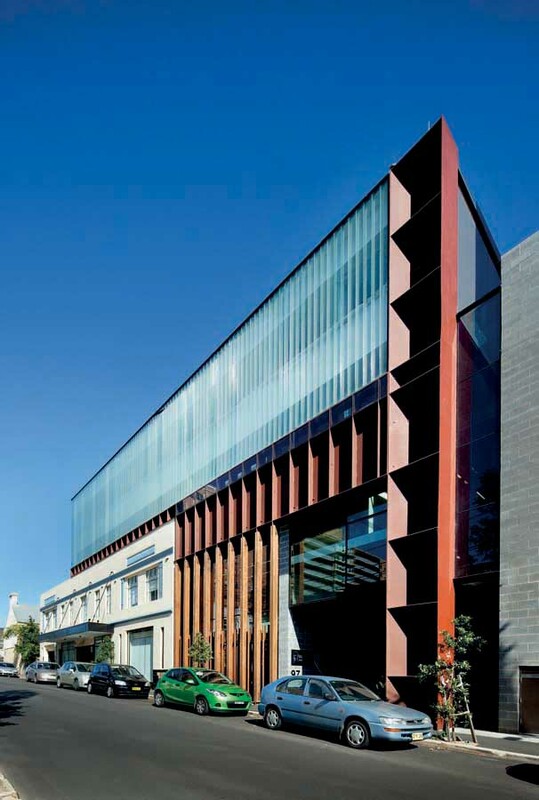 Designed to integrate a contemporary architecture successfully into an existing historic urban fabric. 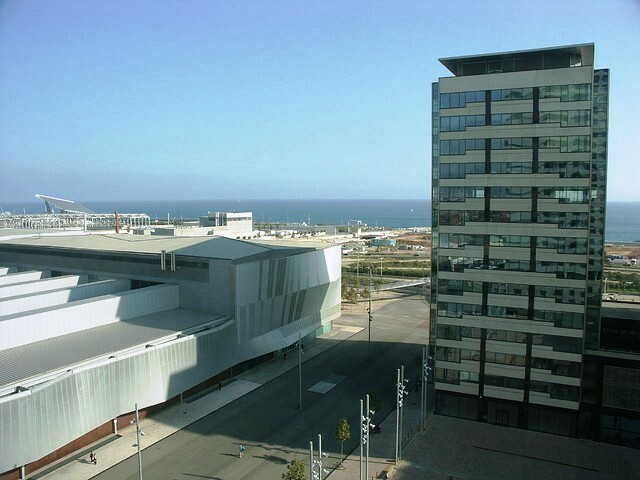 Student accommodation situated in a new eight-level, environmentally-friendly building, complete with three lecture halls, a library, an internet lounge, and rooftop terrace with kitchen and cafe. 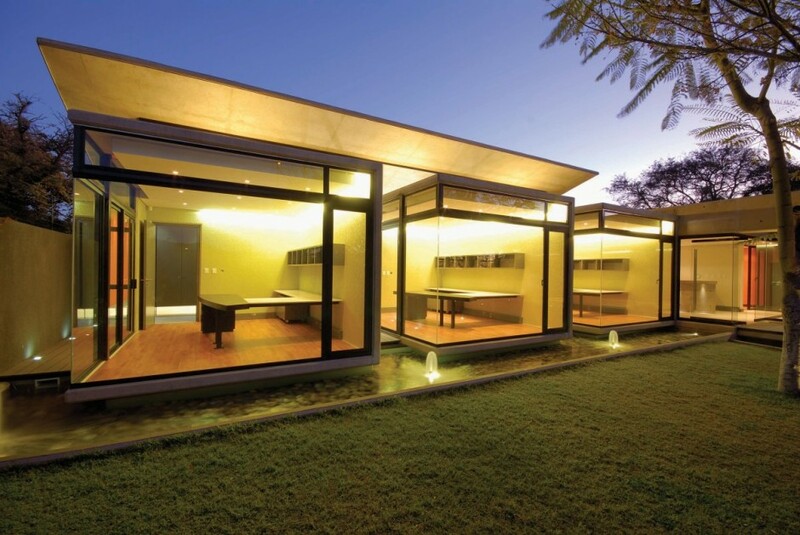 The design allows light and ventilation into each bedroom. New housing development comprised of 48 green family houses and 37 small apartments, balancing family dwellings and green space. 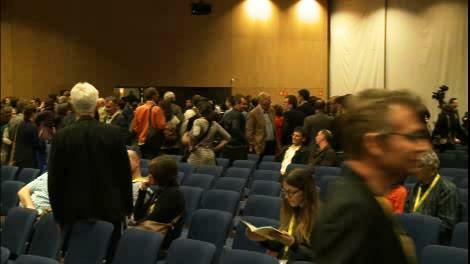 Every house is a private property, all other functions are shared to enhance social cohesion. 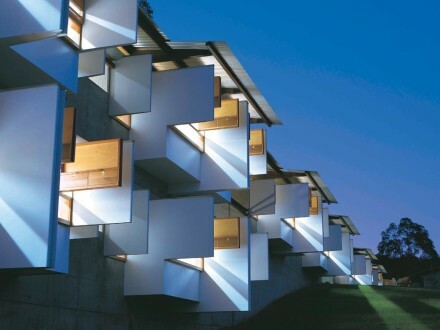 Re-development of university campus, bringing art to the landscape, enhancing the campus grounds and providing it with a cultural focus. 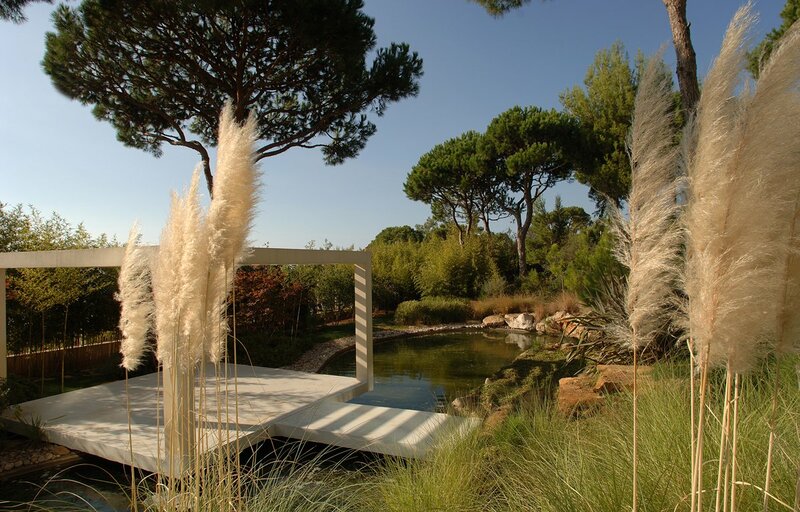 A landscaped garden, integrated into a hilly, pine forest landscape, which incorporates a variety of themed gardens, patio, and infinity pool. 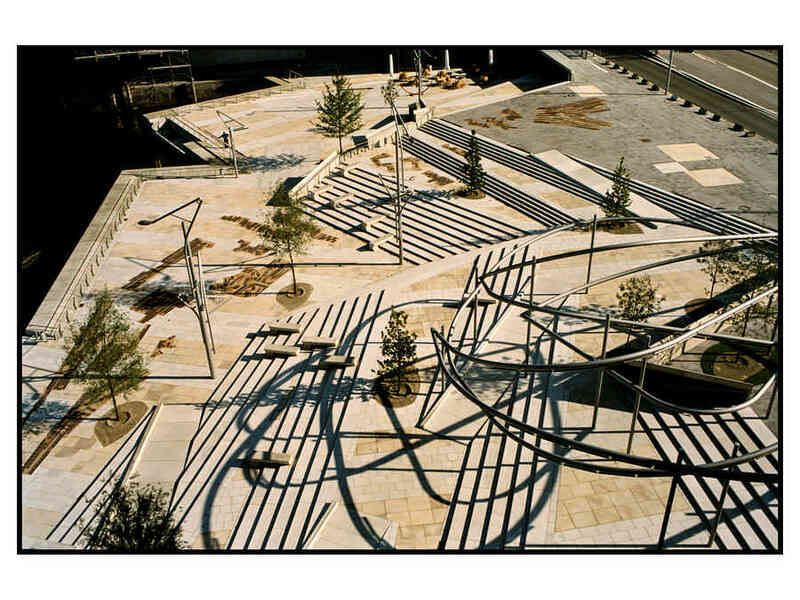 Transformation of a former working harbour and light industrial zone into a public landscaped area with development scope for inner city functions such as residence, work, culture and leisure. 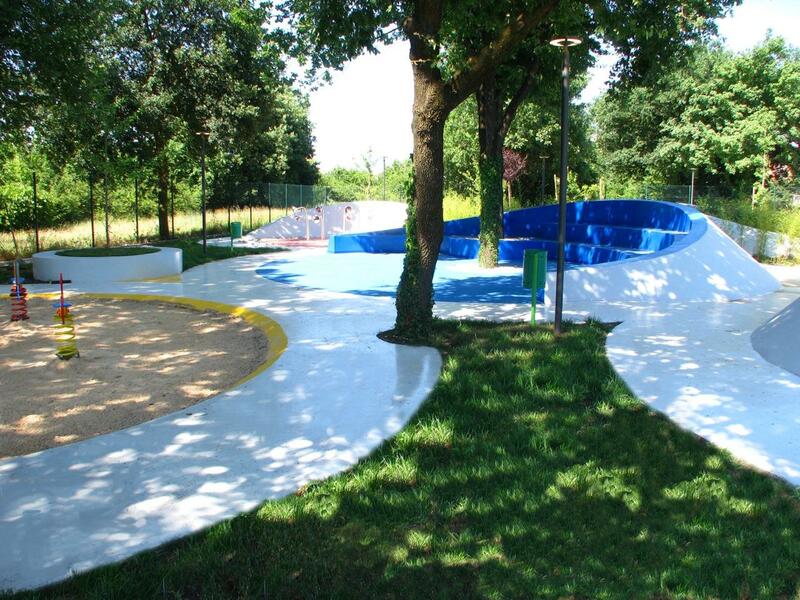 A recreational space in the residential district of Corso Lazio in the city of Frosinone. 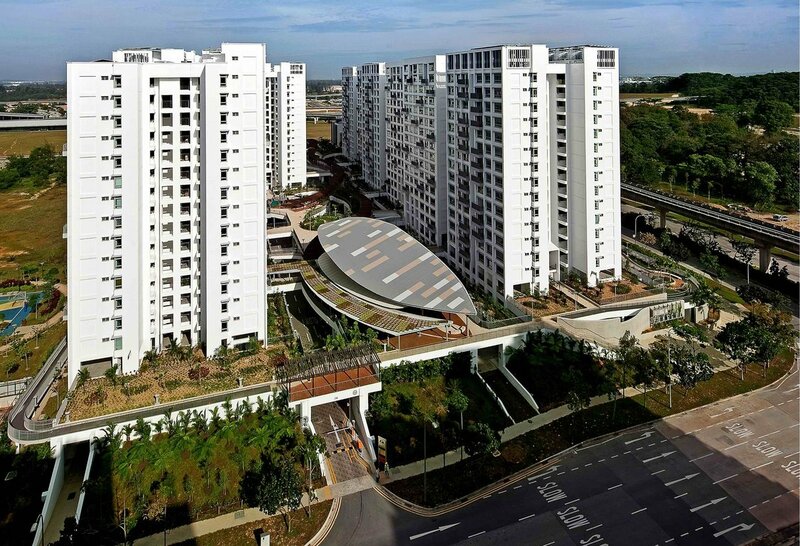 A public housing project which promotes green buildings, Treelodge delivers sustainable living accommodation in a landscaped environment with playgrounds, outdoor gym and communal gardens. 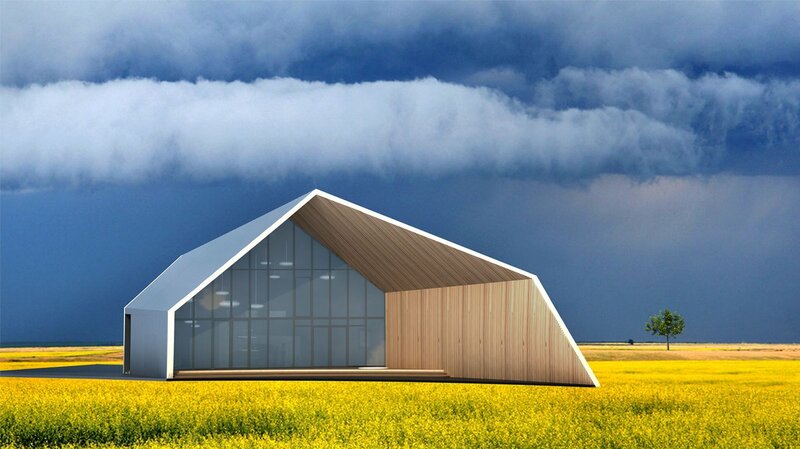 Semi-autonomous sauna, Estonia, Architectural Bureau Pluss, Estonia A sauna/steam room facility designed as a standalone structure which complements residential dwellings. 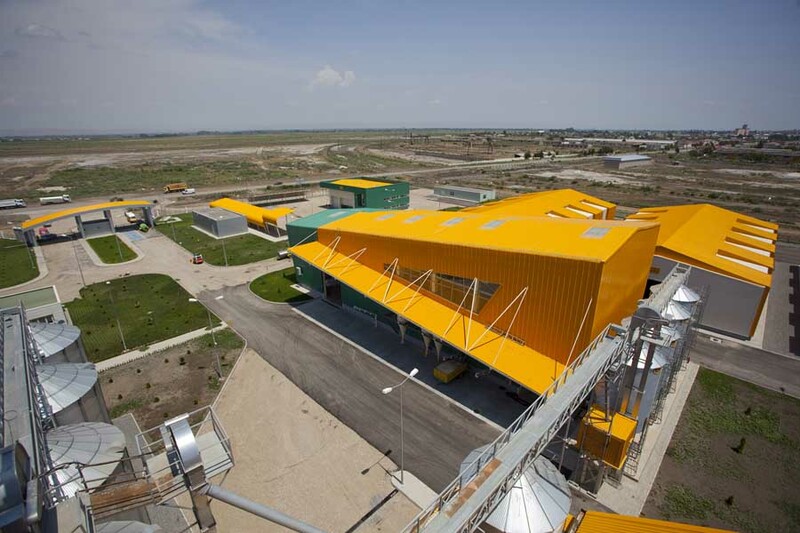 Transformation of a former garbage dump and sewage drainage facility into a ecological landscape and habitat for native biodiversity, integrating pedestrian and cycle paths for recreation and commuting uses. 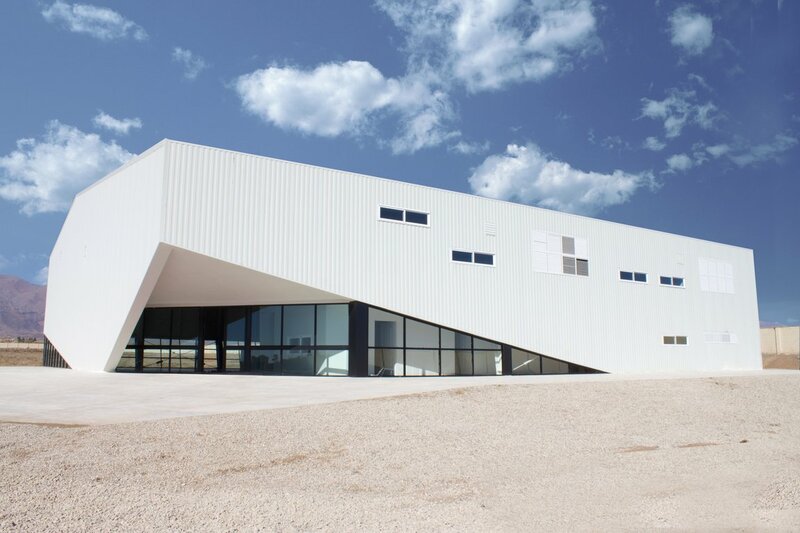 A workshop building dedicated to technical teaching about motors and vehicles which requires large spaces and high ceilings. 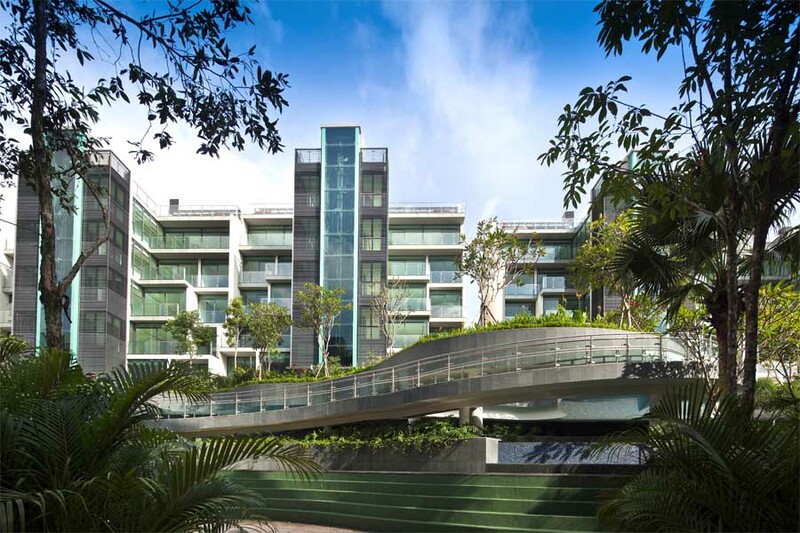 Located at the boundary of the park, the building blends with the landscape using a wavy design for its vegetated roof to produce varied curves and a low height. A vocational training centre and community building in one of the most unprivileged communities in Cambodia built to teach impoverished families skills to earn their own living. 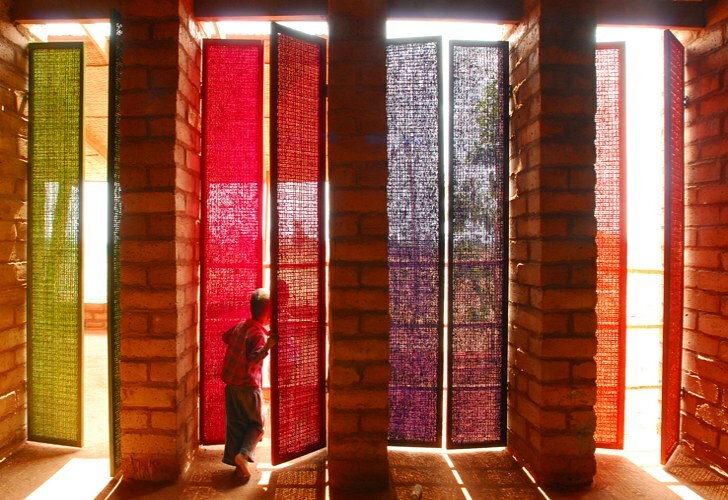 The handmade school is made out of local materials and using a local workforce. A new digital design and media building located next to The O2, London, centred around two interconnected atria. 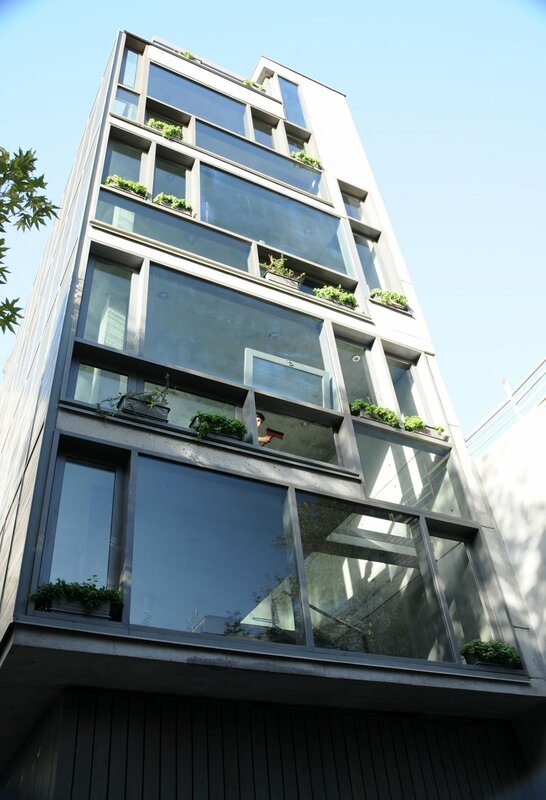 The external facade consists of gothic rose windows and flower designs achieved using tiles and circular windows. A nursery on the border between a former industrial development and a small forest where new housing is developed. 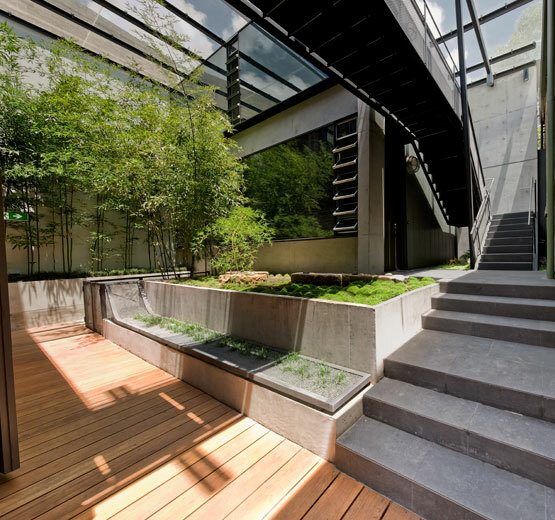 A semi-enclosed courtyard and an organic layout encourage movement into challenging shapes. Windows are freely placed at different heights. 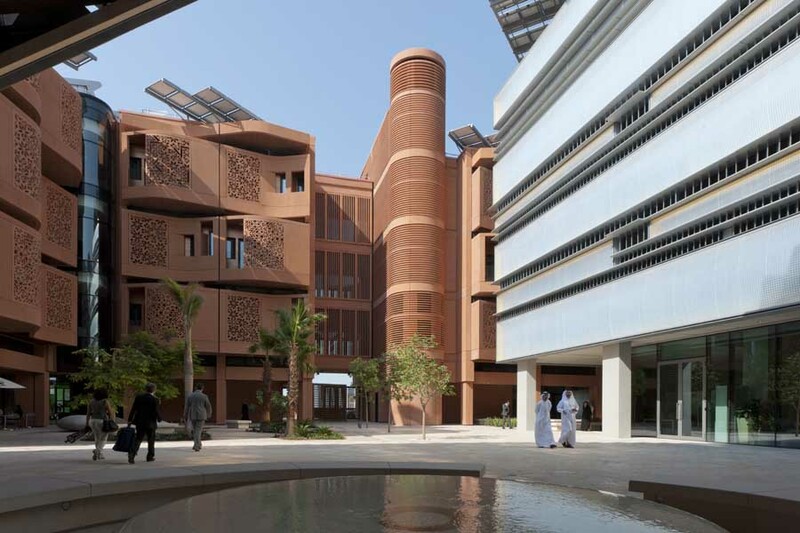 The first building of its kind to be entirely powered by solar energy, this campus features laboratories, residential accommodation, meeting areas and landscaping throughout. 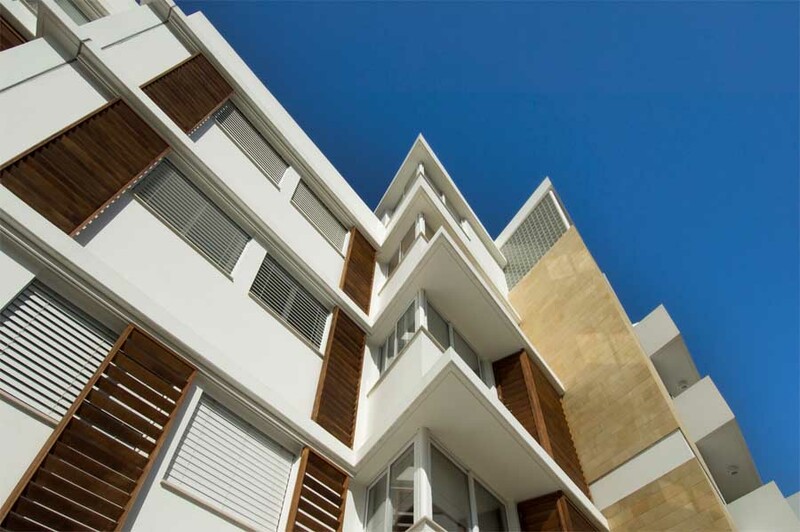 Buildings and residences are designed to shade adjacent buildings and paths. 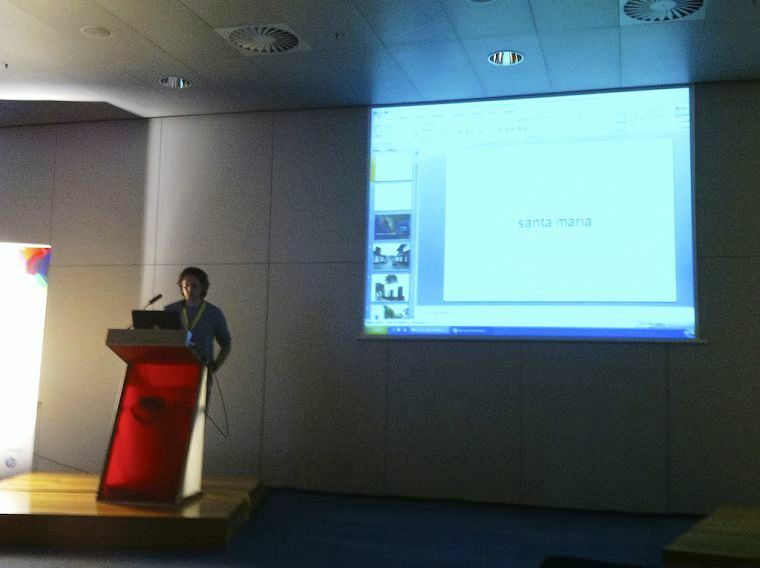 A centralized building with the purpose of supporting laboratories used in a range of research programs. 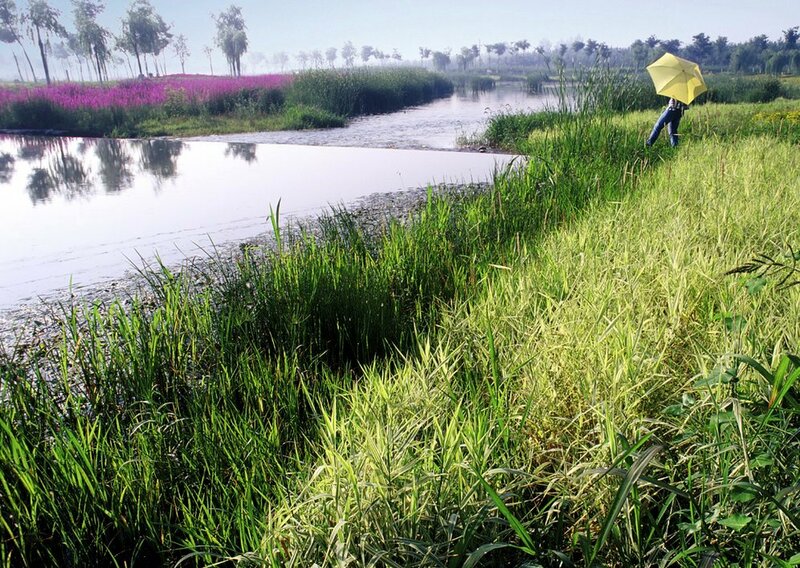 Located on the edge of the campus and surrounded by farmland, integration was key and it was built using a step structure in direct reference to the terraced fields. 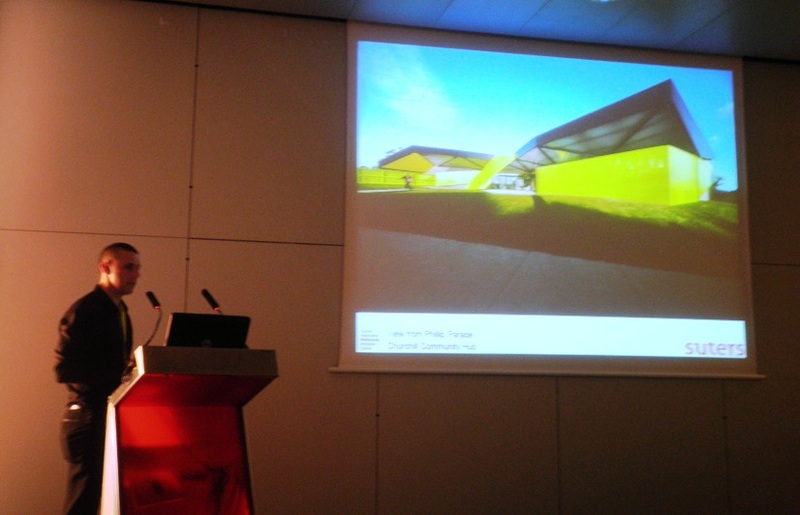 A workshop facility for training in construction, manufacturing and electrical sectors under a trcoloured rolling roof which rises and falls to create light in the building. 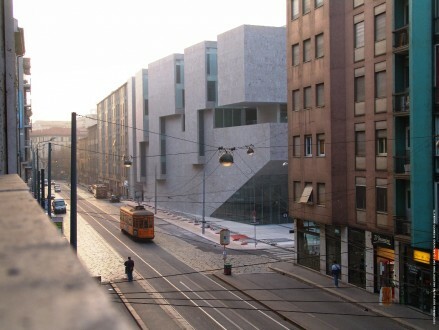 Two buildings of an art school are made from varying materials and appear as a collection of buildings stemming from a central path. 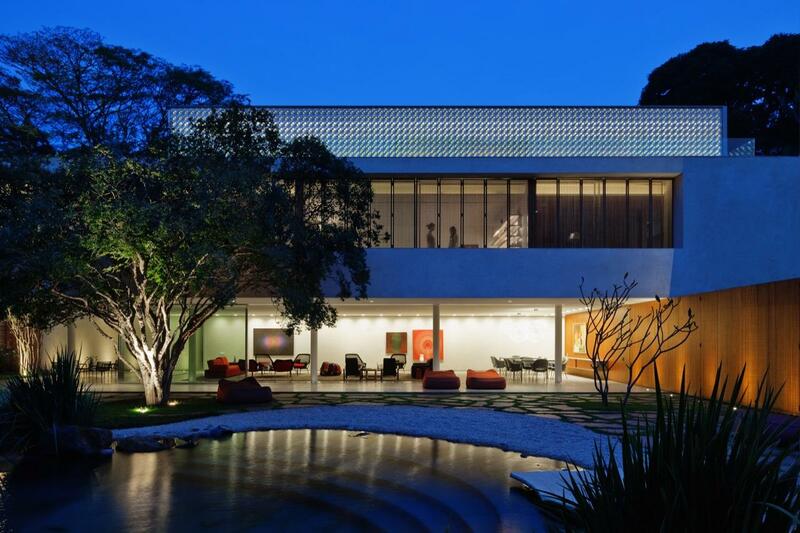 The design includes a landscaped quadrangle garden space. 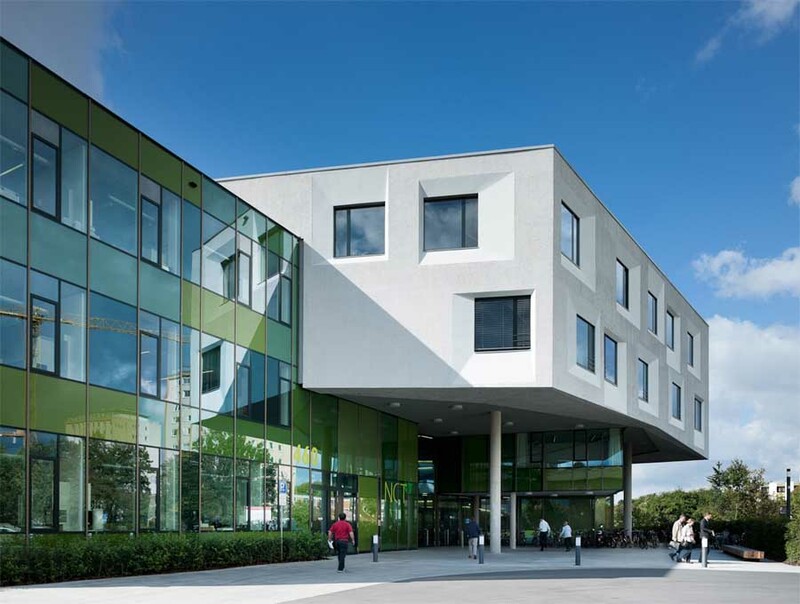 The latest building in a school campus features distinct views: a glazed ground floor maximises views of the city, whilst other classrooms open onto landscaping. 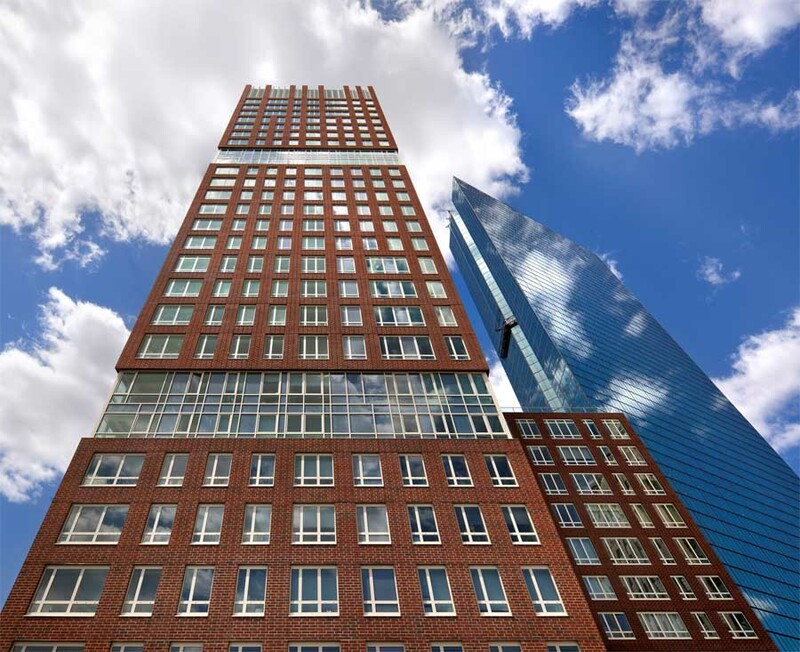 A chimney provides a source of light and ventilation whilst the main facade of the building is a vertical slice, clad in highly reflective bricks. 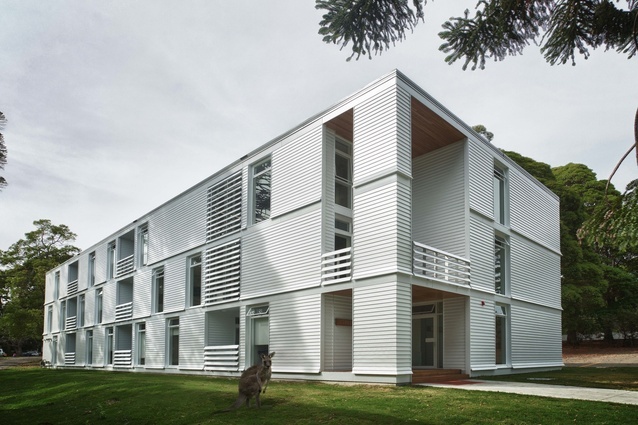 Two buildings within a private university provide new classrooms alongside outdoor space. 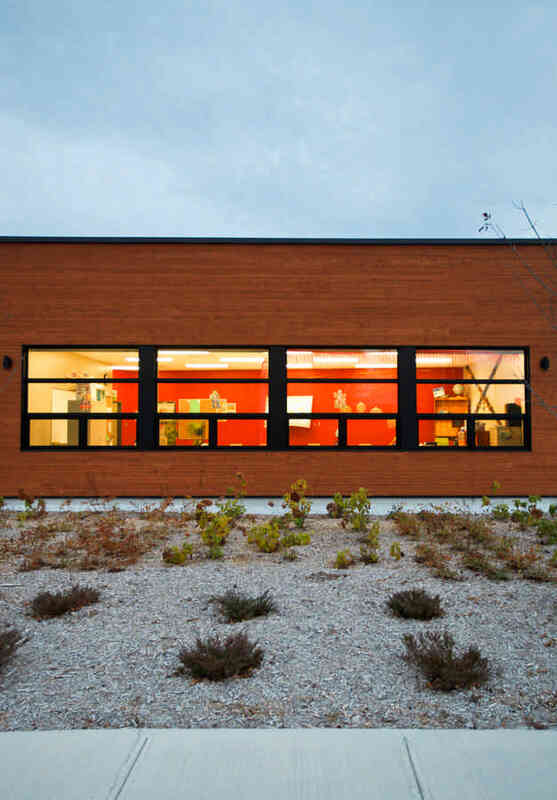 Two keep the surrounding building’s individual functions, two buildings of classrooms were created instead of the original idea of just one. 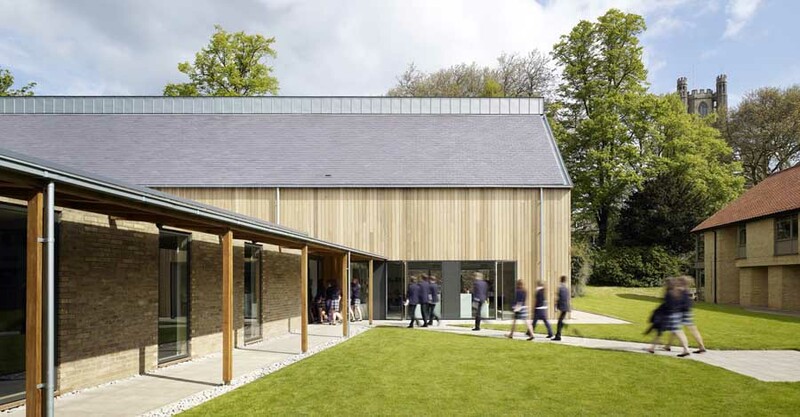 Extension of an existing creative arts studio and a new art building which represents traditional barn buildings with simple forms and high ceilings to maximise natural light. 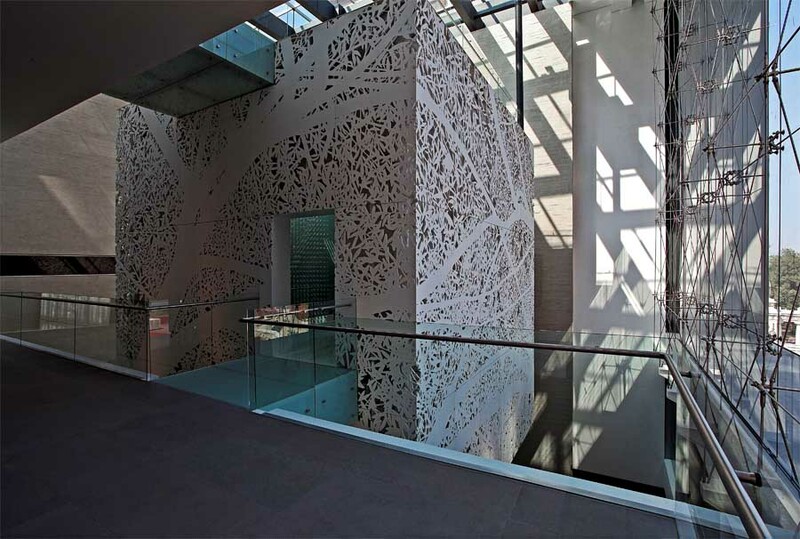 The new building is sensitive to neighbouring listed buildings and features materials that reflect its surroundings. A complex for the accommodation of infants and toddlers, where they are creatively engaged and develop skills. 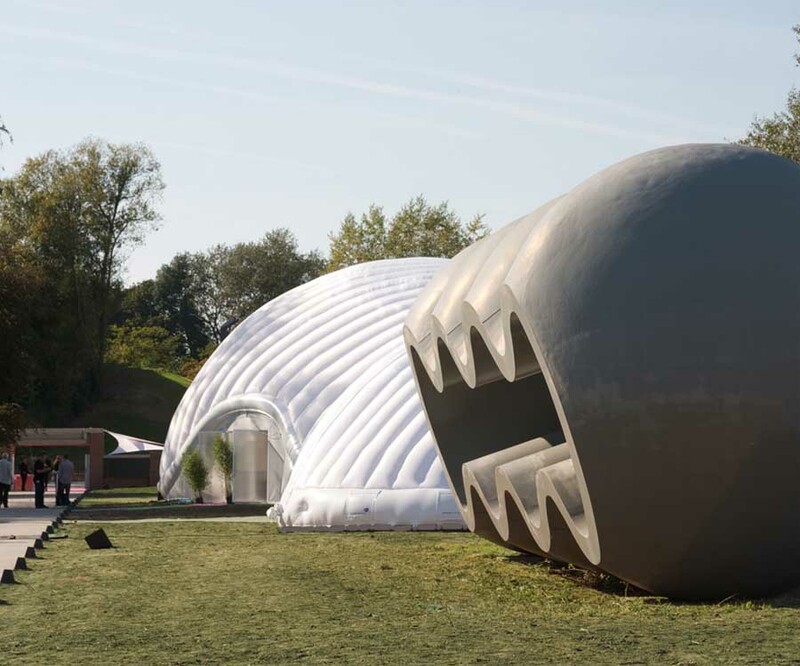 Inspired by the memory of the cocoon as the space that carries life, the buildings include accommodation, spaces for creative and educational activities as well as outdoor play areas. 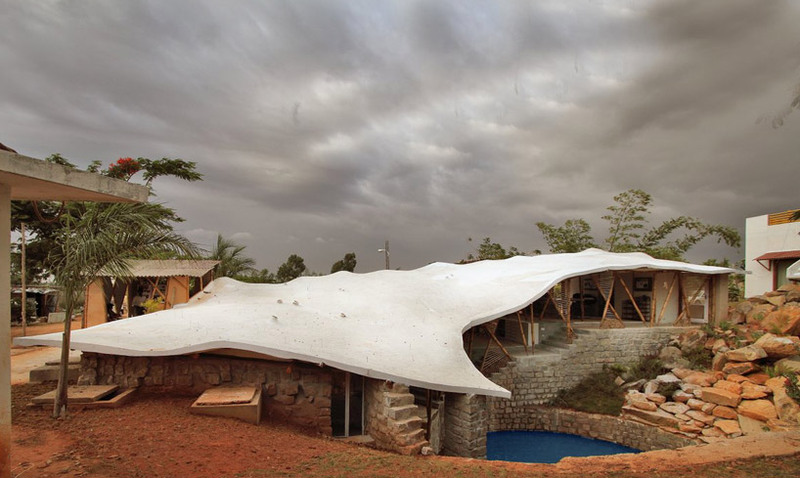 Fluid forms and carved underground spaces with green roofs surround a basin from which organic forms emerge. 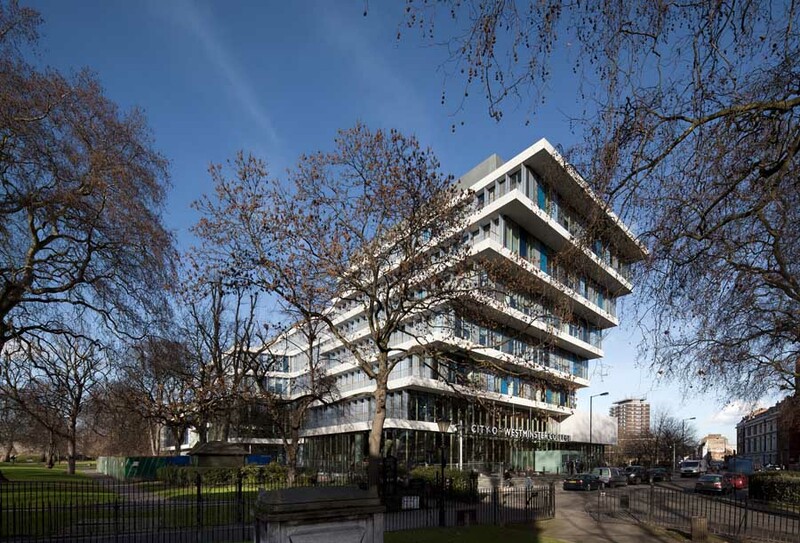 The new flagship Campus for City of Westminster College is designed to support new ways of teaching and learning. 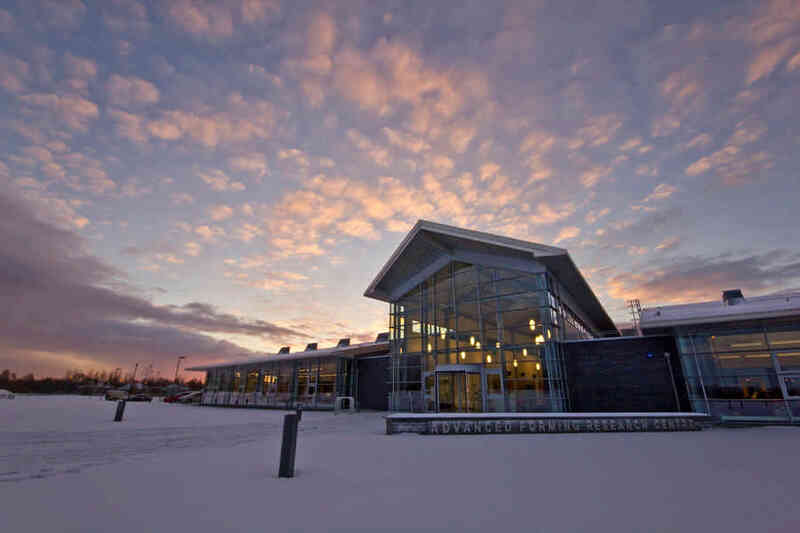 Designed from the inside out, it is a clear-cut, modern building with a distinct Scandinavian heritage. 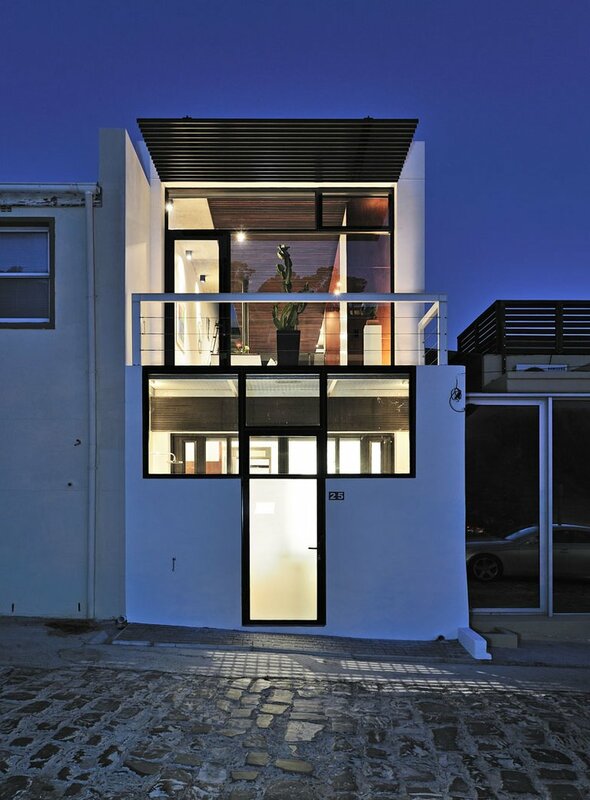 Simple geometric forms rotate around a terraced atrium. 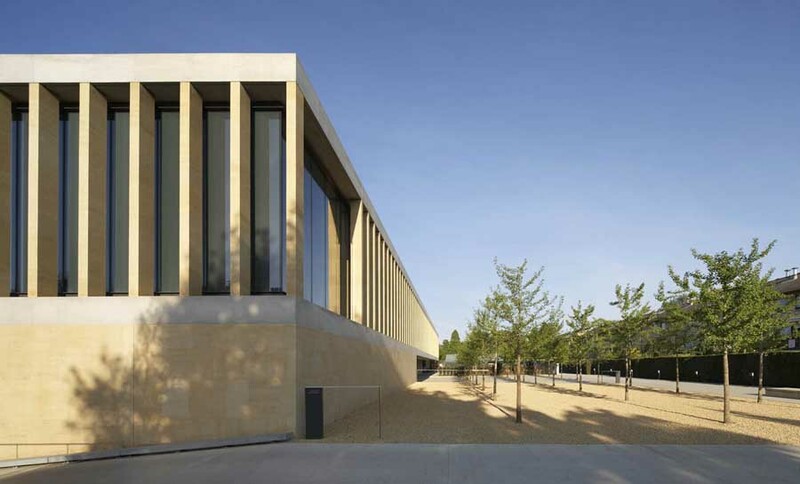 An 11,000 sq.m science research centre set in the University of Cambridge’s Botanic Garden. It responds to its landscape surroundings by being rooted in its setting: it features two visible stories and one subterranean area. 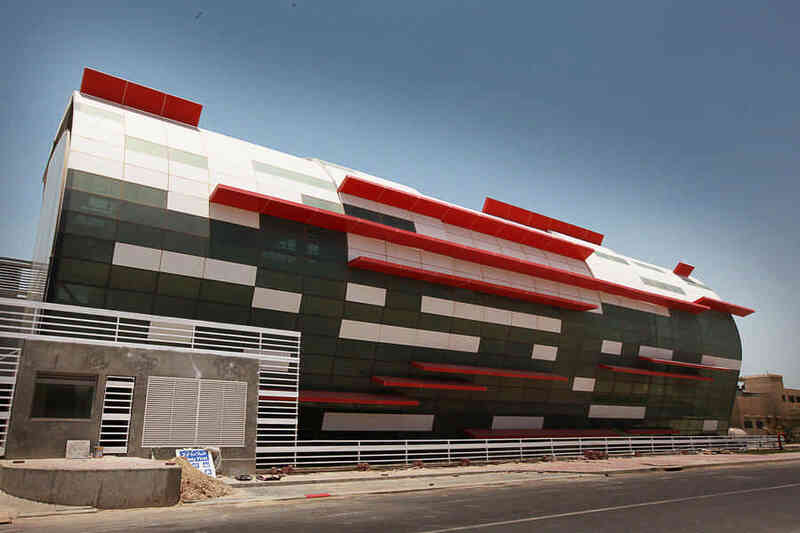 A 55,000 sq ft research centre for a federation of more than two hundred institutes, corporations and academic programs. 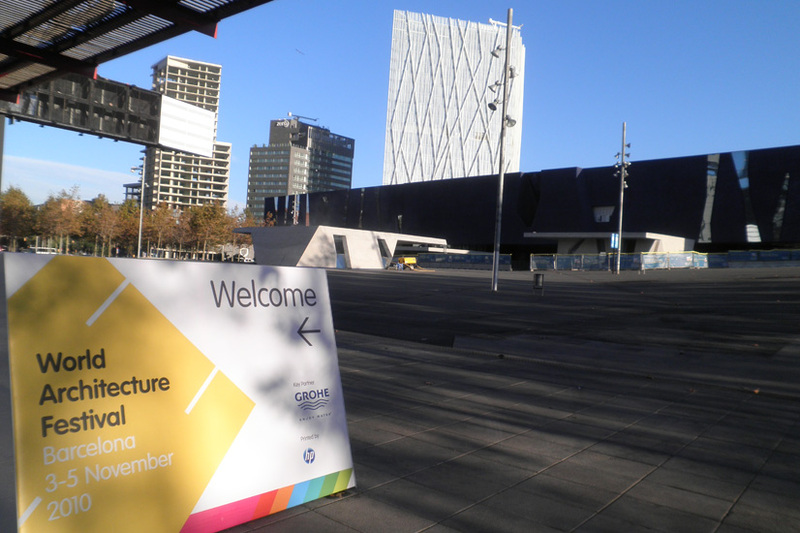 The building anchors the corridor connecting the city centre and the university campus. 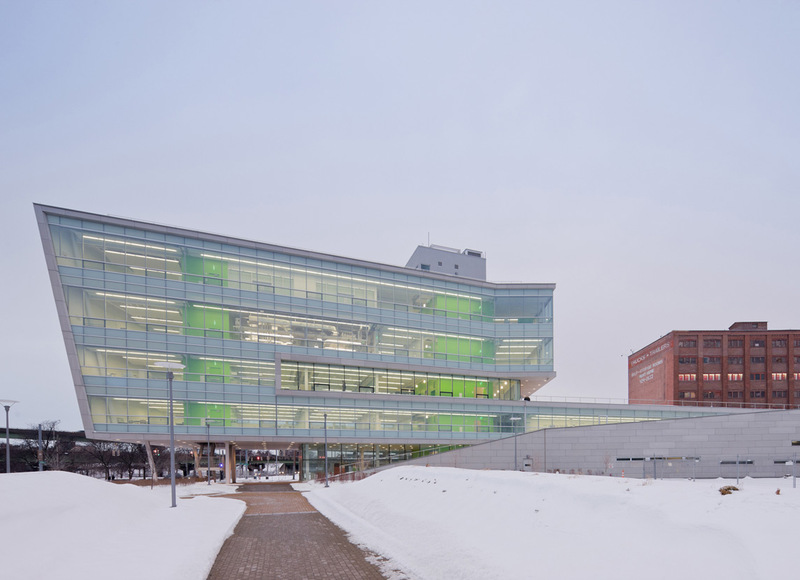 The laboratories are organized along a circulation path that acts as a gallery, creating an open and inviting architecture to draw the public to the site. 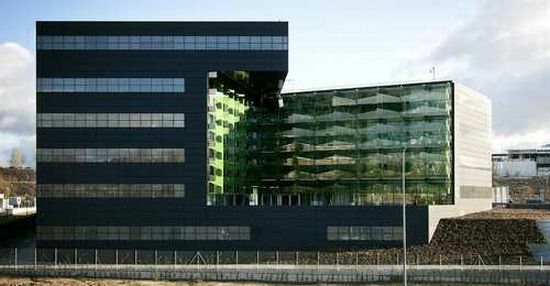 A cylindrical building amongst Lindholmen’s big office complexes that looks different from every angle. 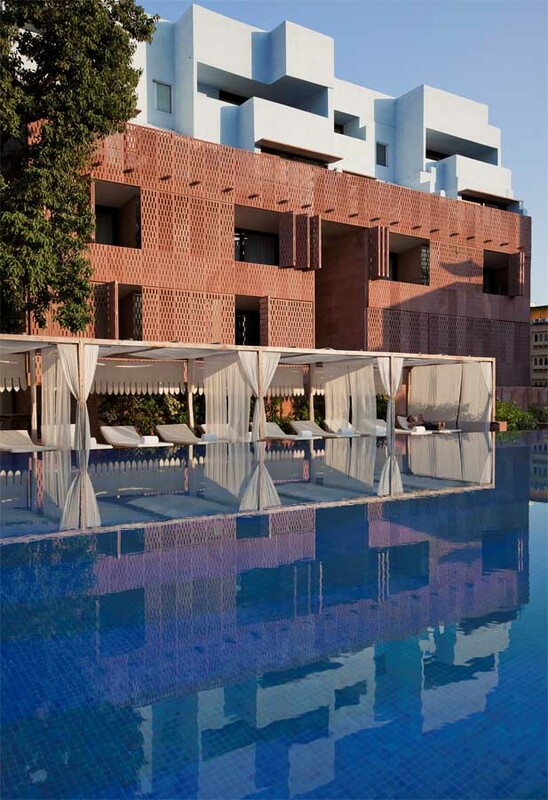 A brocade of glazed terracotta panels takes on different appearances depending on our viewing angle and the changing daylight conditions. 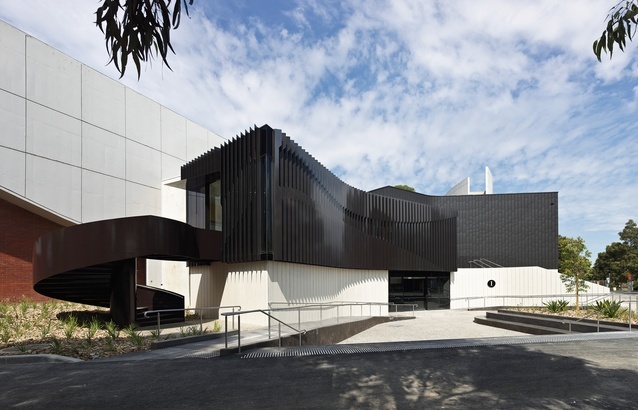 A 250 seat auditorium nestled amongst existing lecture theatres that serves as the centre piece of the learning facility. 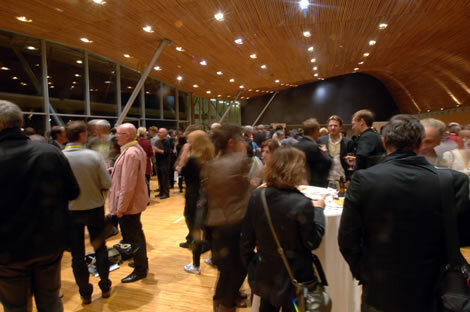 The auditorium features a concave foyer and a sunken courtyard. 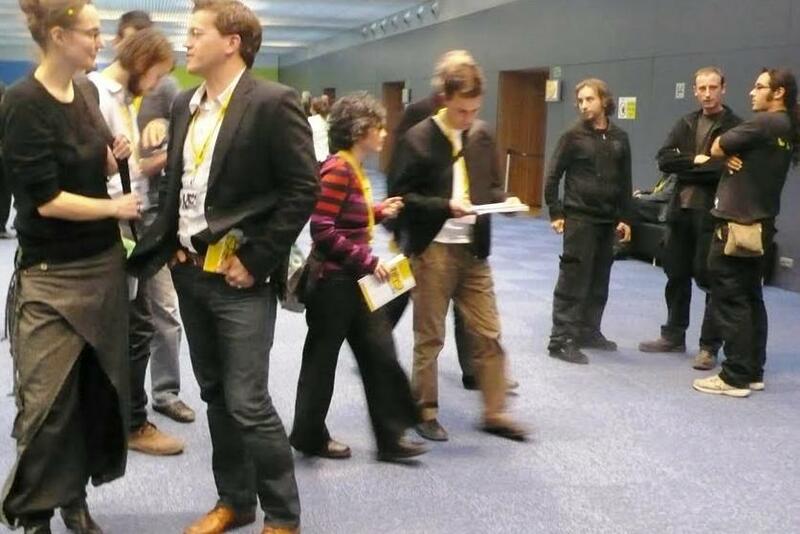 It is concave in plan and is connected to the rest of the building via two sculpted staircases. 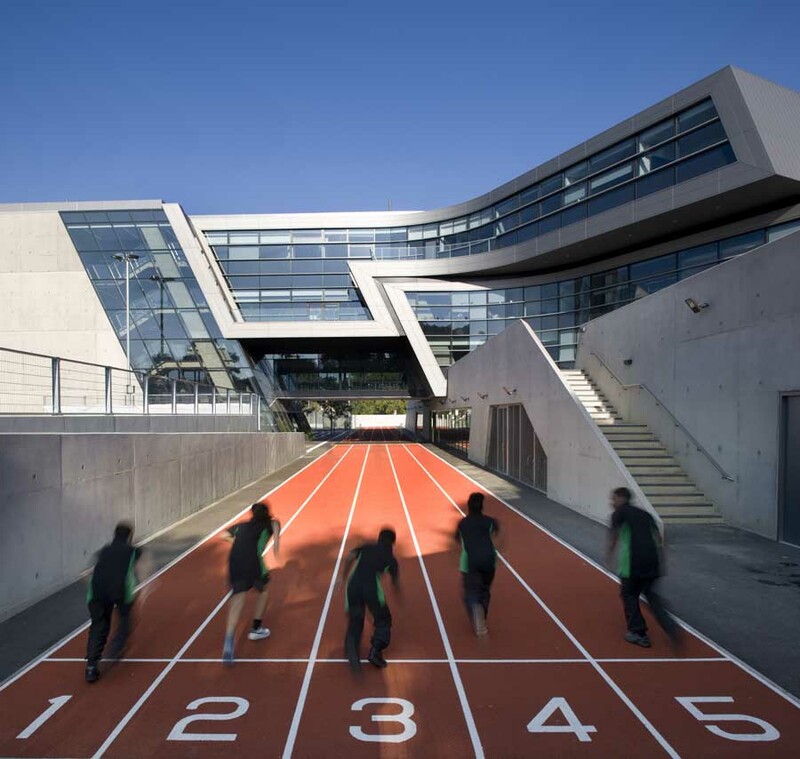 Embracing a ‘schools-within-schools’ principle has led to the creation of four smaller schools at this Acedemy, each with a distinct internal and external identity alongside communal indoor and outdoor spaces to encourage social communication. 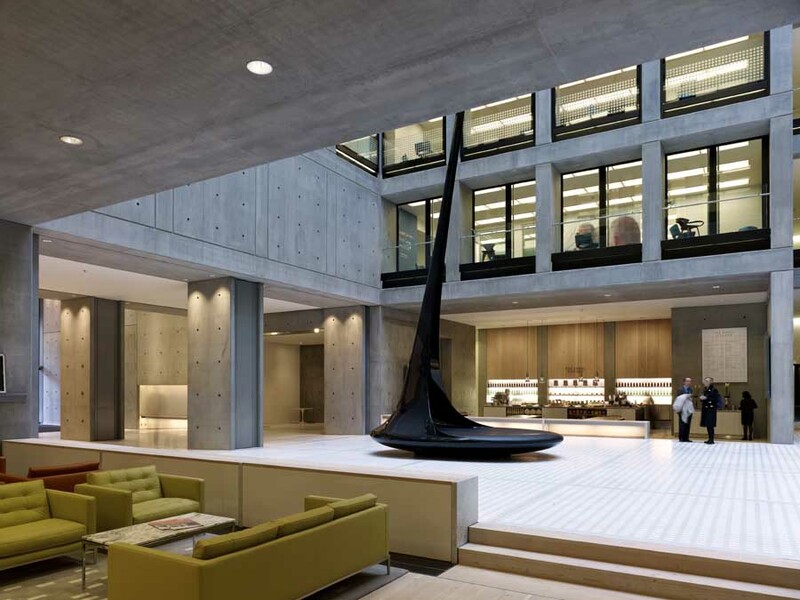 A two story building and its courtyard, both positioned next to a listed building, were transformed to provide commercial floor space and a central glazed secret- garden atrium that is surrounded by the adjacent listed building’s brickwork. 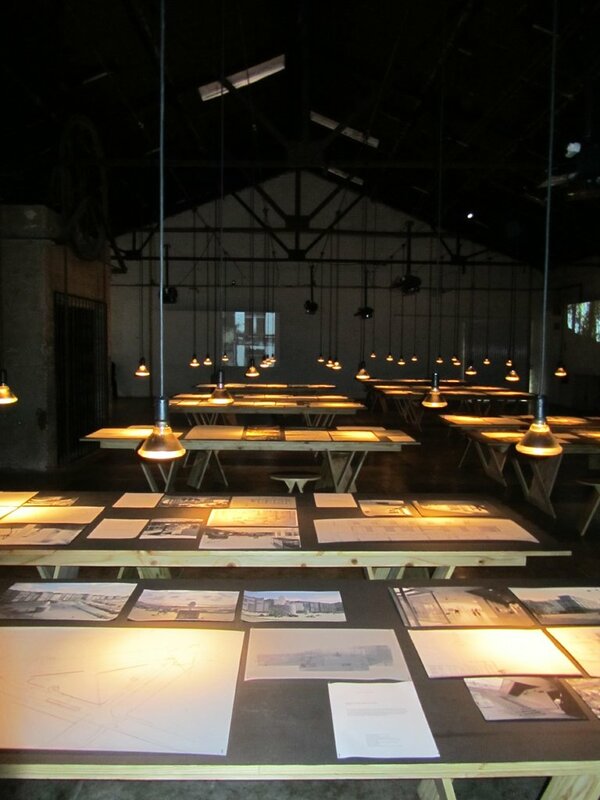 A renovation of an old vacant house to create a venue for arts and dining based on a rural island in Western Japan. An open kitchen was designed, the warehouse was refitted into a gallery and extended awning around the trees created an outdoor theatre. 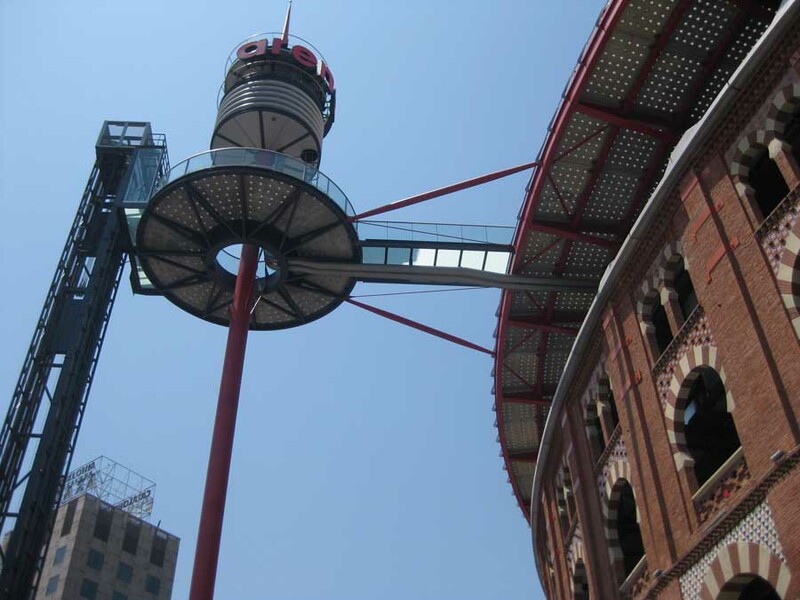 A former bullring in the centre of Barcelona was restored to preserve it as key feature in the area whilst still preserving the ‘red drum’ aesthetics that have made it an iconic piece of Barcelona’s landscape. 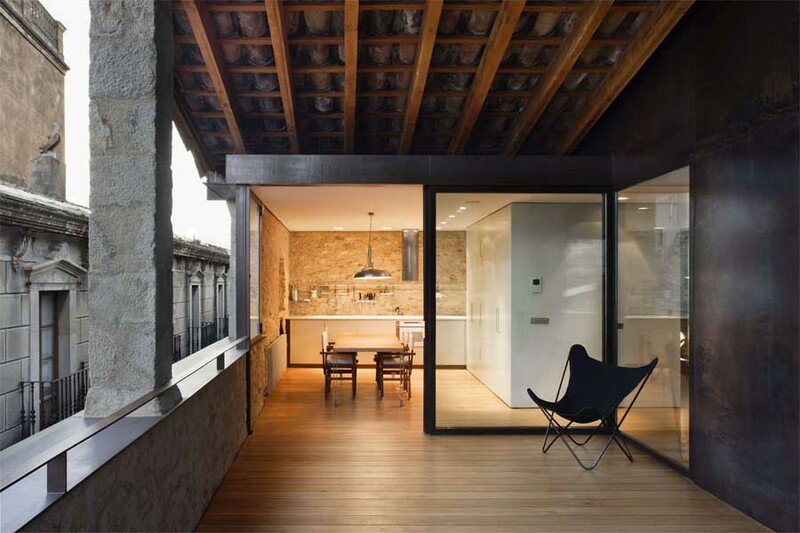 A 16th Century building situated inside the original city walls of Girona, Spain has been restored to form 2 apartments with courtyards and a roof terrace with views across the city and of the cathedral. 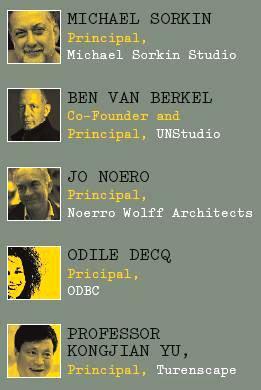 Transformation of two buildings from light industrial to work, exhibition and recreational spaces for creatives. Centred around public gardens, one of the buildings has a viewing tower which looks across the city. 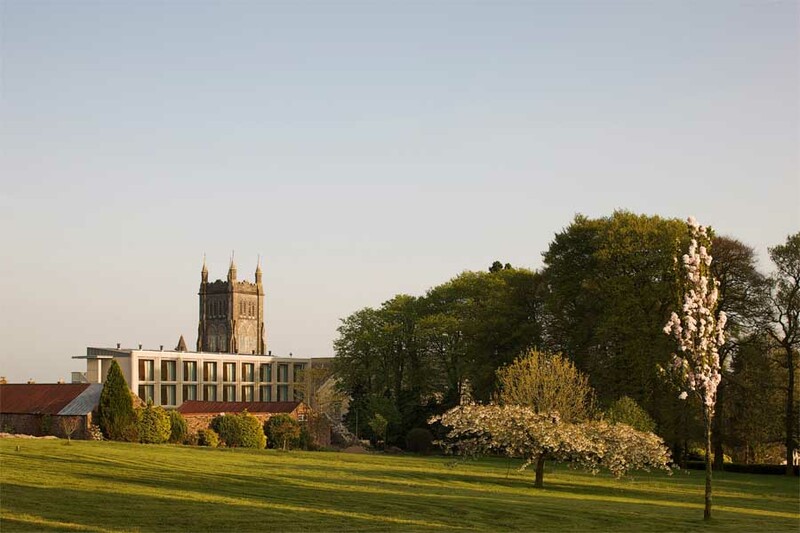 A functioning monastery of Cisterian monks required a new accommodation wing to restore a sense of community whilst providing basic comforts for the elderly residents. 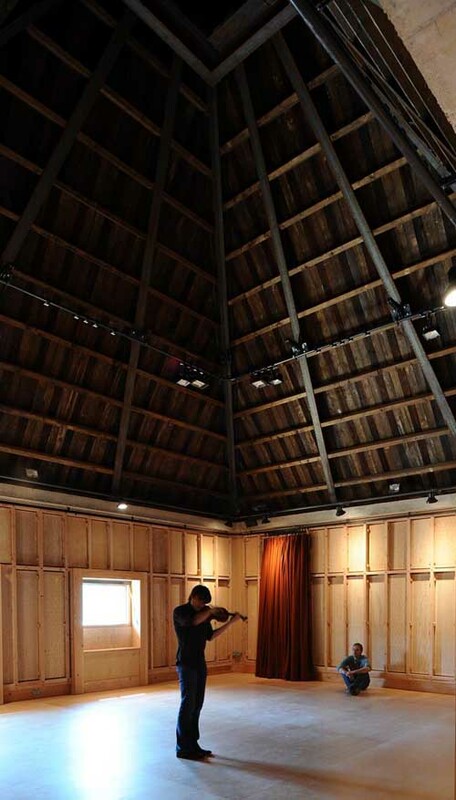 Snape Maltings is a large complex of Grade II listed industrial buildings from the 19th Century which have been converted into residential and retail use as well as extending the concert hall in the middle with minimum physical change to their appearance. 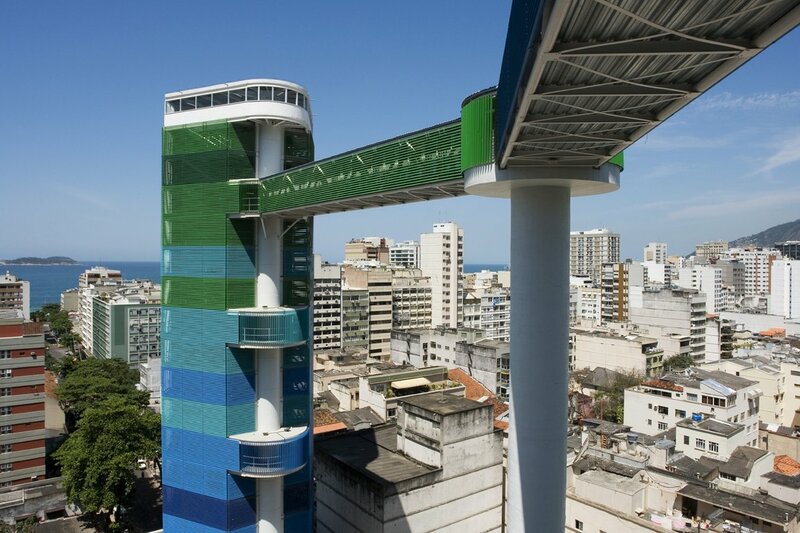 A blue and green access tower between General Osorio subway station and residents of the city living on a slope 80m above ground level. 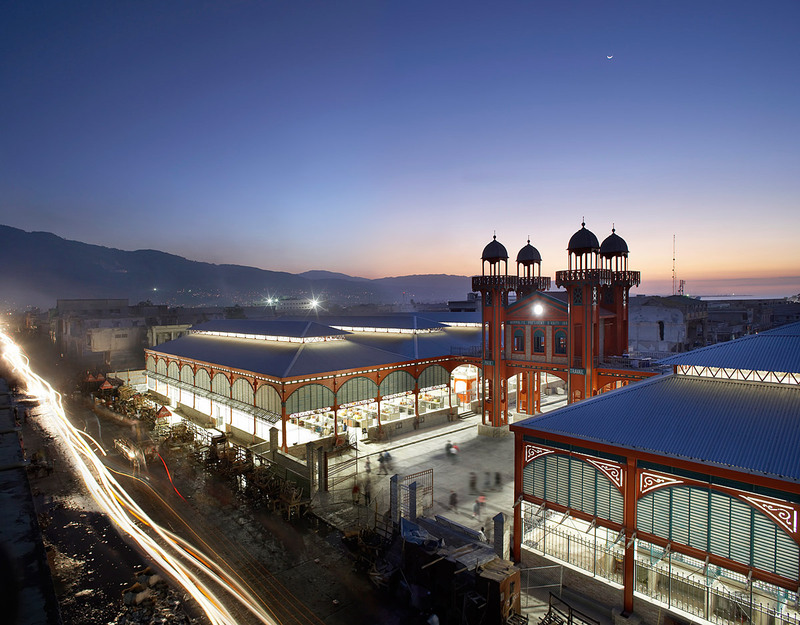 The restoration of The Iron market which is an iconic part of Haiti that was devastated by a fire in 2008 and the 2010 earthquake. 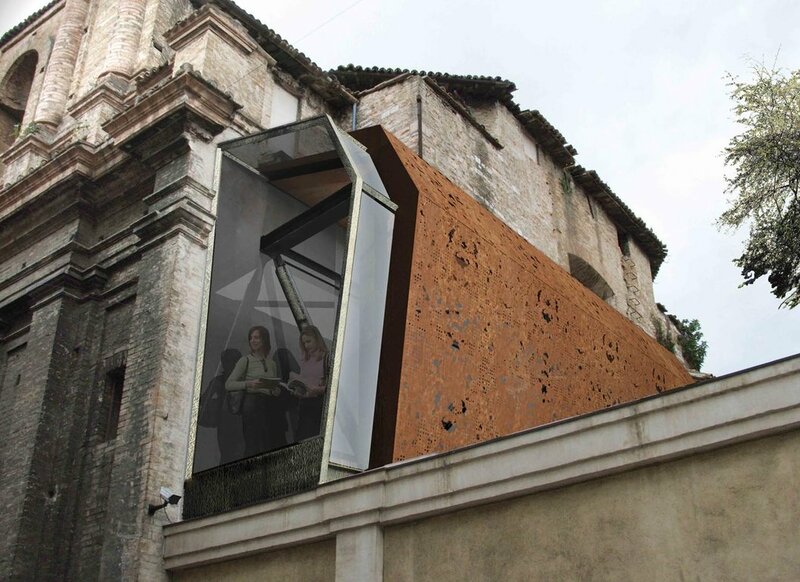 Original materials were salvaged to repair all key details and restore the hub of the city. The city centre Stanislavsky factory has been regenerated into a vivid mixed use environment unique to the city and which encompasses offices, apartments and restaurants alongside landscaping which has encouraged birds and insects back to the area. The upgrade and expansion of the original 1960’s residential colleges at Yale University into small suites of rooms, renovated libraries and dining halls. A new sunken courtyard acts as a lobby between numerous areas and increases activity and movement throughout the buildings. 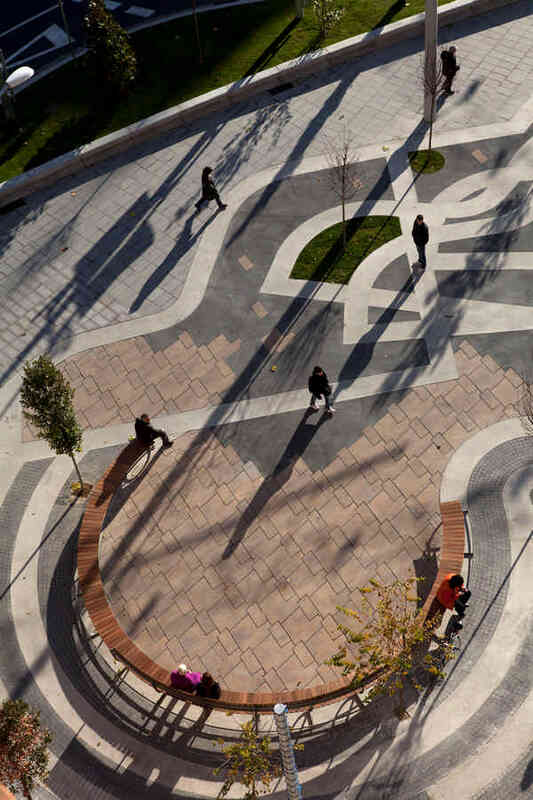 An open public space consisting of labyrinthine paths, a central green area of grass and mazes of trees and shrubs designed to pedestrianize the area and allow two residential streets to feed into the area. 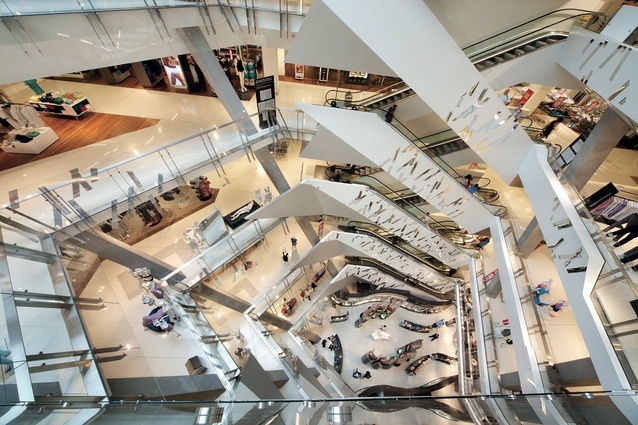 The redevelopment of an iconic Melbourne department store, Myer city store, includes a faceted roof sculpted with gold metal and glass, as well as a dramatic eight level atrium which starts at the ground floor and leads up to a diamond skylight. 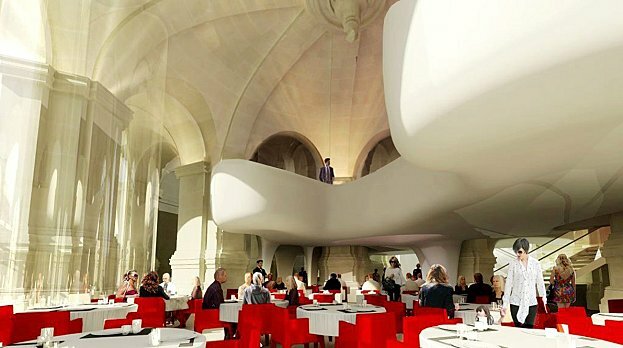 A new space in a historical building which seats 90 people has a facade of continuous glass and diners on the upper level are close to the original dome features. A cover for a patio in a nursery school for children to protect their play area from sun and rain, allowing all-weather play. The cover is shaped like a puzzle piece with gaps allowing light in. 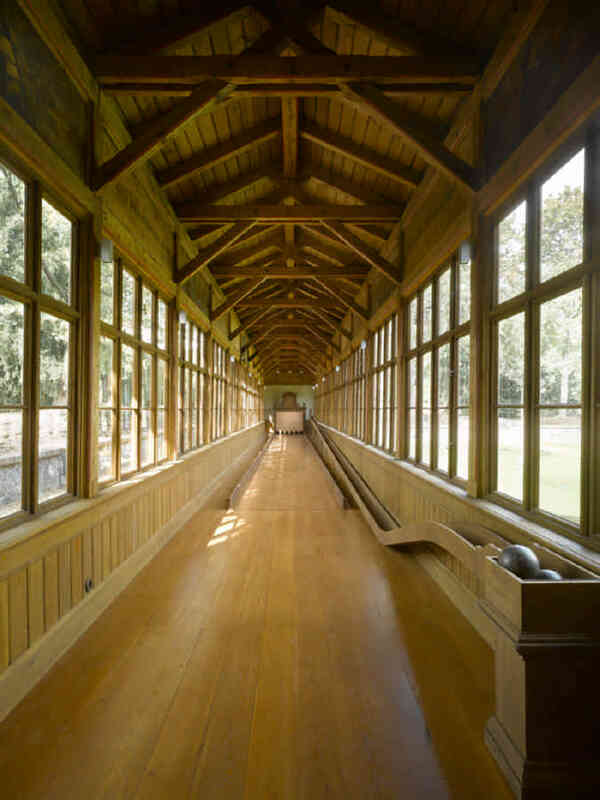 The restoration and extension of a pavilion, which originally served as a shooting range and skittle alley, and is now a cultural monument of importance. The restoration returns the building to its original appearance from 1888. The reutilisation of a building into a museum of contemporary art which features an octagonal entrance hall, exhibition rooms and a new facade. 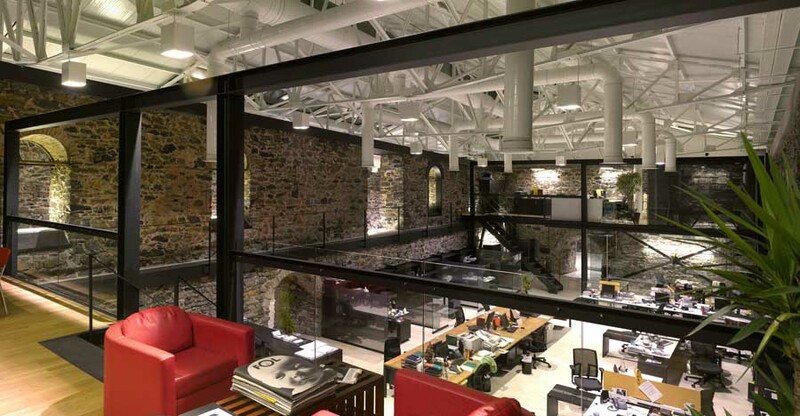 A re-invention of an unloved early 1880s commercial building on a historical site, designed to exceed the latest office standard and create a memorable and inspiring place to work by combining contemporary design and older architecture. 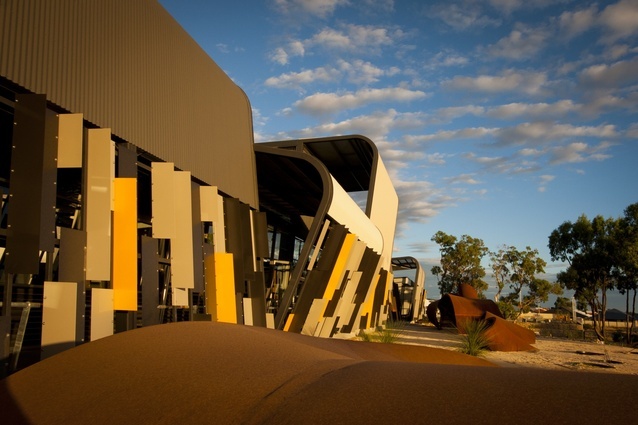 Office complex designed to provide two autonomous offices, for two brothers – a geologist and civil engineer – using an ‘absolutely no division’ policy. 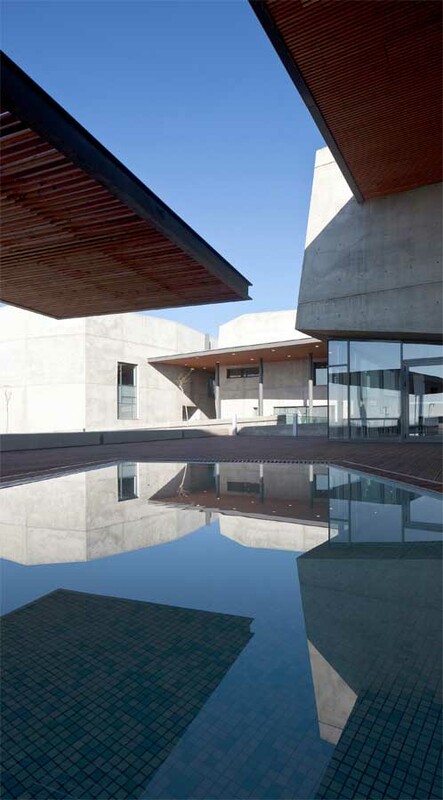 Located deep inside a residential area, the building structure is formed using exposed concrete and glass to fit in with the many surrounding provincial style homes. 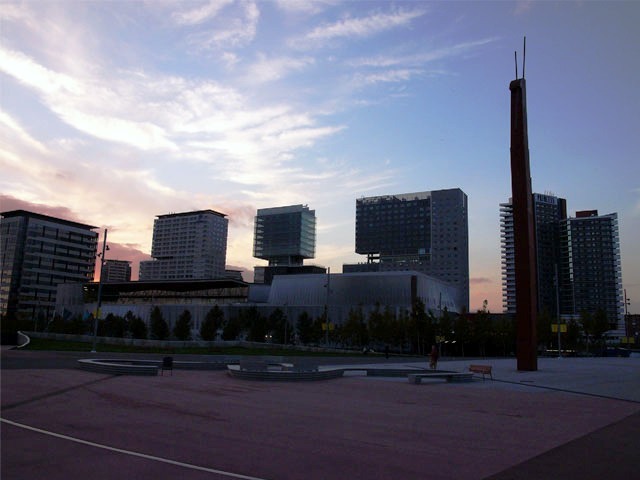 The unique building forms part of a complex business park in Barcelona. 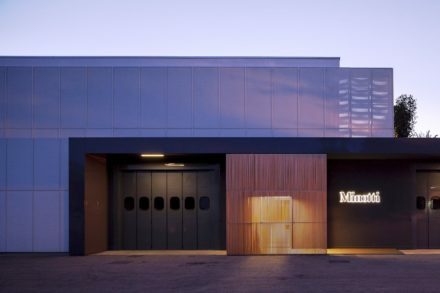 The building is set apart from its surroundings and makes full use of the spatial freedom whilst incorporating the old Can Tiana factory building, constructed in 1906. 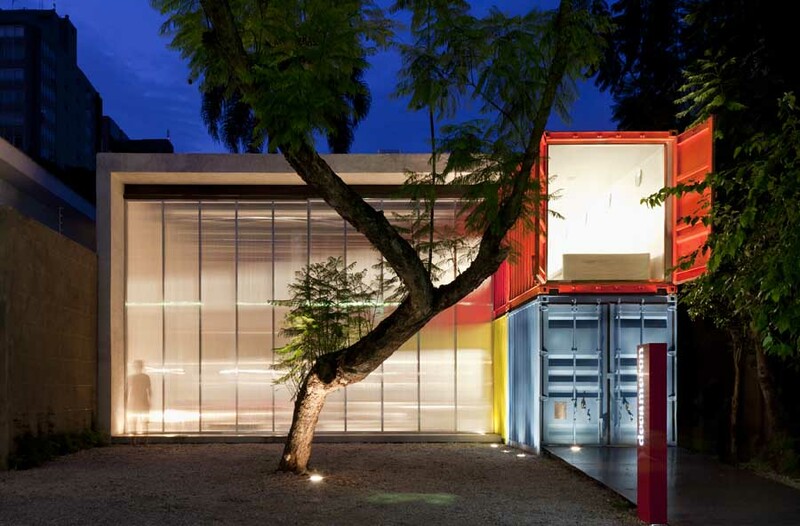 Located in 22@ – the experimental heart of Barcelona – the cube is inspired by the idea of a city,where knowledge, added value and patents matter and architecture is in sync with values. 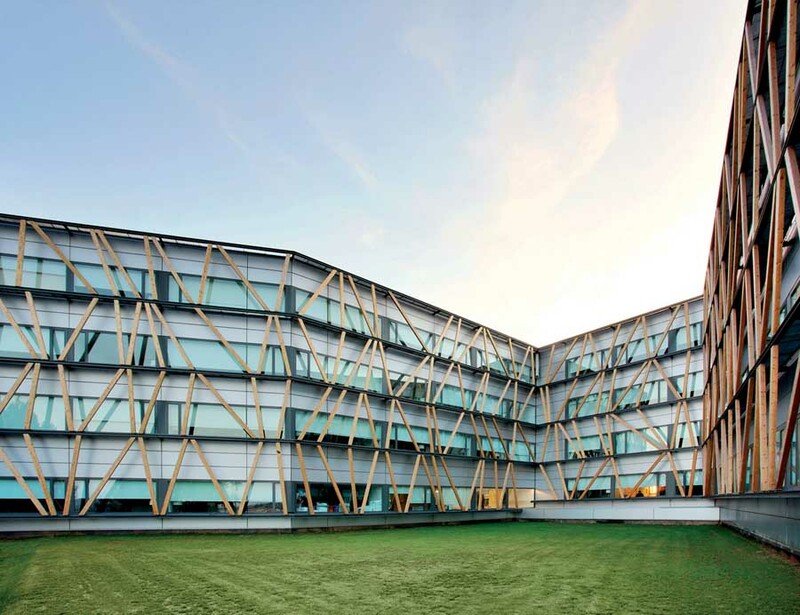 New Coca-Cola headquarters in Spain consisting of two buildings connected by an open vestibule, with glass facades that provide a double aspect view. 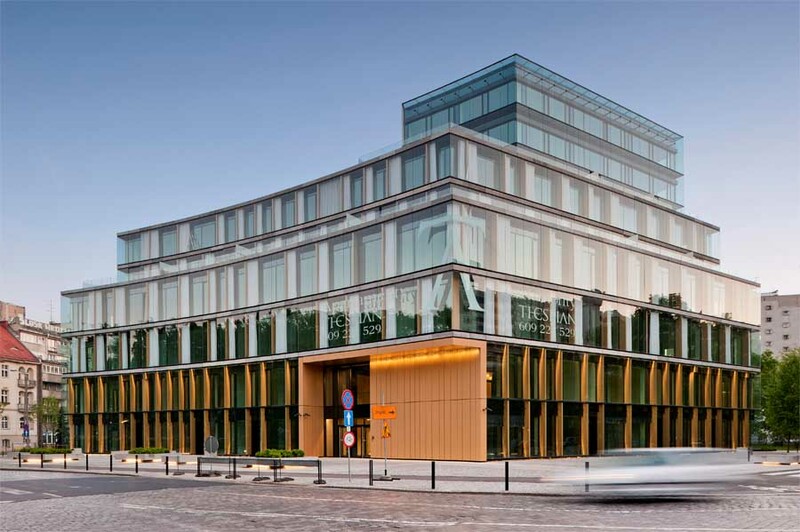 It obtained a Certificate Leed “Gold” for the Commercial Interiors – the first corporate headquarters to obtain it for the whole building. 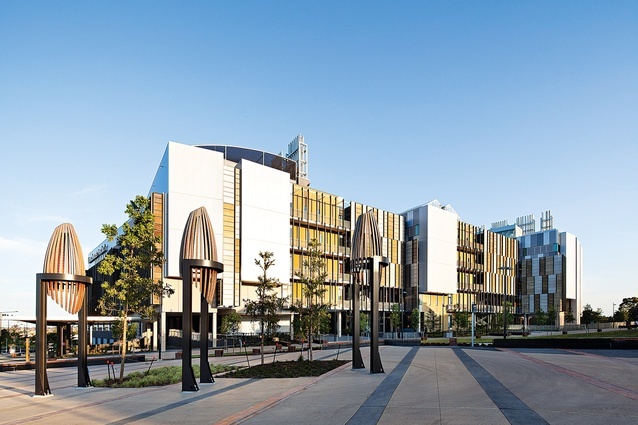 The Ecosciences Precinct brings together 1,000 scientists into a single, collaborative research environment and achieves significant innovation by creating a new facility without walls, encouraging knowledge exchange and discovery through shared spaces. 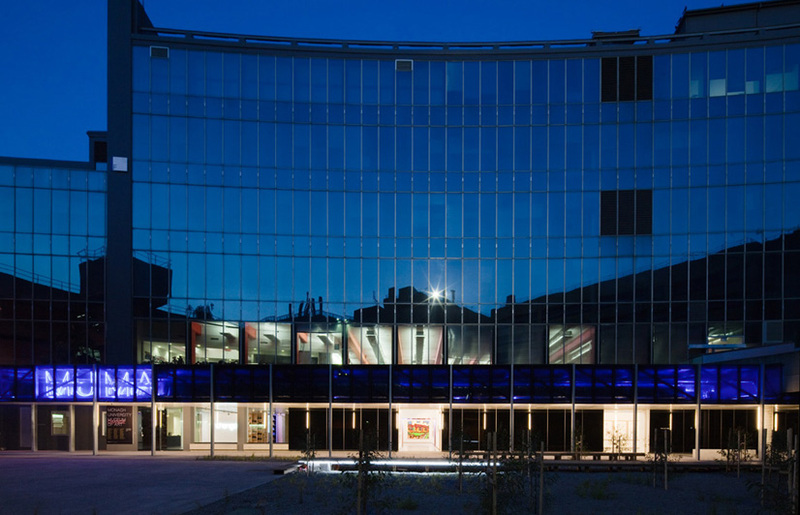 The transparency of the facade and the position of the work spaces were designed to focus onnearby Lake Zurich, whilst the sustainable concept follows the Swiss Mingerie eco-standard. 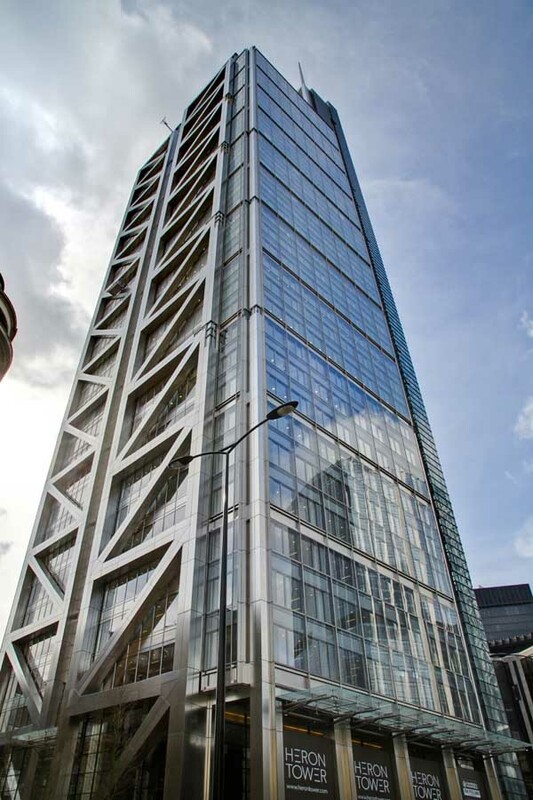 Also referred to as 110 Bishopsgate, Heron Tower is currently the tallest sky scraper in London’s financial district, which will feature a concierge-style entrance and reception area, incorporating a 70,000 litre aquarium with a shark and 1,300 other fish. 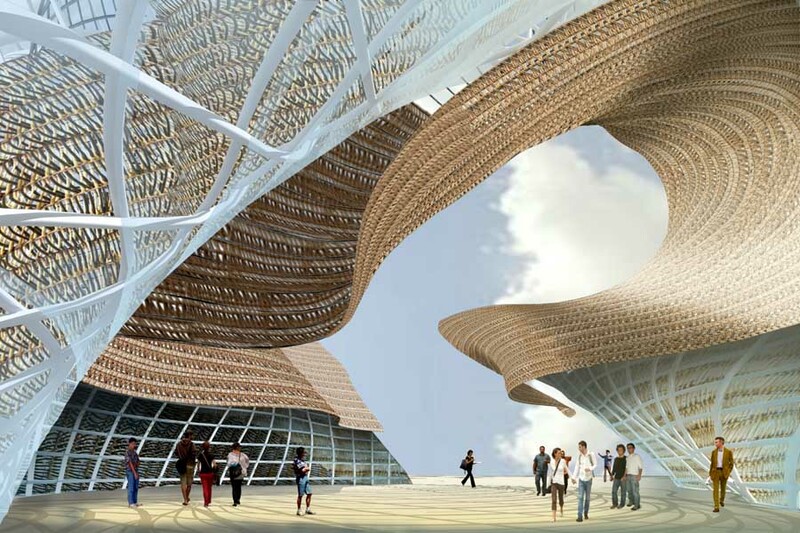 A zero energy office development, which uses a bamboo structure based on the design of a fisherman’s net in an effort to demonstrate the strength of bamboo as a viable modern building material. A new office extension to an existing building, reflecting the structures independent character whilst taking advantage of the surroundings. 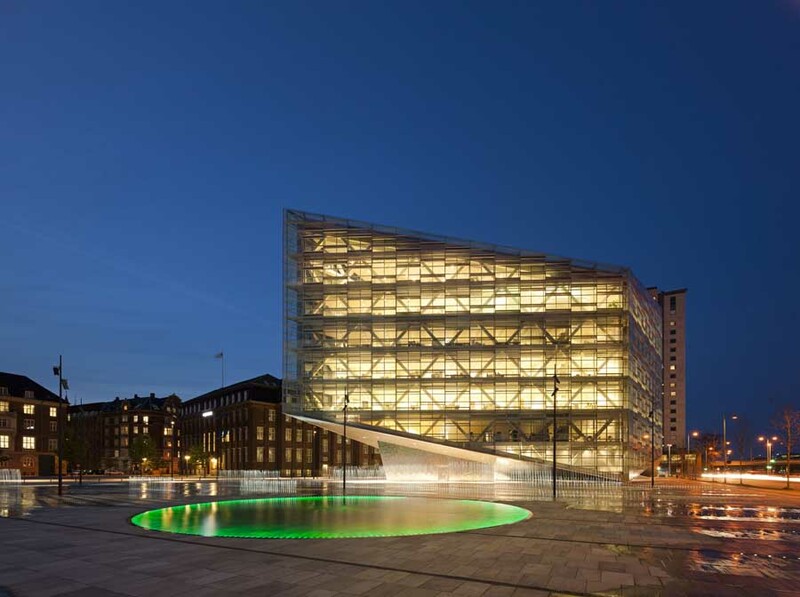 An extension to Danish mortgage bank Nykredit sited on the harbour front with a geometrical glazed form designed to float above the surrounding plaza. 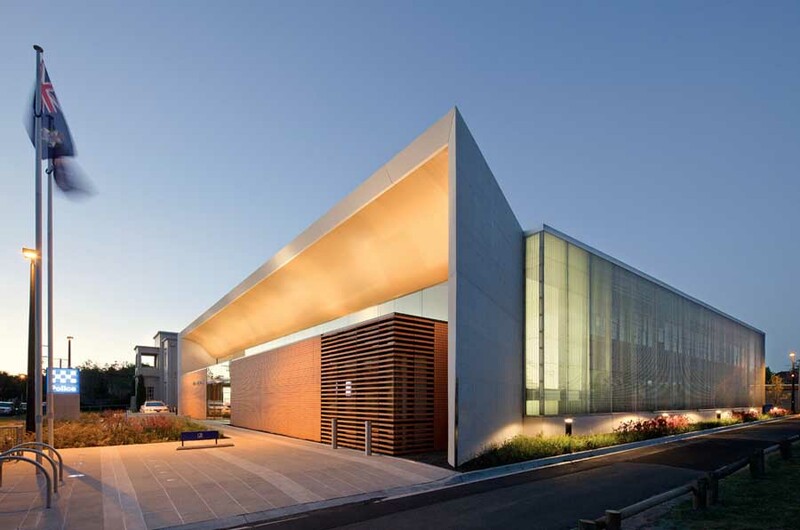 An architect’s office and a dental surgery, entered using a shared, double-height covered entrance.An absence of doors between the surgery and the garden helps relax patients. 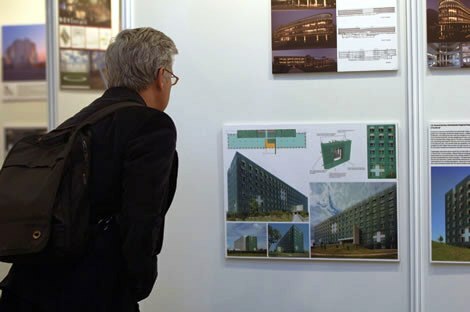 An office building located in the hub of a newly developed industry zone east of Taipei, which uses basic building materials such as concrete and wood, with the void of the building and a roof garden designed to bring nature back to the city. 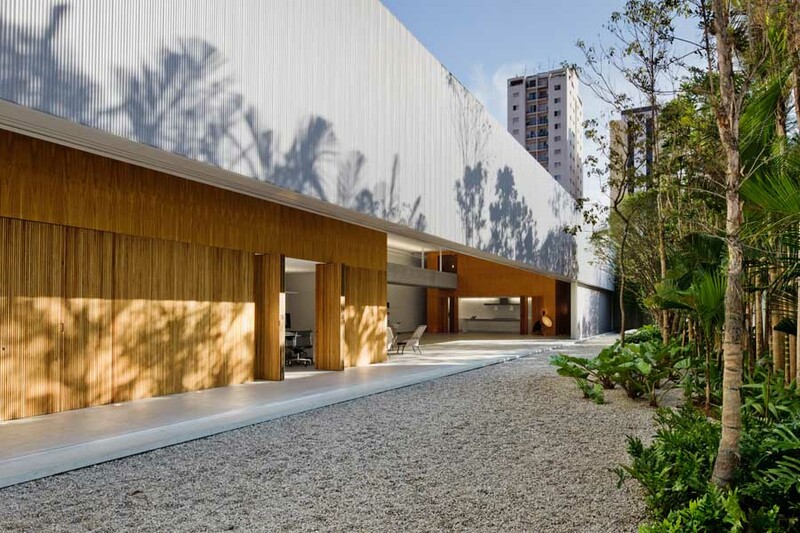 A photography studio that uses industrial materials and installations, combining elements of Brazilian architecture from the 30s to the 60s, along with aspects from contemporary Japanese architecture. 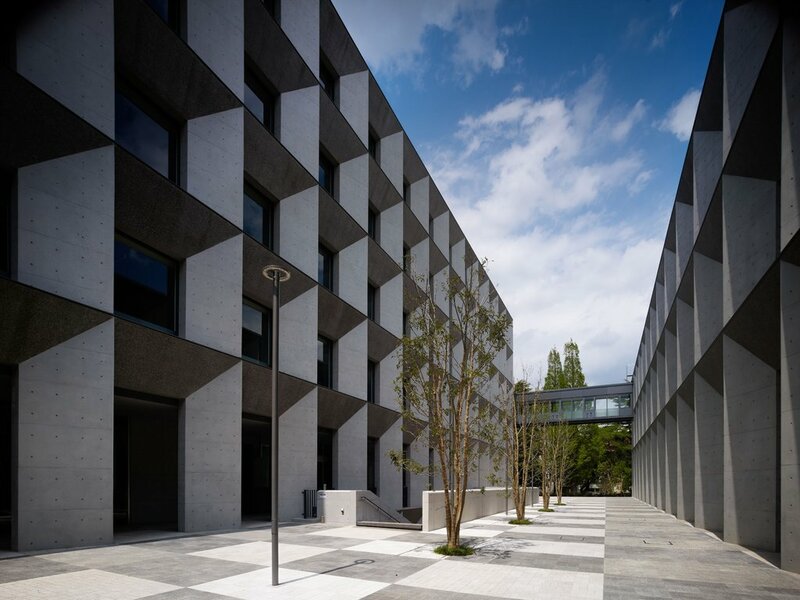 Low density office development, incorporating the use of off-shutter concrete and the introduction of a water element, conceived as a double volume container. 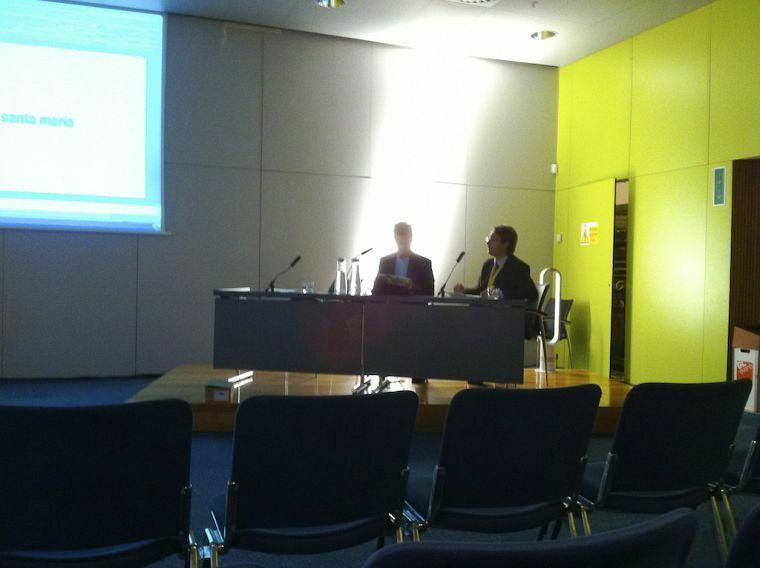 This facility consists of two large treatments at different levels, under one roof, which aims to integrate with the land. 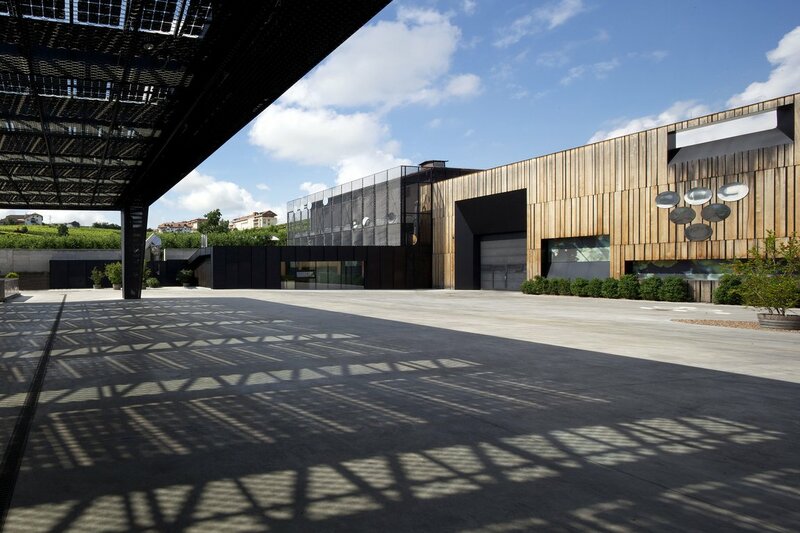 The facade of the building is comprised of layers of oak and steel, evoking the image of wine barrels. 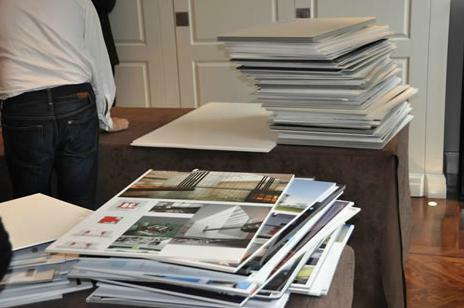 Printing facilities for national Kuwaiti newspaper Awan, with an open interior design that celebrates the printing process. 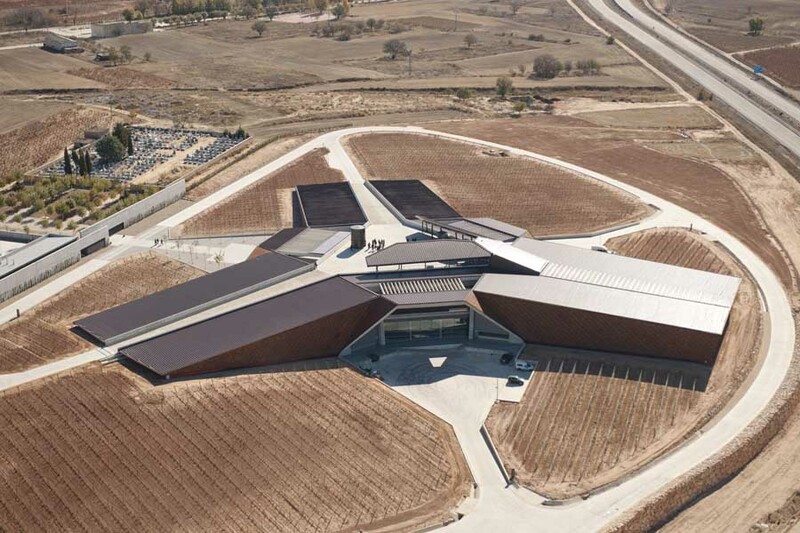 New winery for the Faustino Group designed so the topography of the site aids the wine-making process. 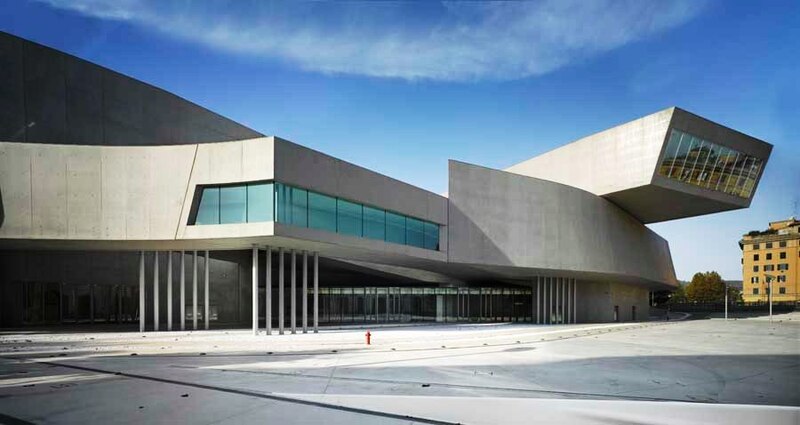 Consist of three main sections – offices, workshops and laboratories – which are all built at different heights to give the impression of the building rising ‘like a wave’. 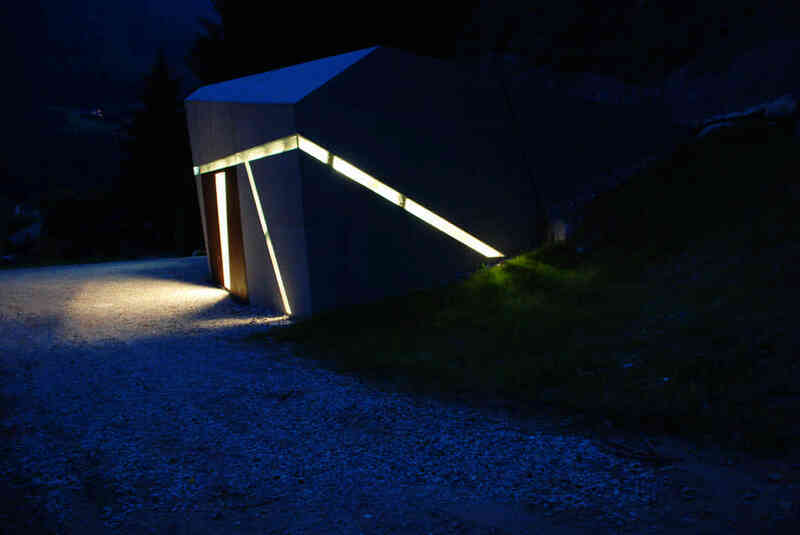 This power station is built into the slope, conceived to look like an ‘artificial rock’. 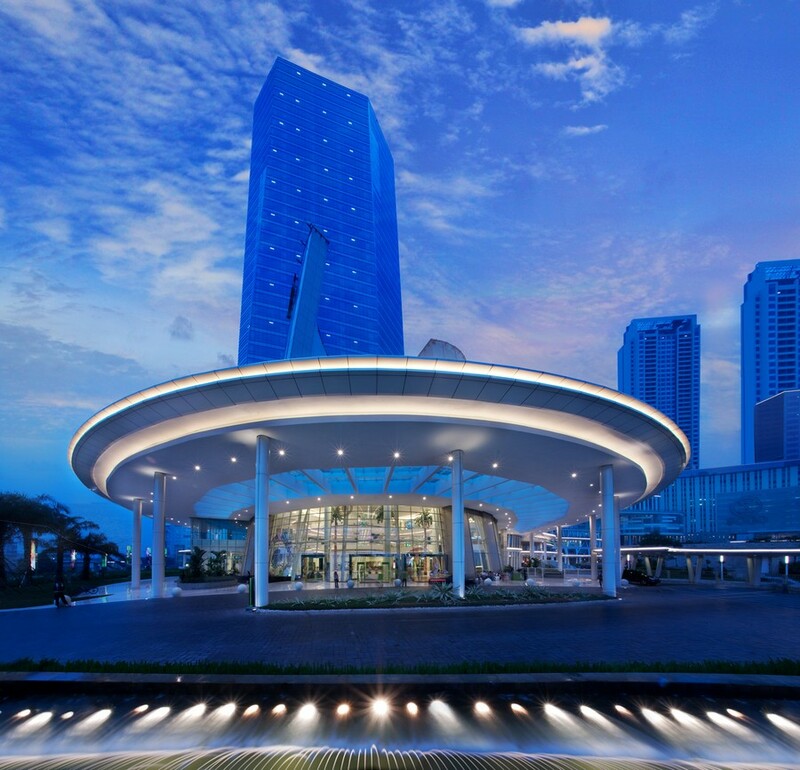 Central Park comprises of five components – a retail podium with a basement, a 40-storey office tower, a hotel, three identical 48-storey apartment towers and an open green park. 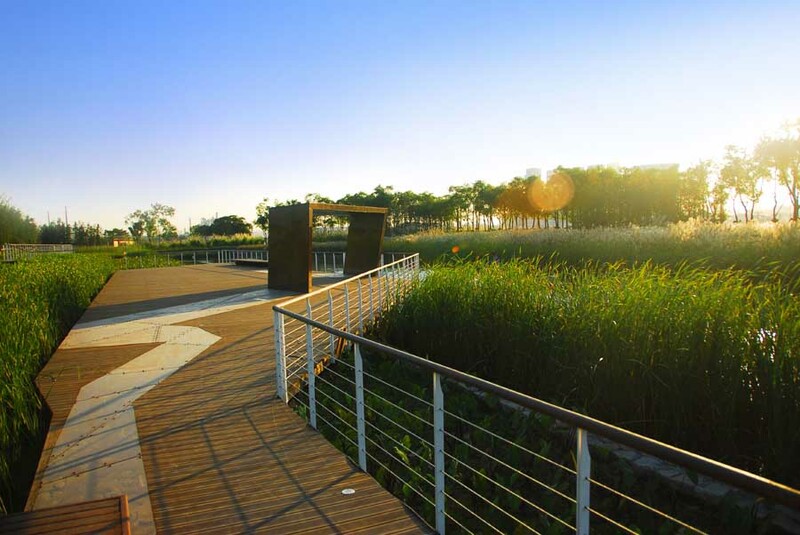 It is conceived as a gateway to its surrounding vicinity, whilst embracing calming green space. 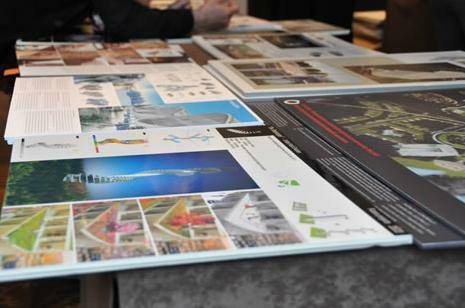 The extraordinary combination of trademarks, commercial concepts and cutting edge design succeed in creating a unique space that ues the architectural and commercial components to drive urban regeneration in the area. 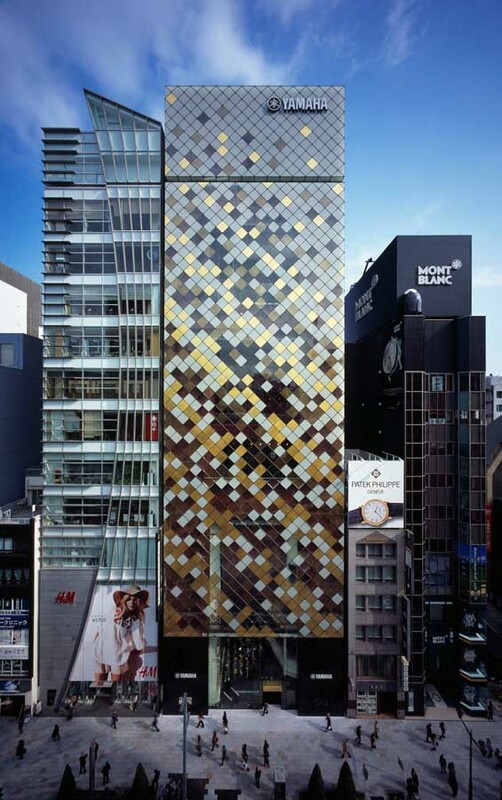 The most striking feature of Myer’s new face to the City, is its faceted gold roof which has been sculpted with gold metal and glass to choreograph certain city views. 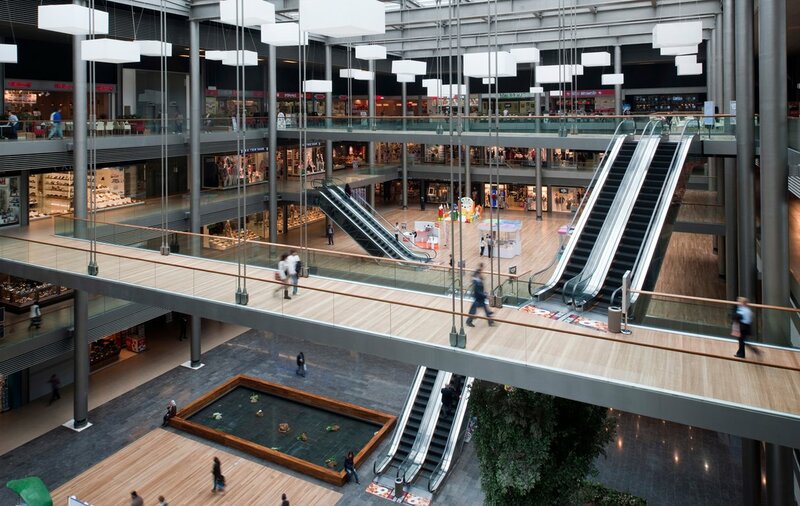 Many of the stores heritage features have been carefully restored. 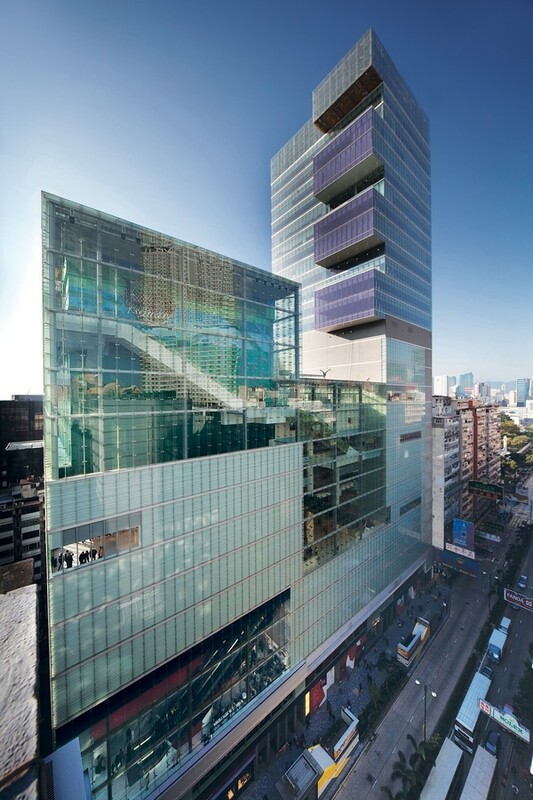 iSQUARE is that unique Hong Kong typology where retail activities are stacked up vertically to 24- storeys in one of Hong Kong’s glitziest commercial areas, with the retail experience extending up to the full height of the building via a series of sky-atria. 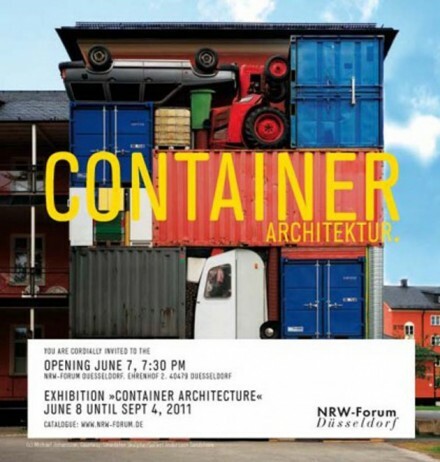 The construction of the Decameron furniture store showroom needed to be quick and economically viable, so the project worked with the premise of using light industrial elements, such as maritime transport containers, which could be easily assembled. 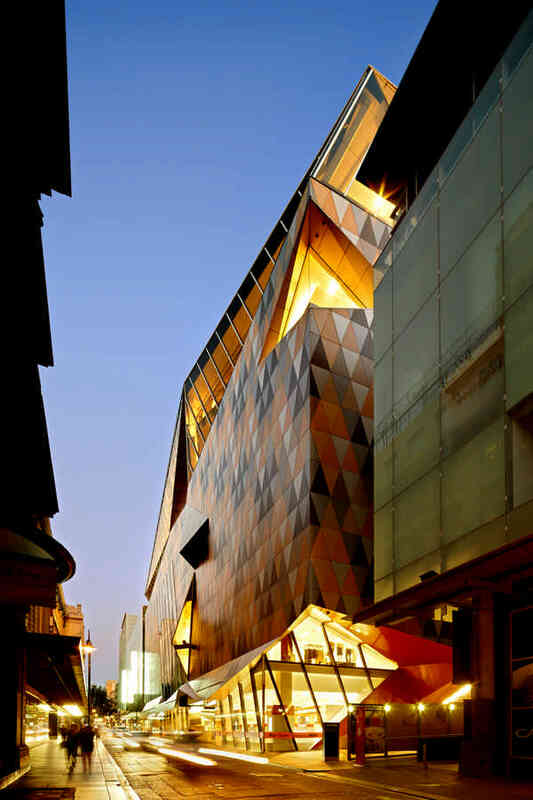 The five-storey ‘U’ shaped box design is made of elegant steel and glass, The projecting box accommodates cafes and restaurants, overlooking the cityscape and the E-5 streets. A street market is located in the sub-basement while in the front of the mall a broad public plaza hosts community activities. 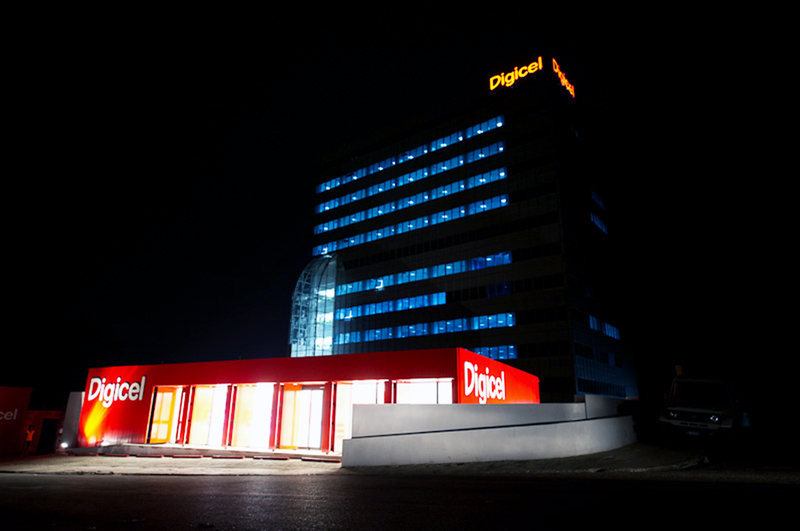 New Digicel Experience Store in the Haitian capital for a new innovative retail store, where design embodies the spirit of growth and regeneration and the technical design also had to meet a stringent brief to resist earthquakes and seasonal hurricanes. 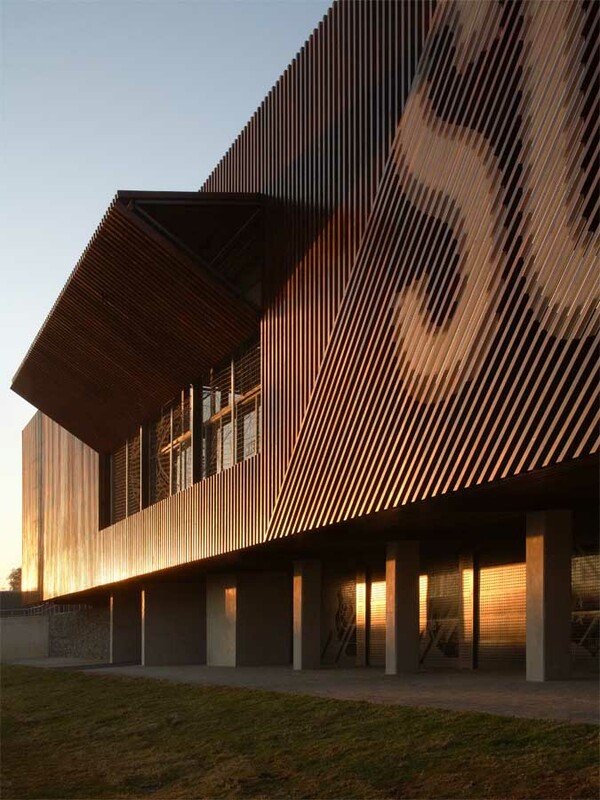 Located on a small island in the Hawkesbury River, the sports complex is naturally ventilated to stay cool in the summer and warm in the winter and collects rainwater for use on site. 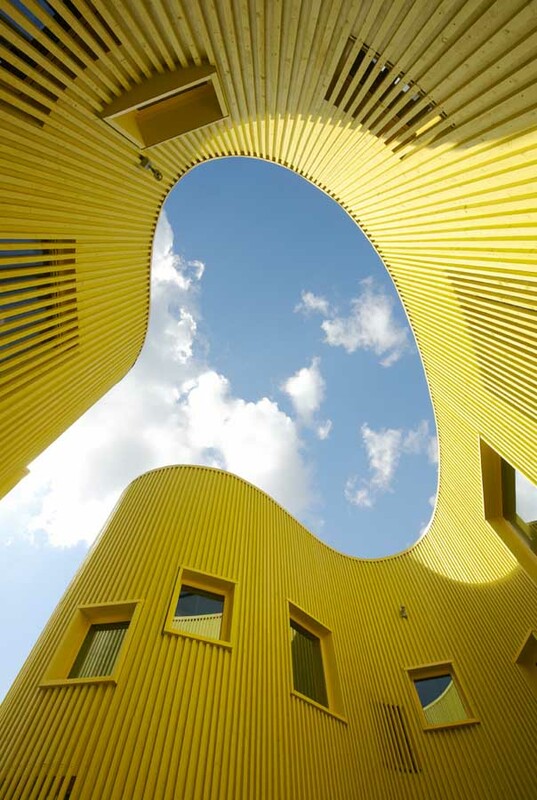 The curved design of the building exploits the plywoods properties and reduces structural weight by 30%. 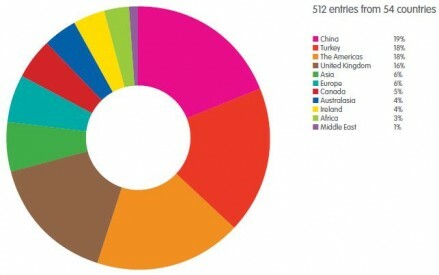 A 500-seat zero-carbon football stadium built to showcase technologies to be used in the World Cup 2022. 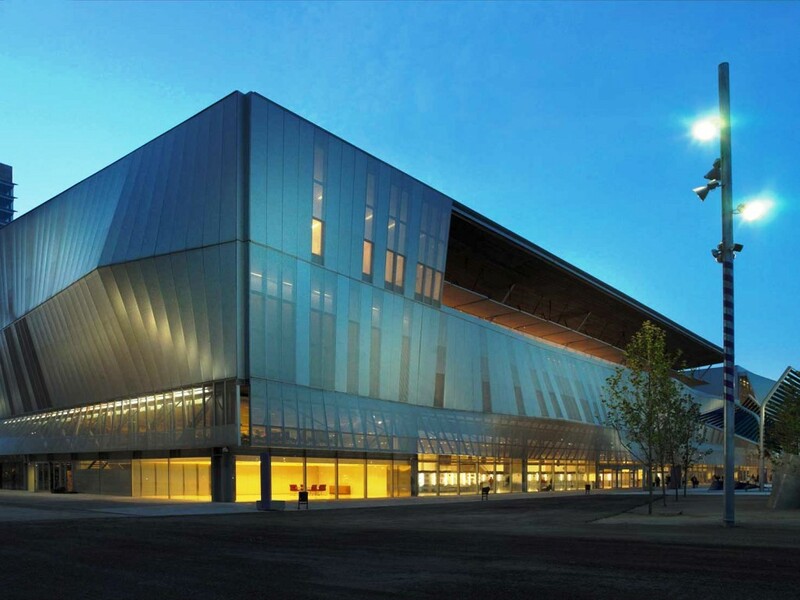 A specially designed roof rotates around the stadium in 14 and a half minutes to provide cooling shade within the building. 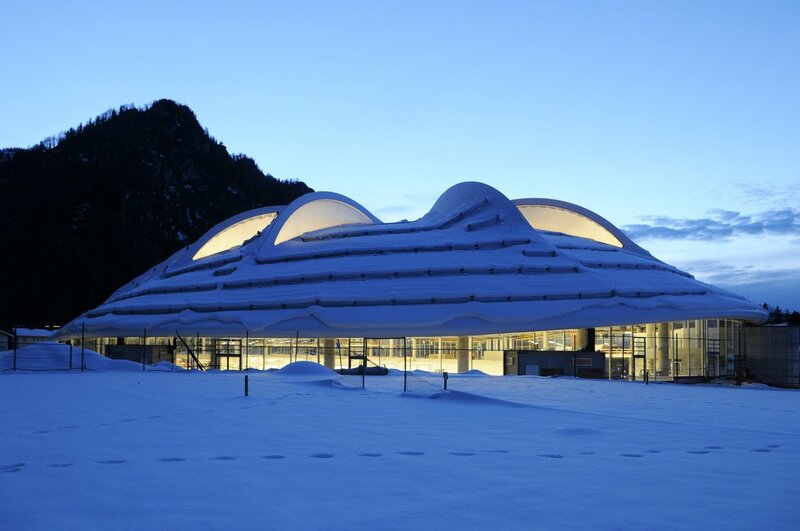 Intelligent roof free of interior columns, built over pre-existing speed-skating track, which allows athletes and spectators continuous panoramic views over the Bavarian Alps. 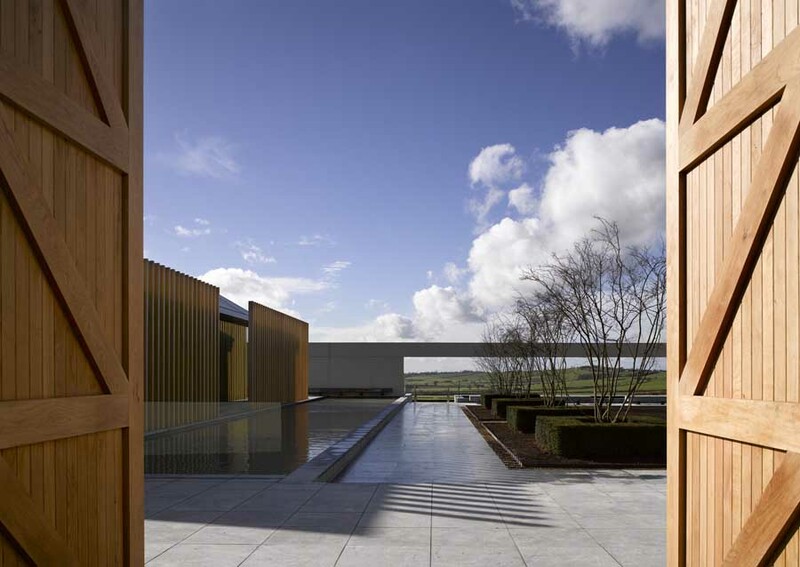 The sports complex includes two heated indoor pools that provide views across the surrounding landscape whilst using natural light to illuminate the pool from above. 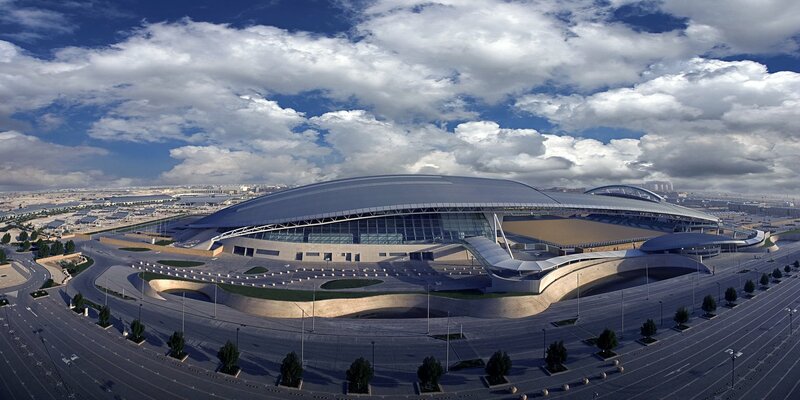 Offering panoramic views of the clouds, mountains and plains surrounding the ancient city in Iran, the sports hall was designed to ensure connection with the external environment for all those using the facility. 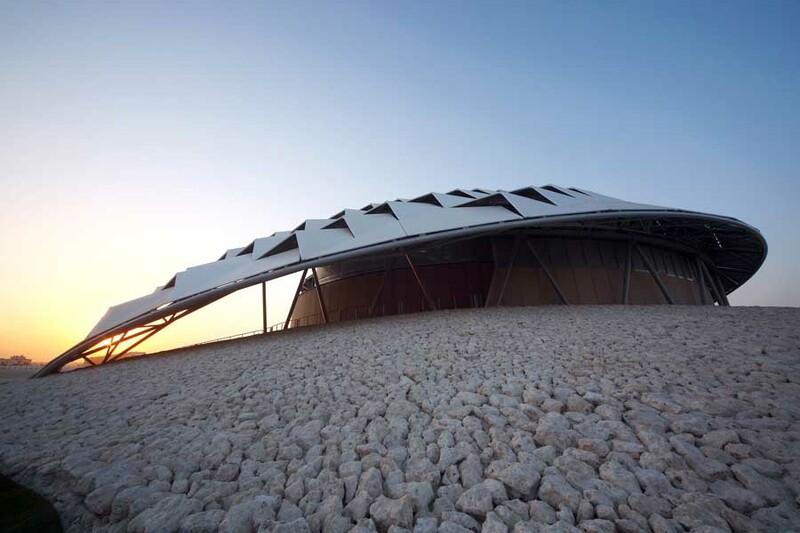 Designed to represent a traditional desert tent, the vast roof covers a warm up area, an indoor arena and an outdoor arena at this equestrian arena. 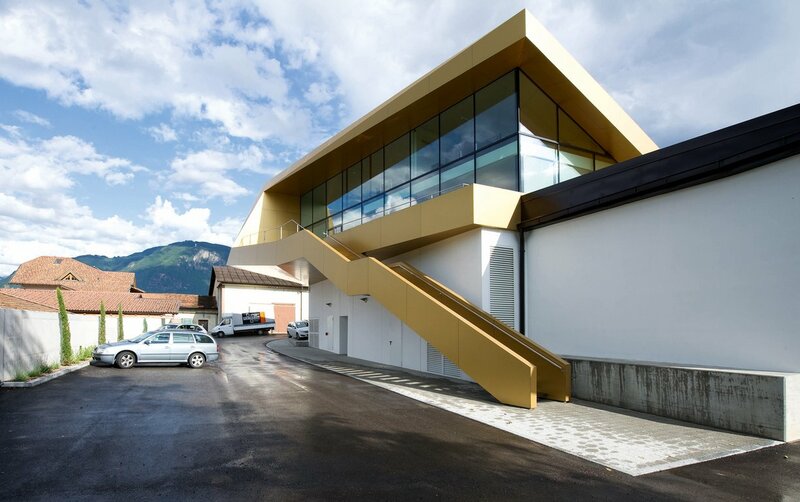 The only sports facility in the city, the building was designed with full height openings to allow views across the hill the facility is built on. 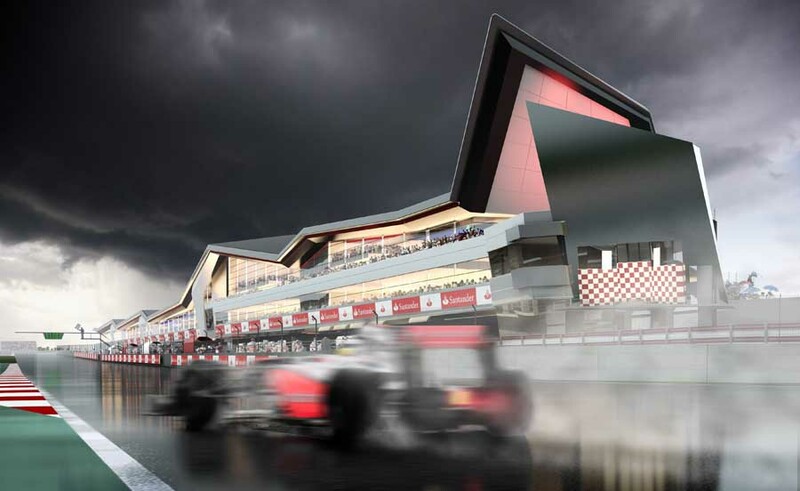 A new 360 metre long pit, paddock and conference building that spans the length of the new pit lane at Silverstone Circuit. 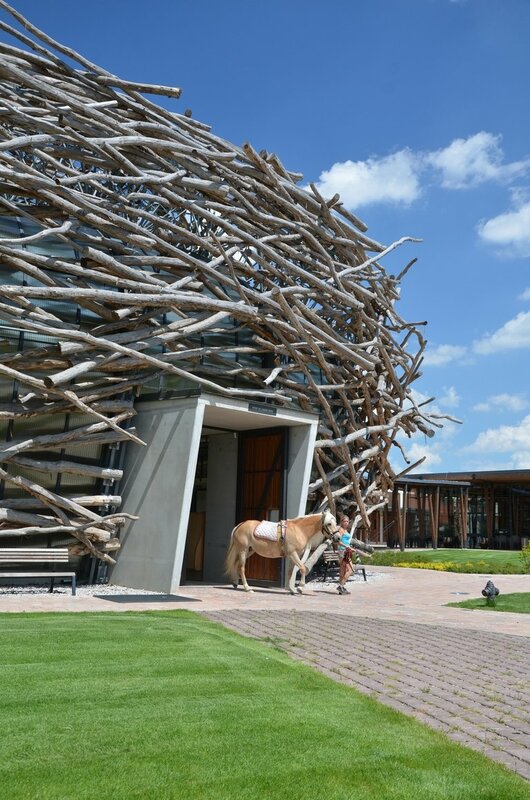 Based on a storks nest, this riding arena was designed as symbol between man and animal. 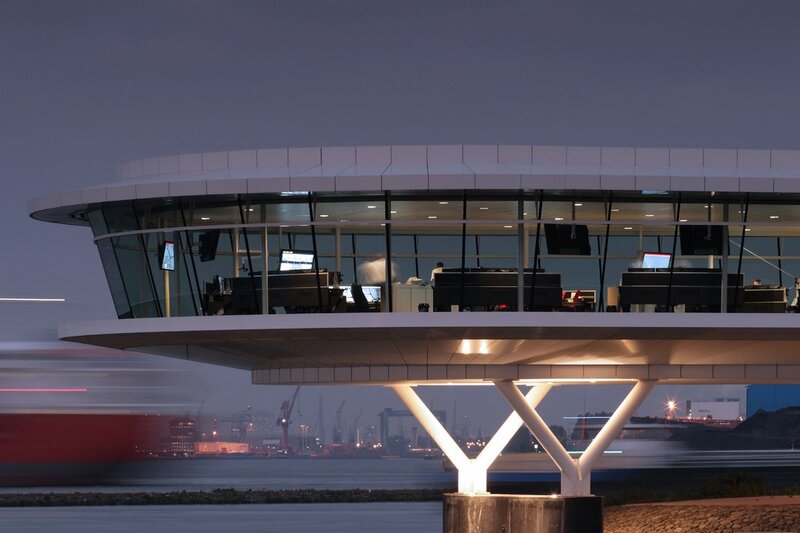 Built from concrete discs interspaced with box shape volumes the traffic control centre achieves a floating appearance in the Port of Rotterdam, located at the crossroad of The Old and New Meuse Rivers. 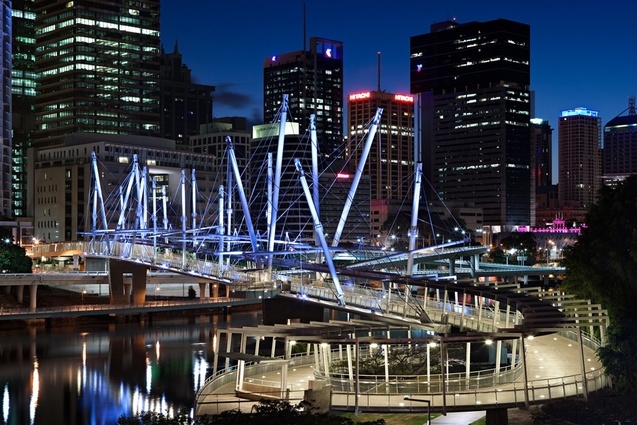 Kurilpa Bridge provides a new pedestrian and cycle connection across Brisbane’s river but also forms a new public space, as well as a symbol for art, science, technology and healthy living. 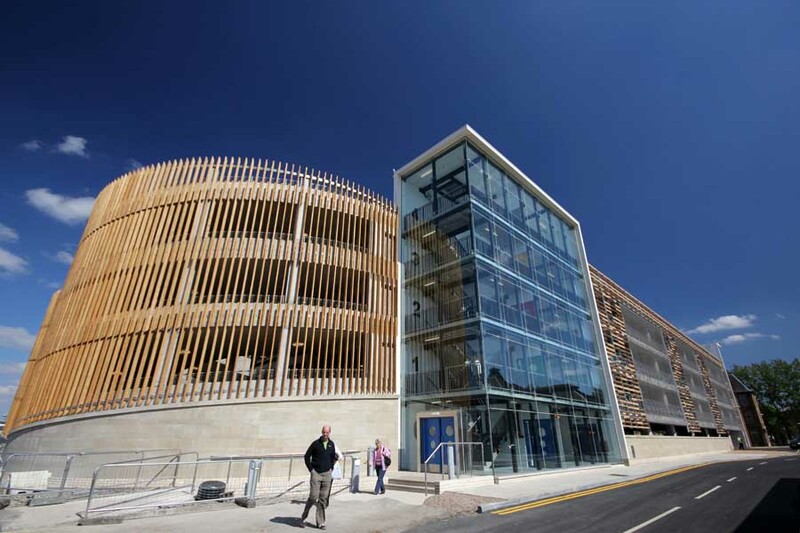 The first of four car parks, with a sympathetic design to the B-Listed Central Medical Block, the car park uses natural sandstone and timber panelling to provide a please facade. 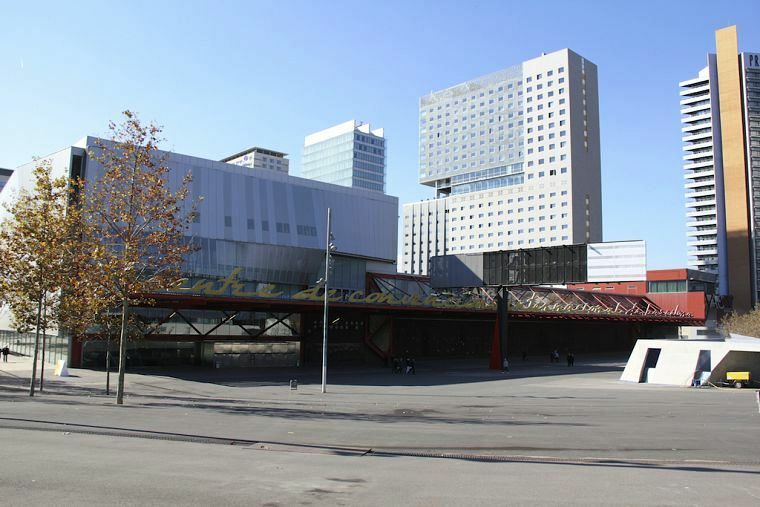 Four independent buildings arranged around a the four corners of a site, linked by a footbridge at the diagonal corners. 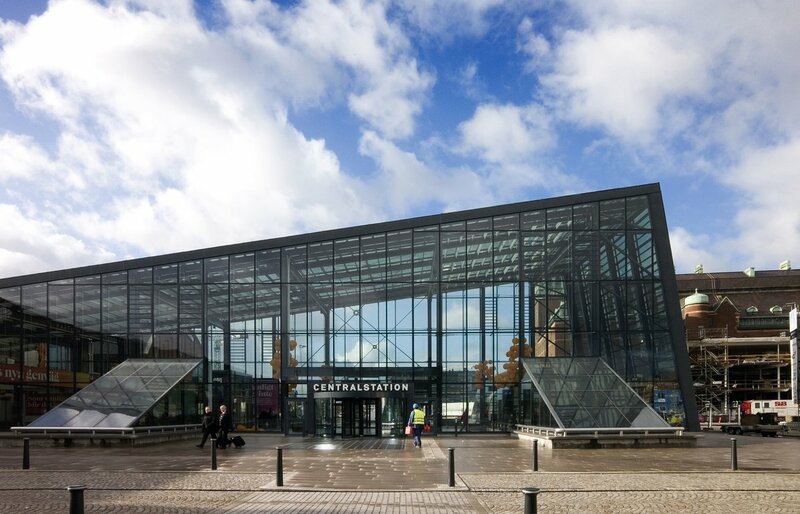 A new arrivals hall constructed almost entirely of glass, which also acts to open up the facade to the historic railway hall for the first time in its 150 year hospital. 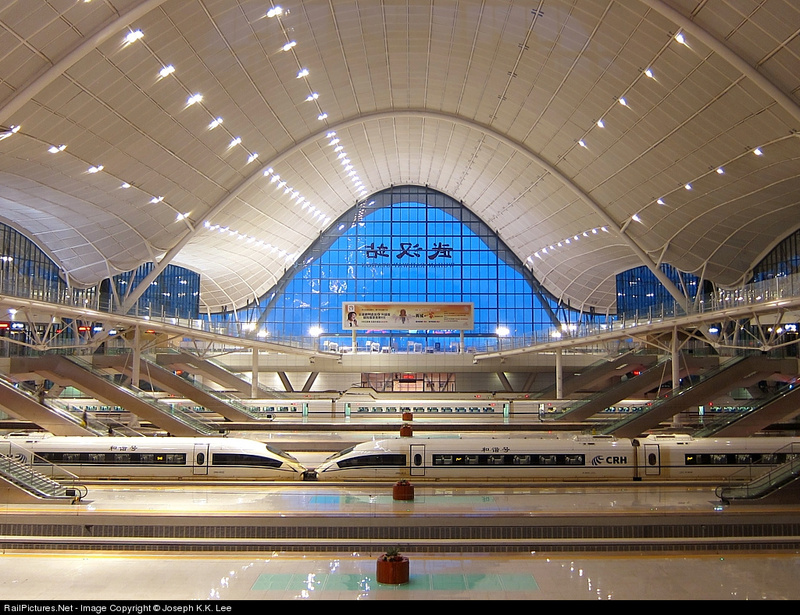 The station, which is three times the size of King’s Cross Station, includes 28 high-speed rail platforms and a 348 metre skylight which splits the station in two. Part of the route around the Gulf South Shore connecting the three Emirates together, Sheikh Zayed Bridge is critical in the development and completion of the highway system. 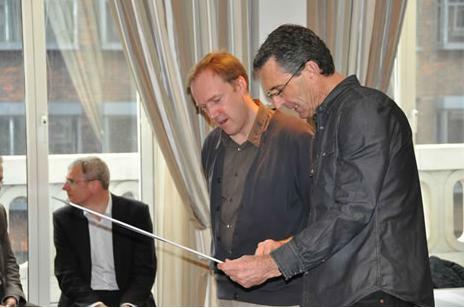 A sinusoidal waveform provides the structural silhouette shape across the channel and rises to a height of 60 metres above the water.